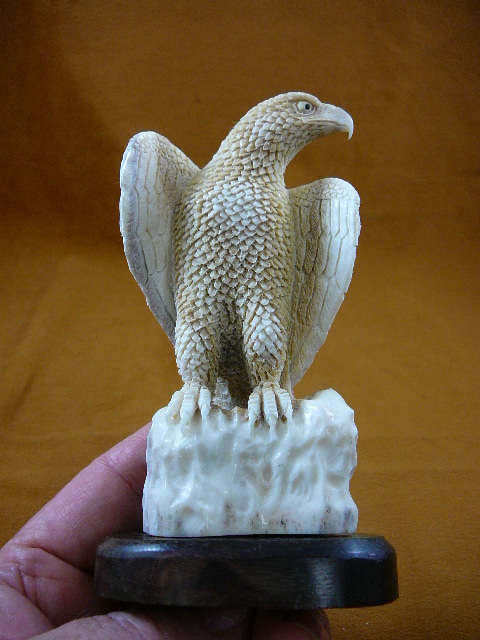 Wayan started out as an apprentice to his father doing silversmithing. 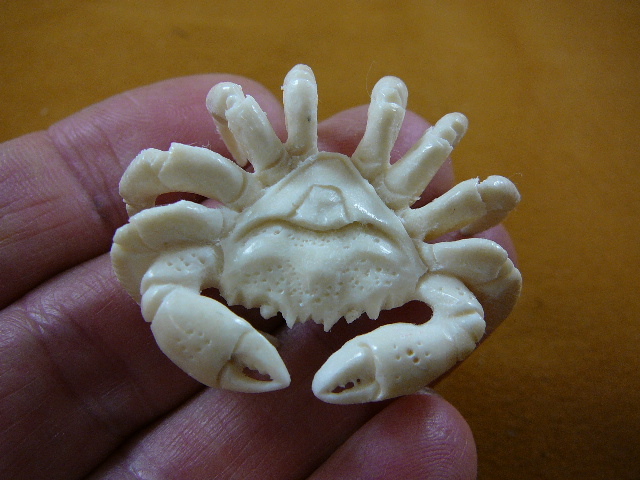 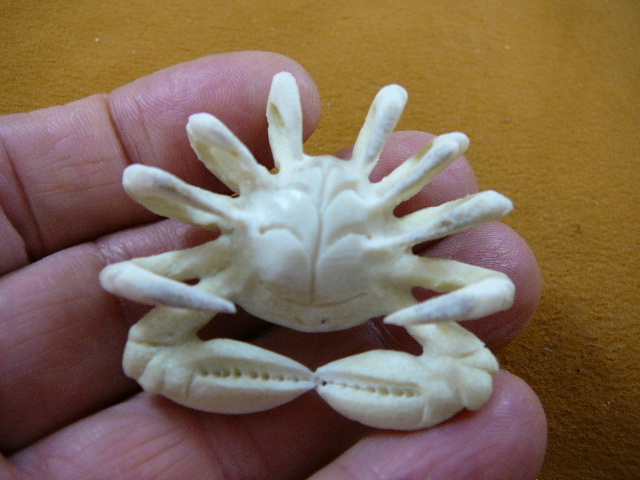 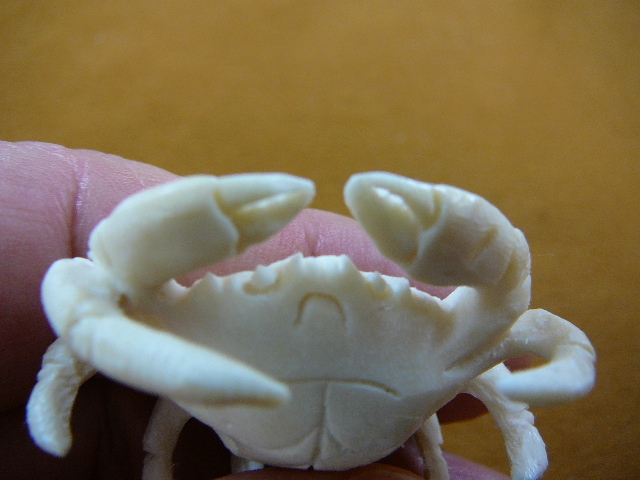 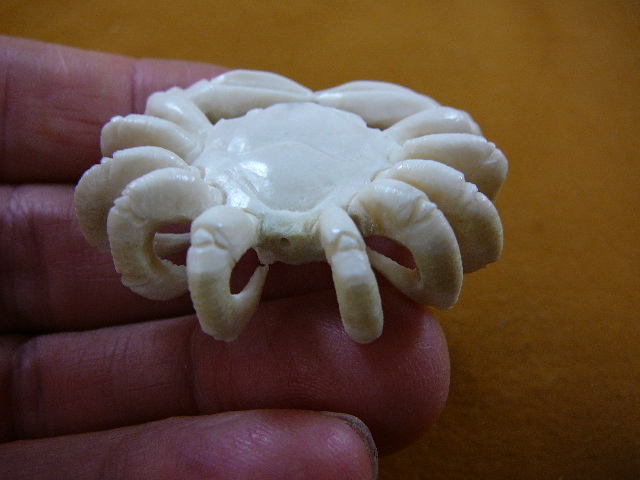 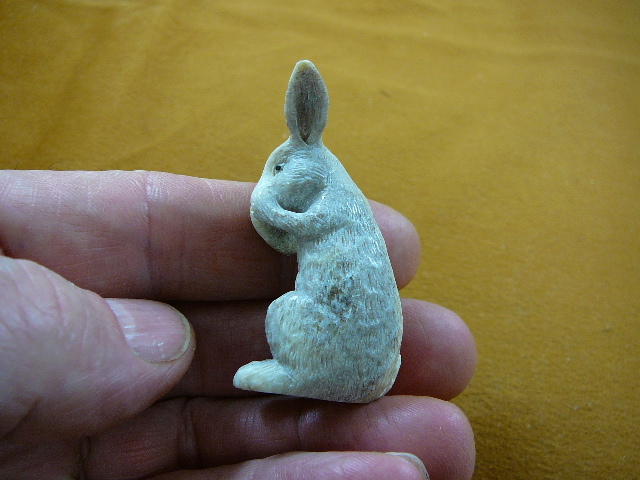 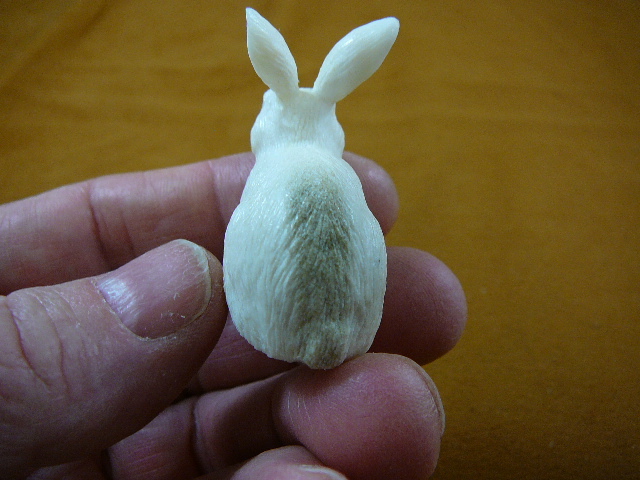 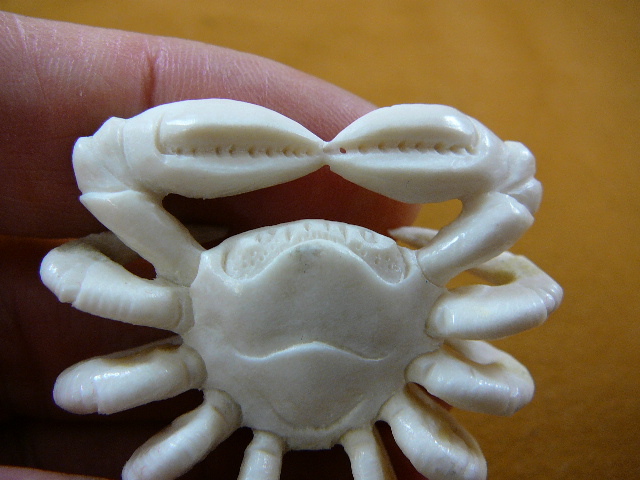 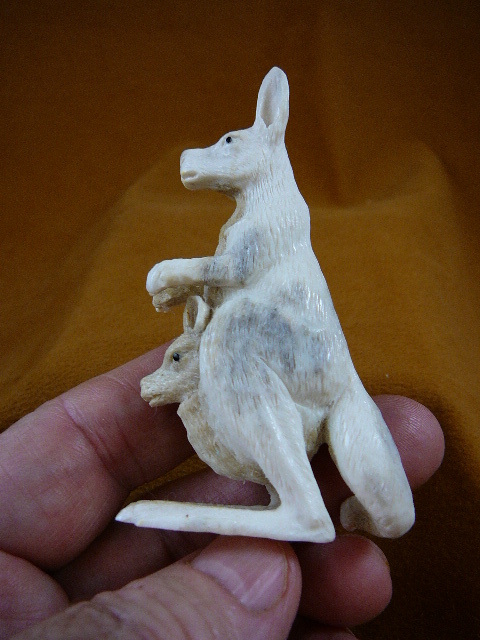 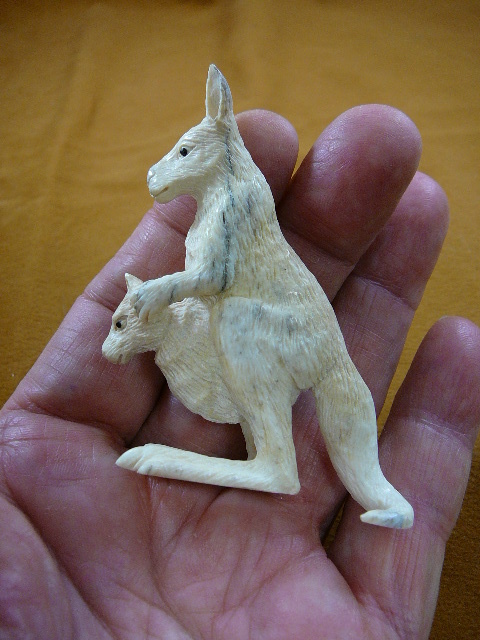 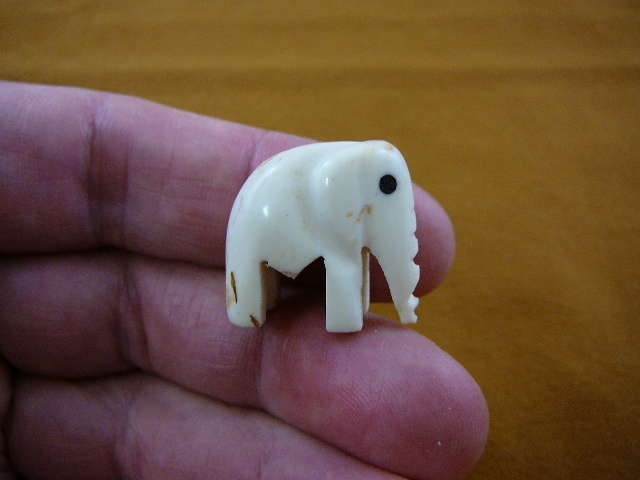 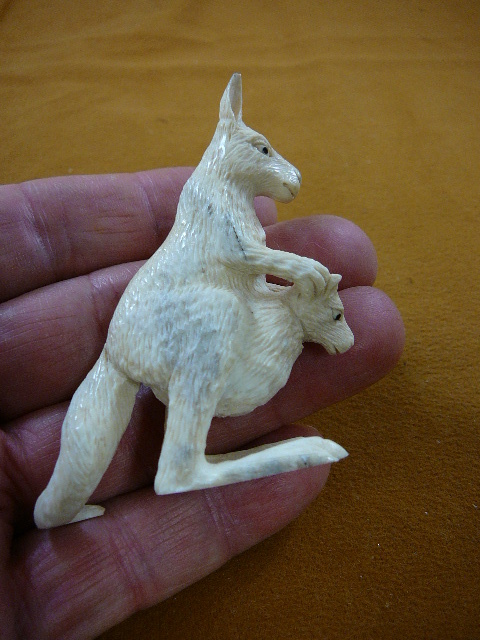 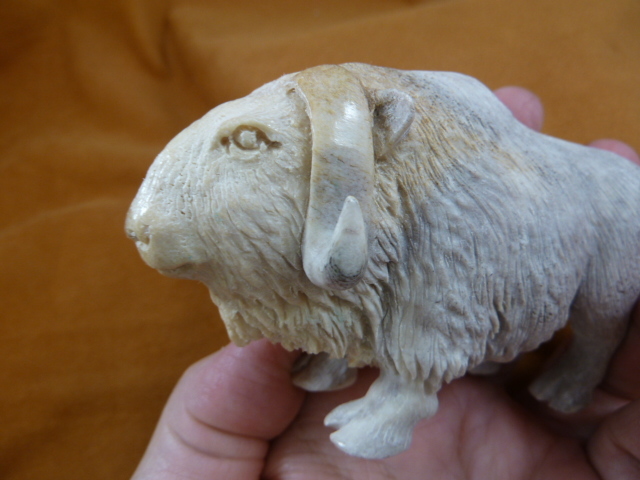 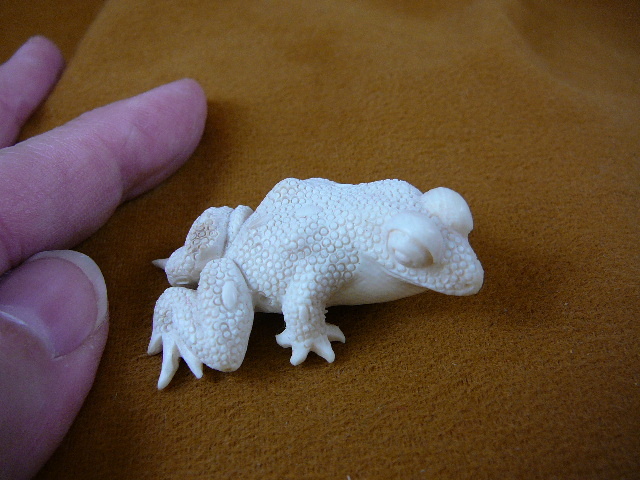 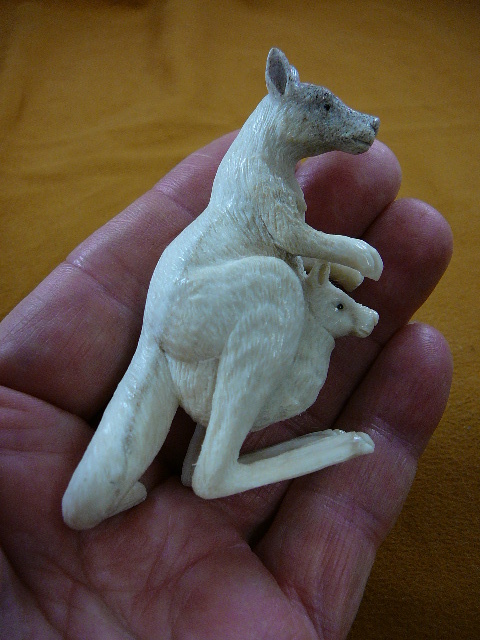 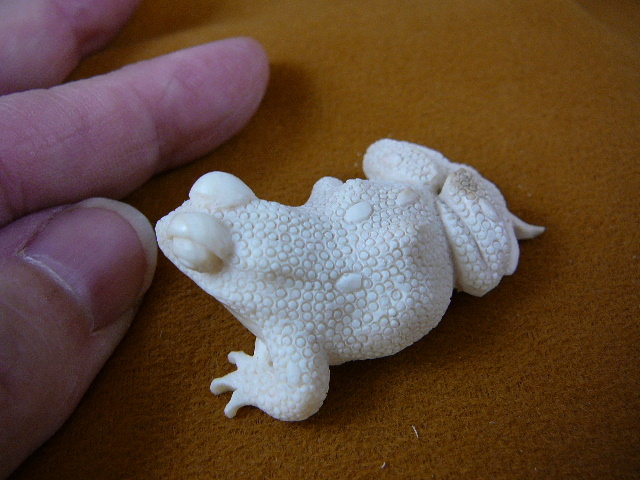 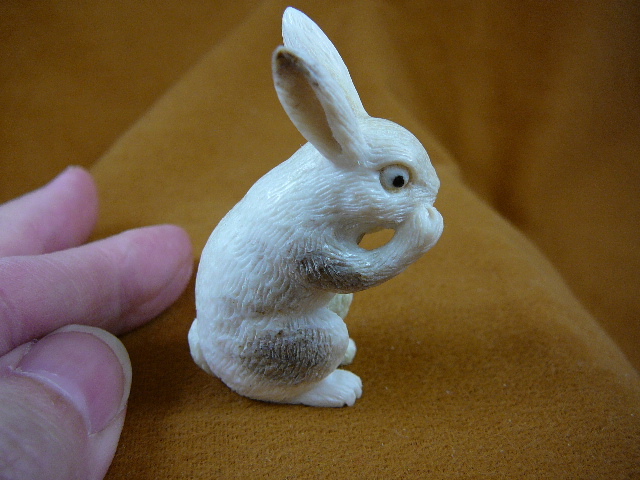 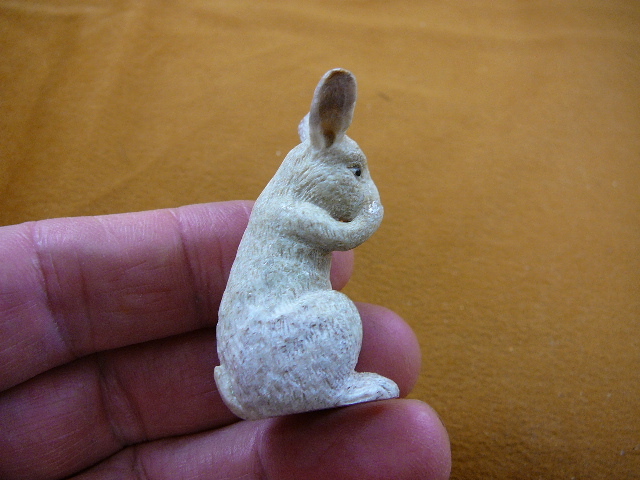 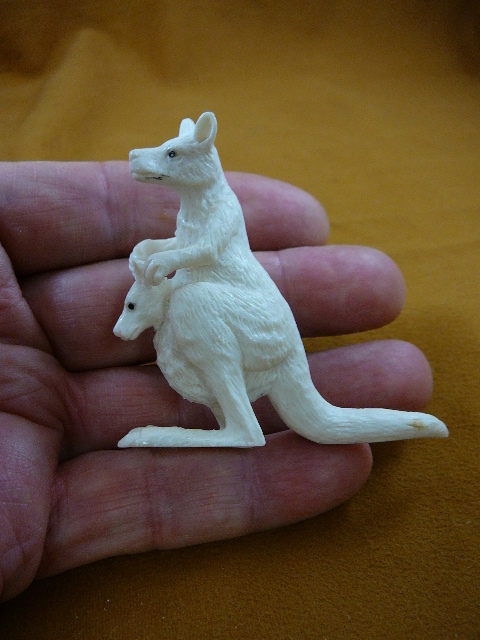 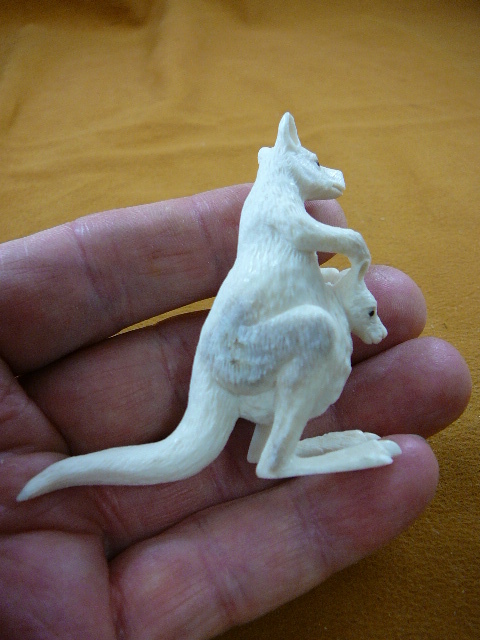 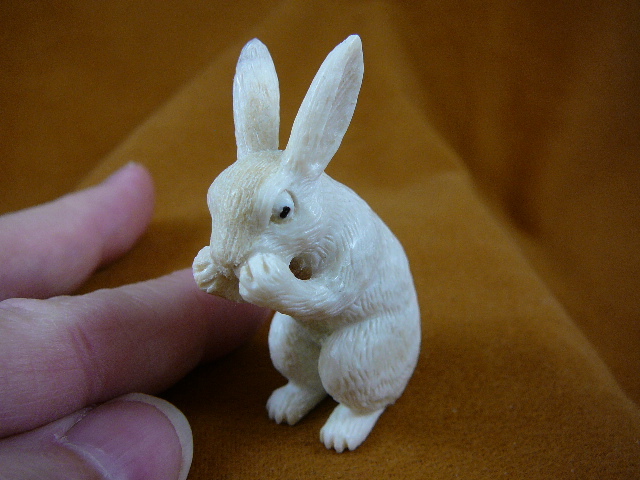 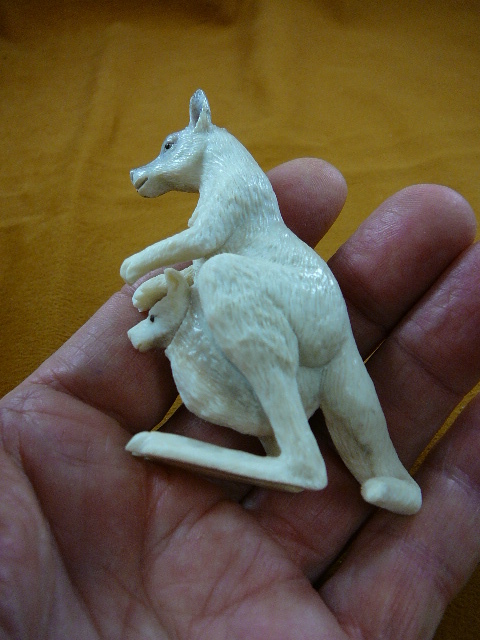 But he developed a love for working with natural animal products such as antler, mammoth ivory, tagua nut and cow bone. 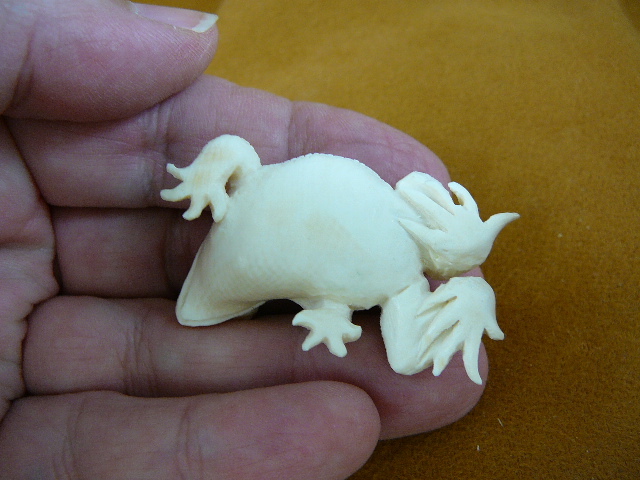 So he pursued his skills using those mediums to a high art form. 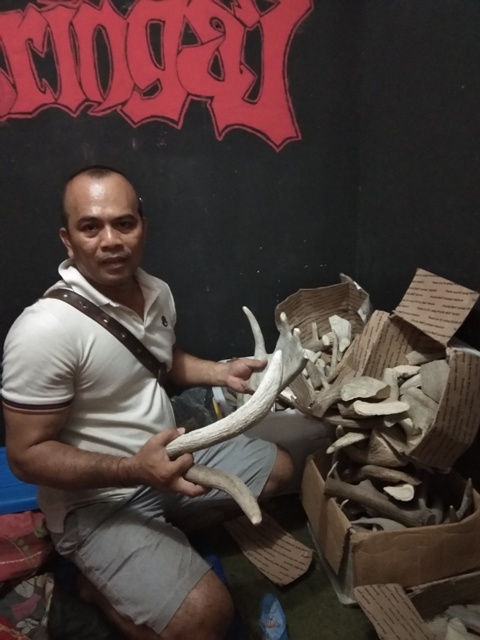 We met Wayan in 2016 and toured his studio, placed our first order, and he has become like a son to us ever since. 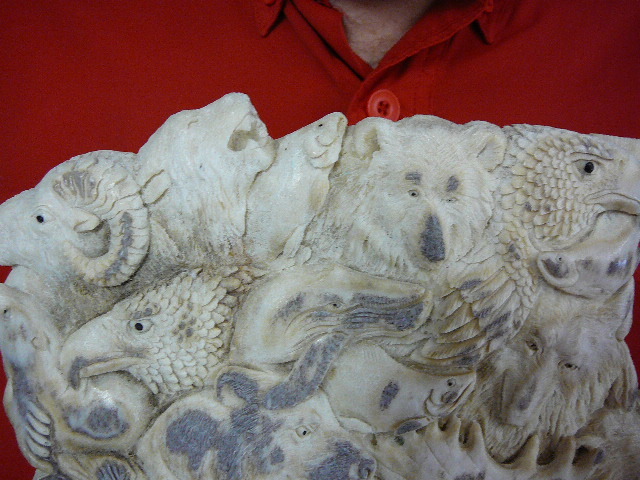 Above is a photo of Wayan (left) and Glenn (right). 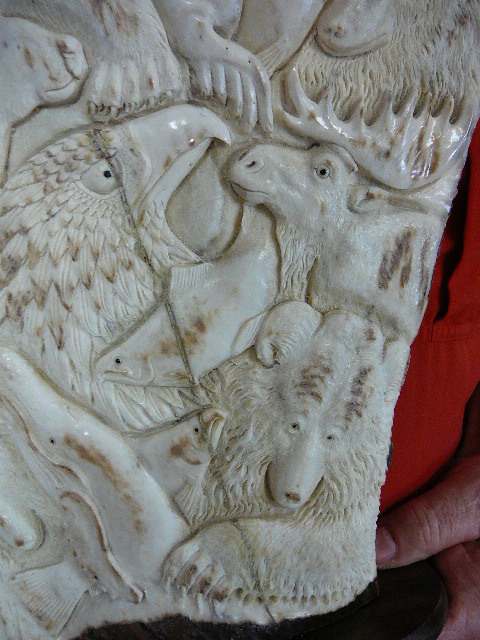 Many of the carvings you see on these pages are his work (they are marked with “Wayan”). 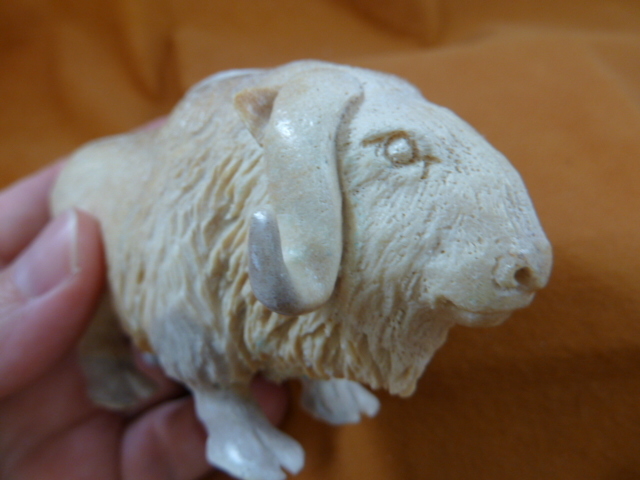 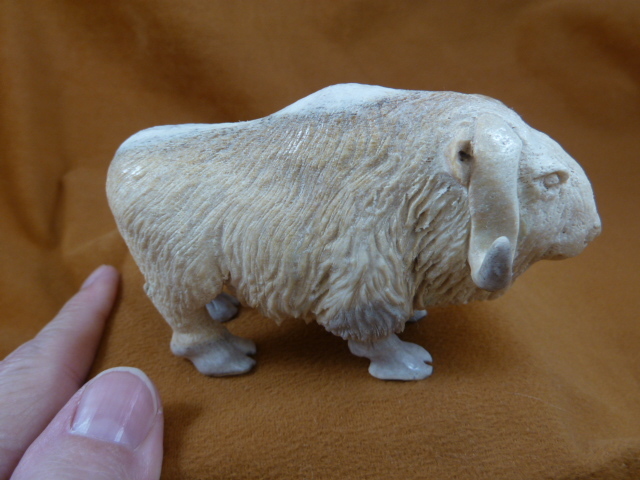 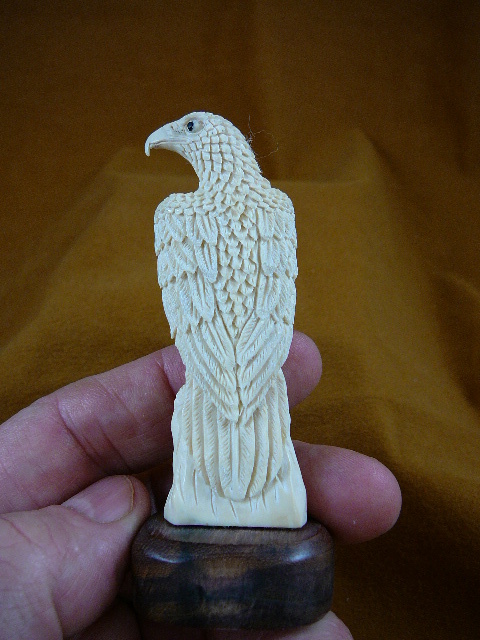 When you buy one of his carvings, you will receive a biography info card with the piece. 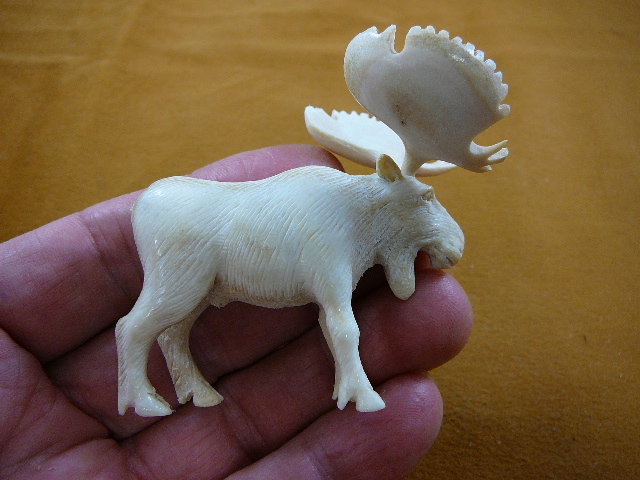 We sent him a couple hundred pounds of premium moose antler from Maine to work with, out of a 600 pound stash we acquired from a retired artist. 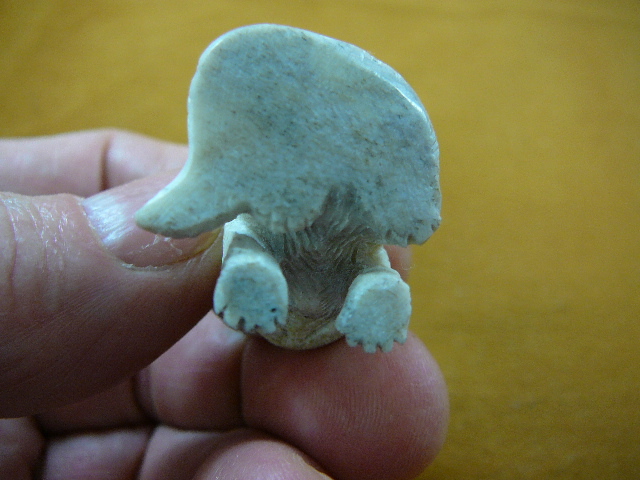 We also sent him 100 pounds of mammoth ivory from Siberia. 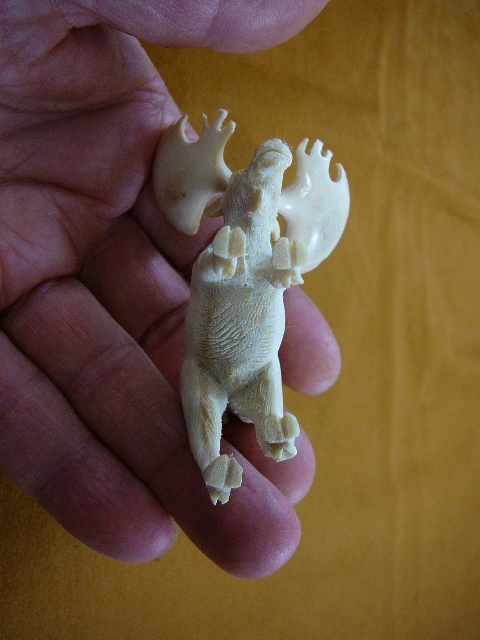 Here is Wayan with some of the moose antler he is working with. 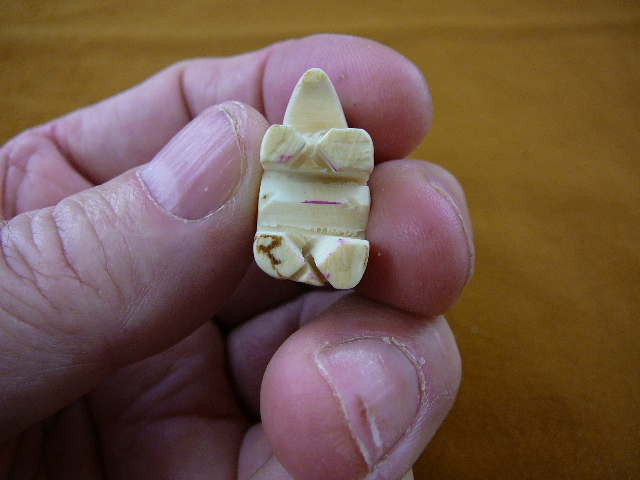 WAYAN'S MOOSE ANTLER AND MAMMOTH IVORY CARVINGS ARE ON THESE PAGES. 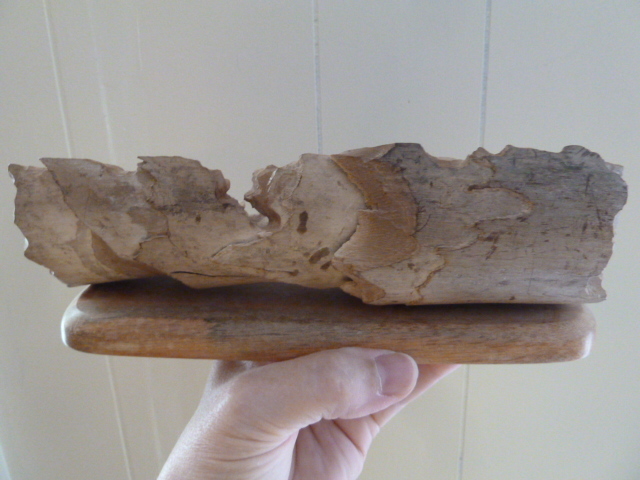 Large piece of moose antler, on wood base. 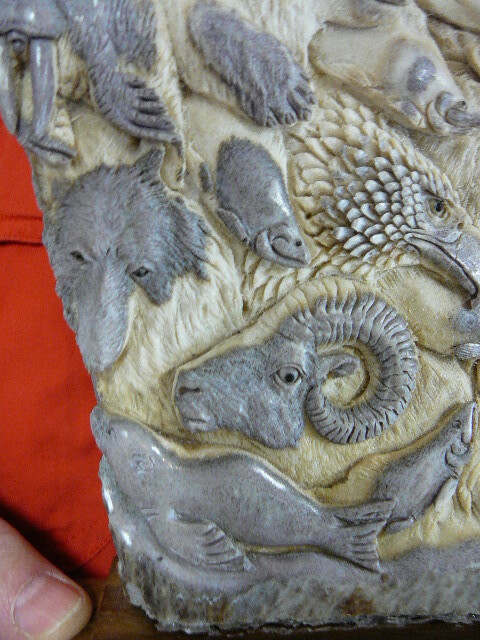 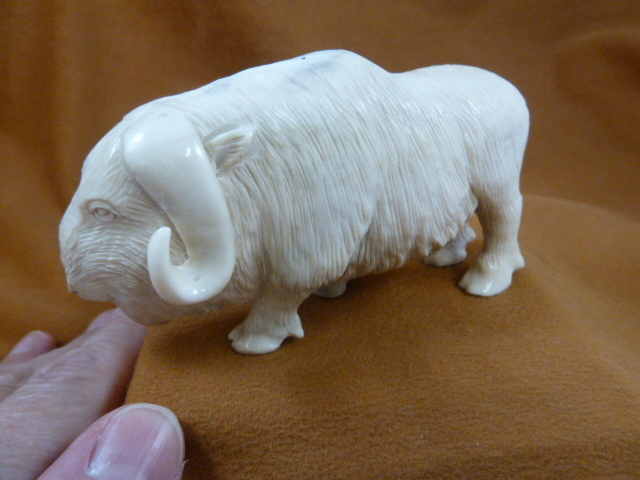 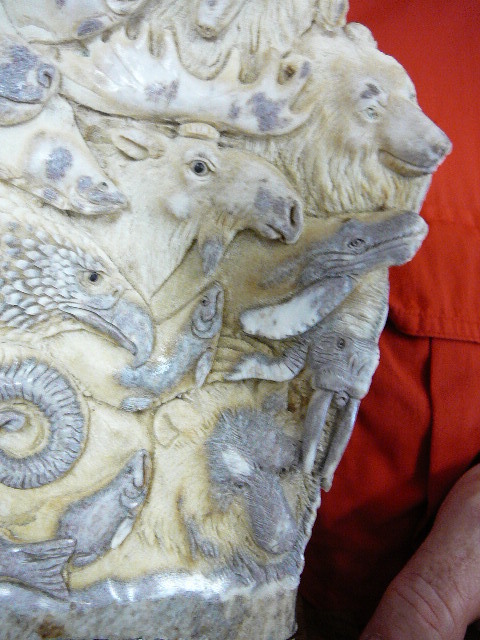 Detailed carving of multiple carvings of heads of Dall sheep ram, wolf, salmon, bear, eagle, seal, humpback whale, walrus, moose. 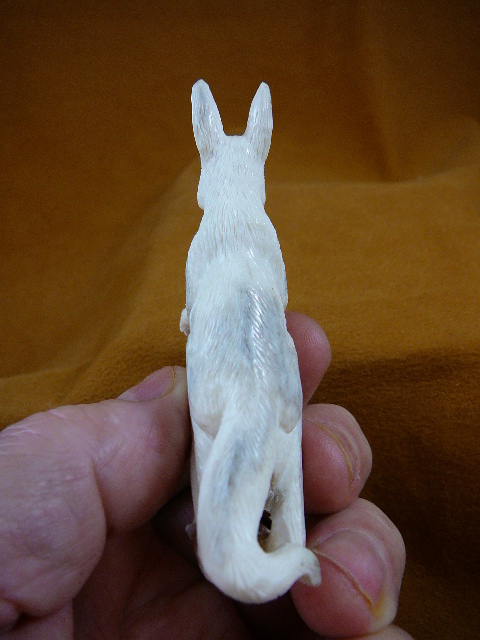 Full measurement is 10" tall x 8" widest x 3-1/4" deep. 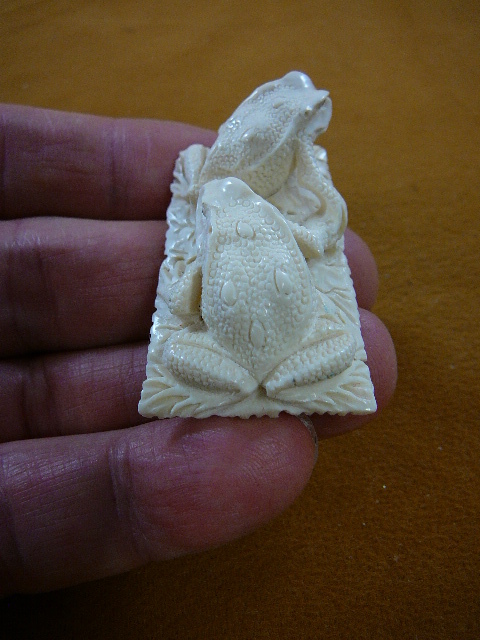 Carving itself is 9-1/2" tall x 8" wide x 7/8" thickest. 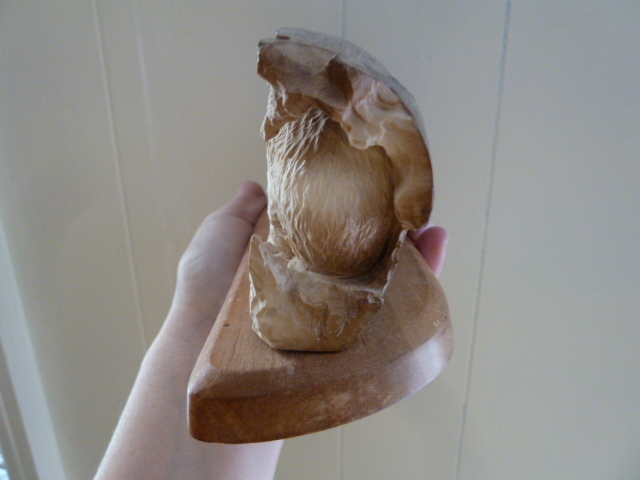 Weighs 1 lb 3 oz. 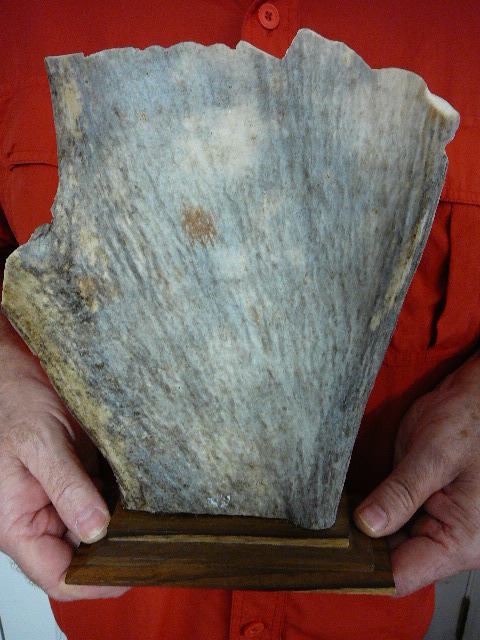 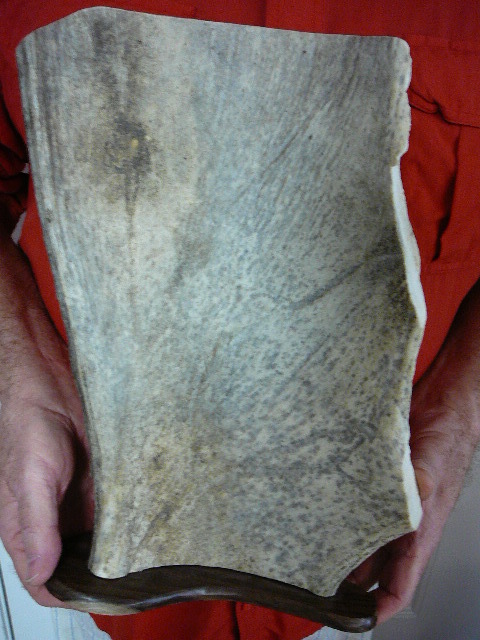 Largest piece of moose antler, on wood base. 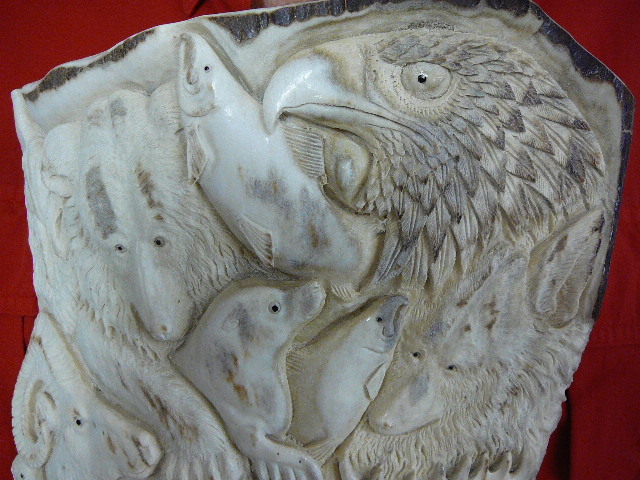 Detailed carvings of heads of howling wolf, bear, salmon, eagle, seal, walrus, moose, humpback whale. 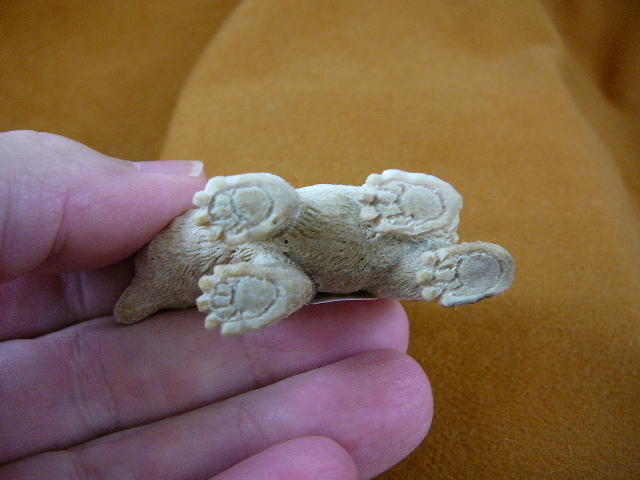 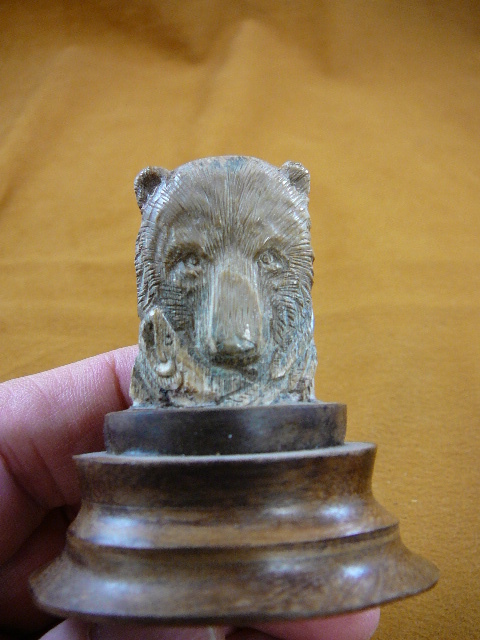 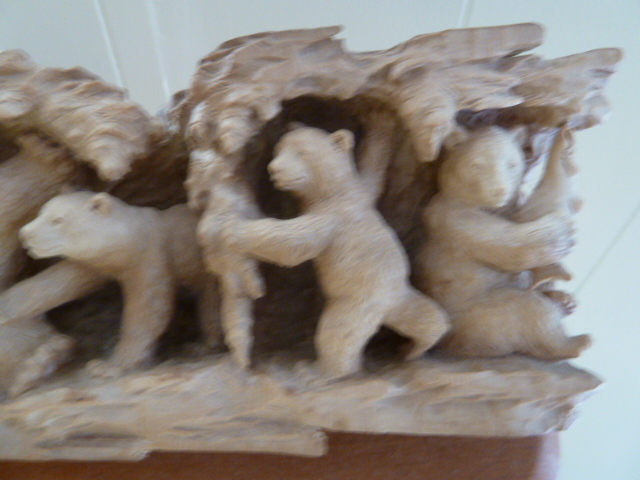 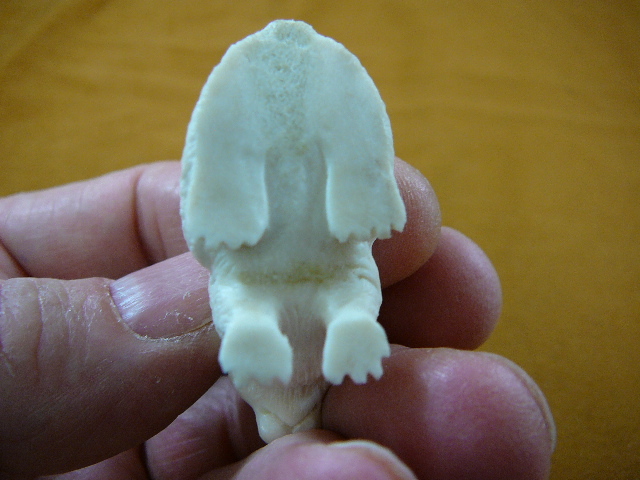 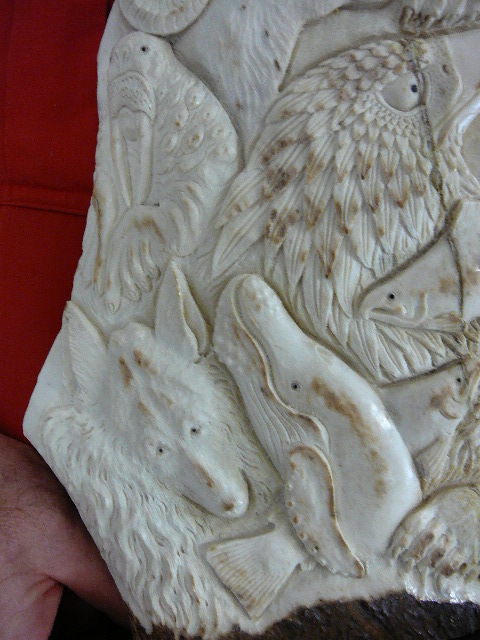 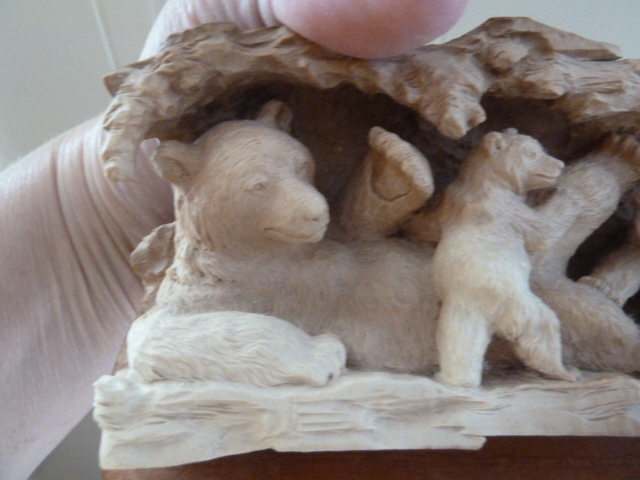 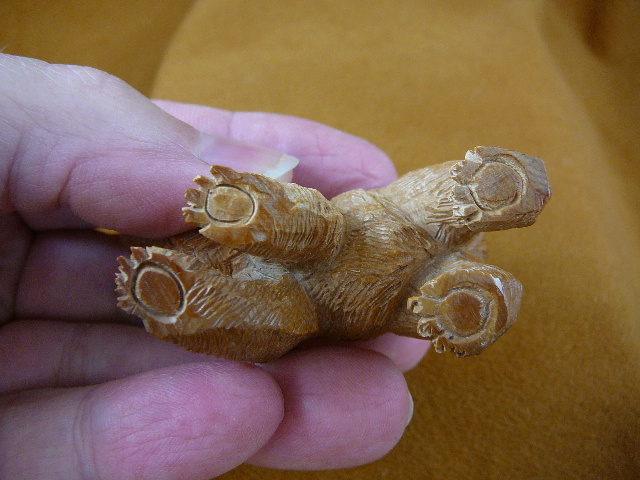 Bear on bottom has beautiful paw carved. 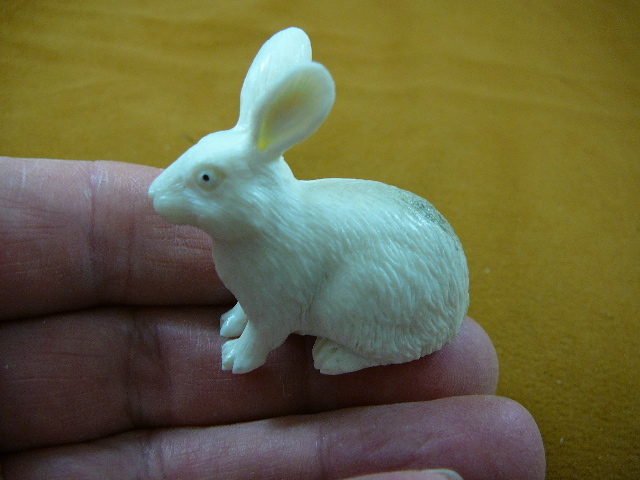 Full measurement is 14" tall x 9-1/2" wide x 3" deep. 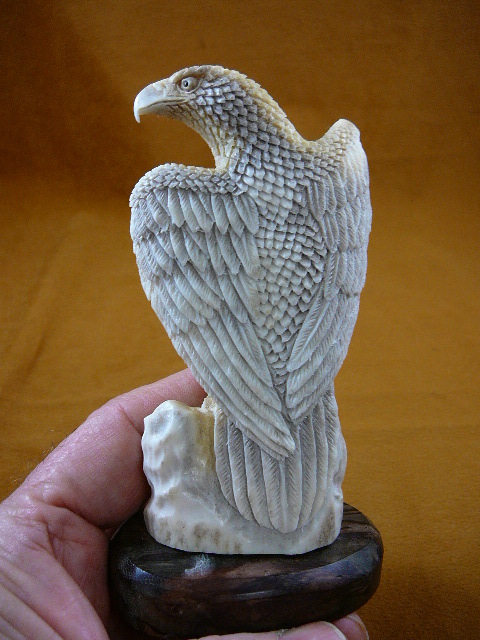 Carving itself measures 13-7/8" tall x 9-1/2" widest x 1" thick. 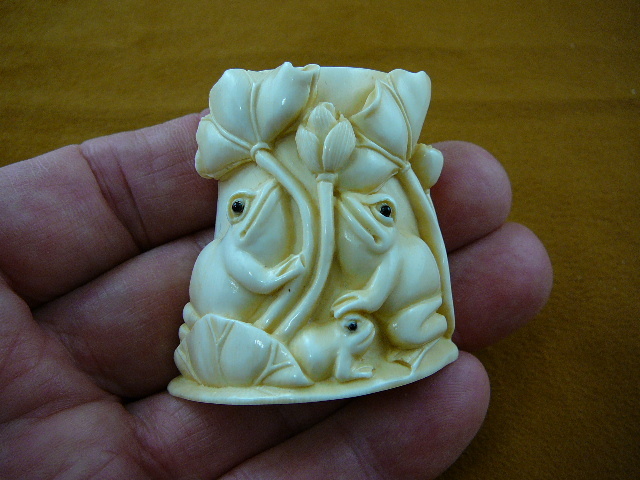 Piece is curved. 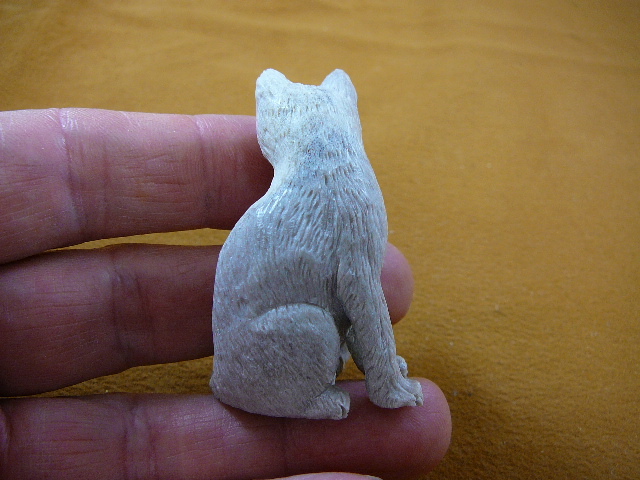 Weighs 2 lbs 14 oz. 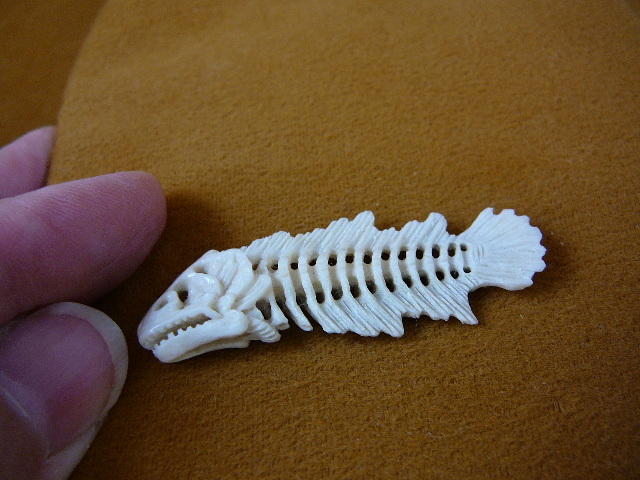 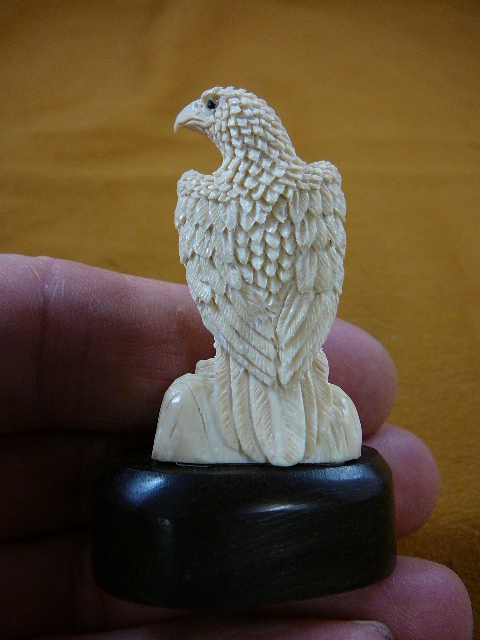 Carving itself is 13-1/4” tall x 6-1/4” wide x 1” thick. 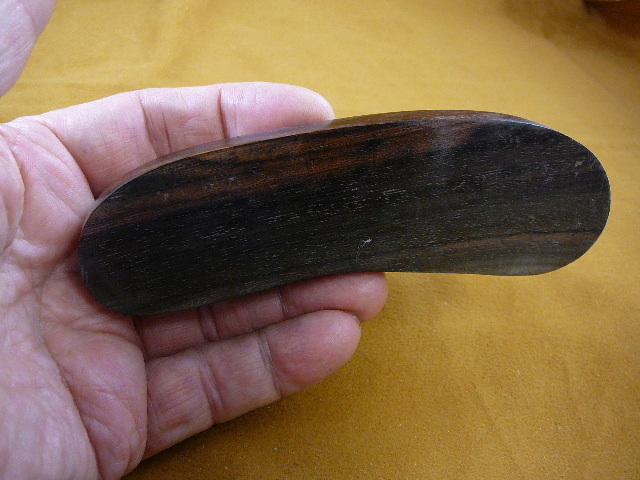 Weight: 1 pound 7.7 oz. 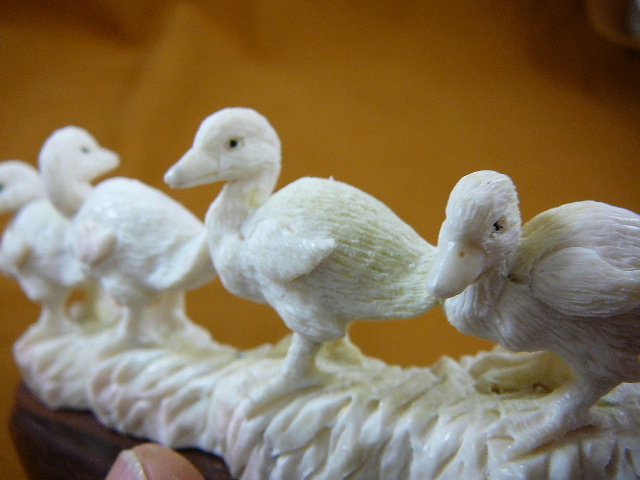 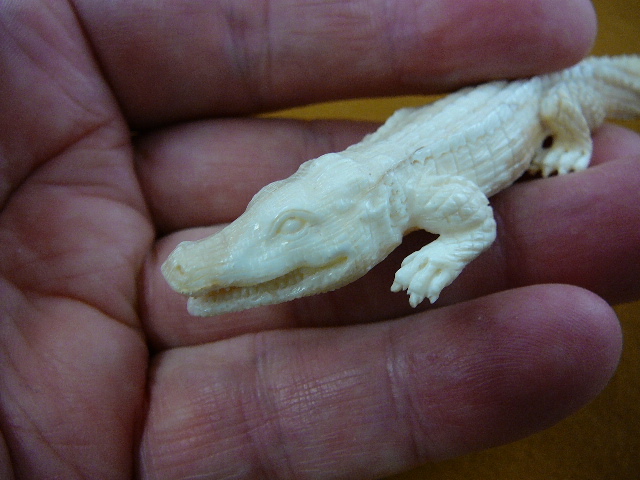 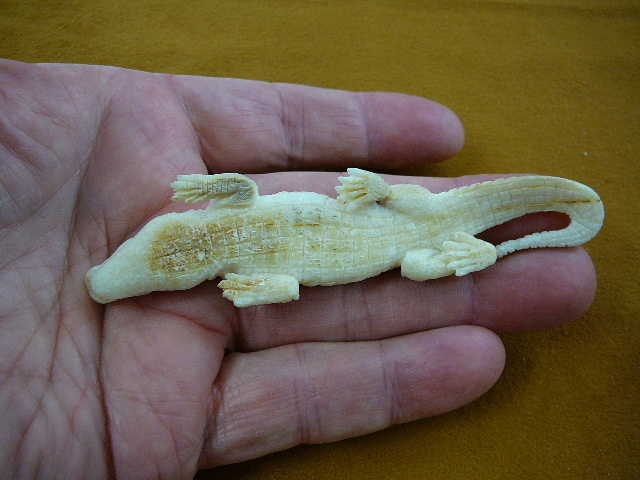 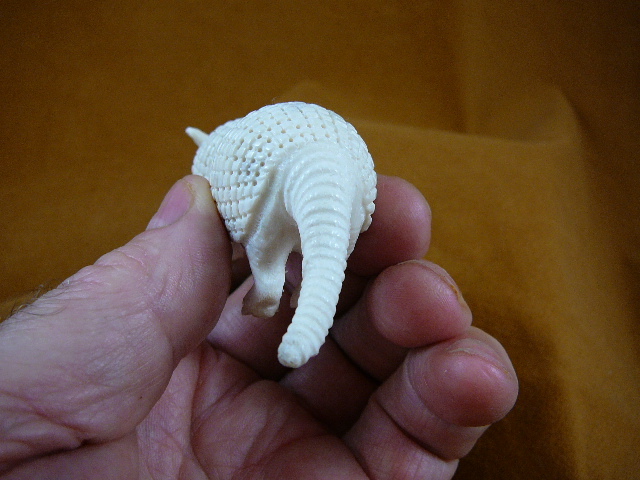 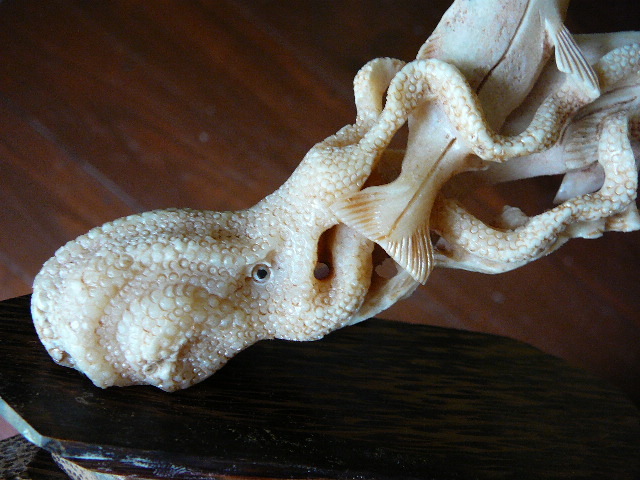 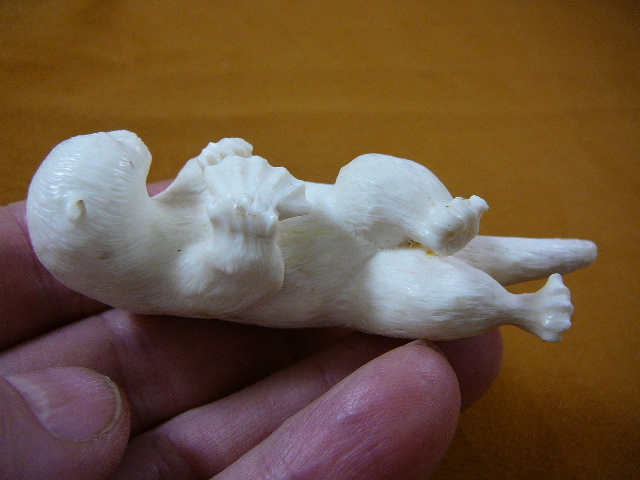 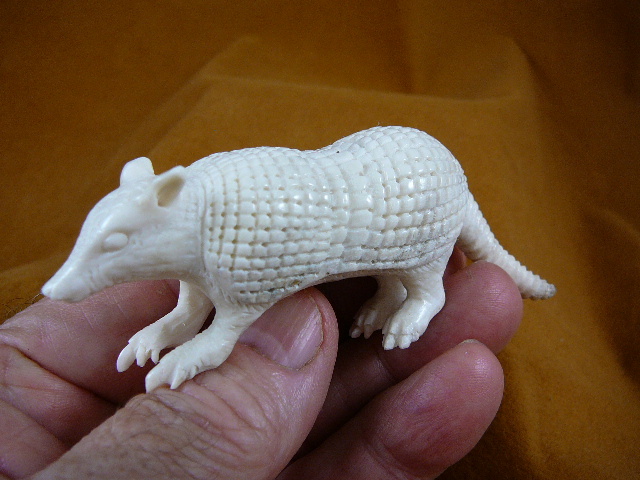 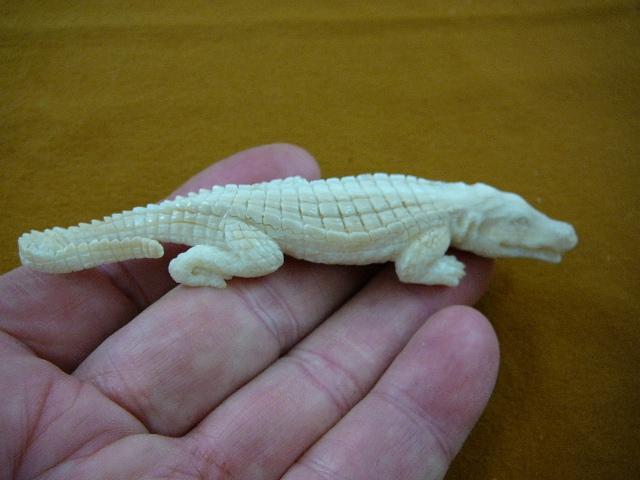 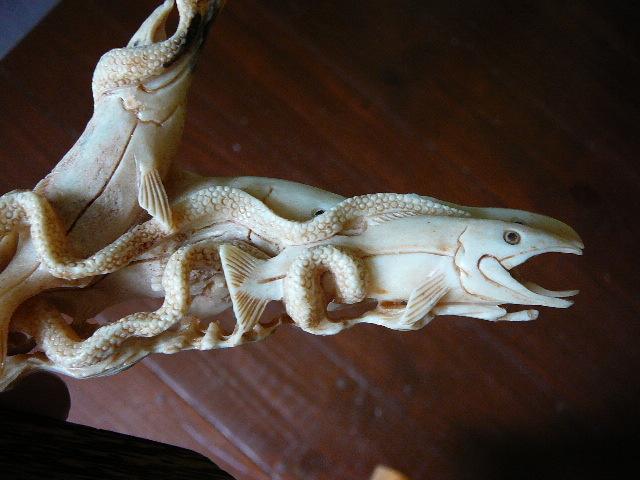 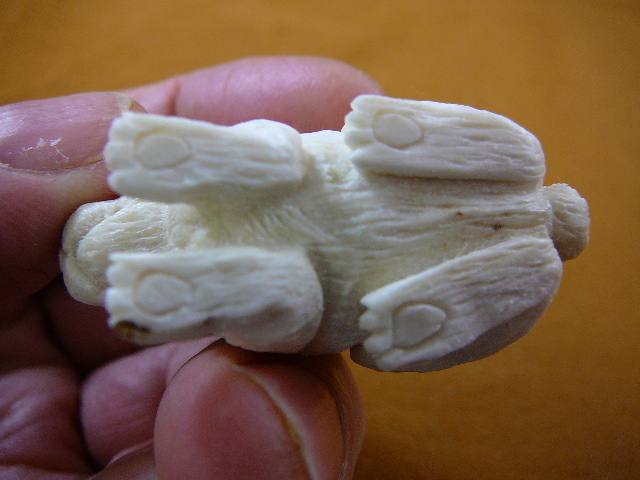 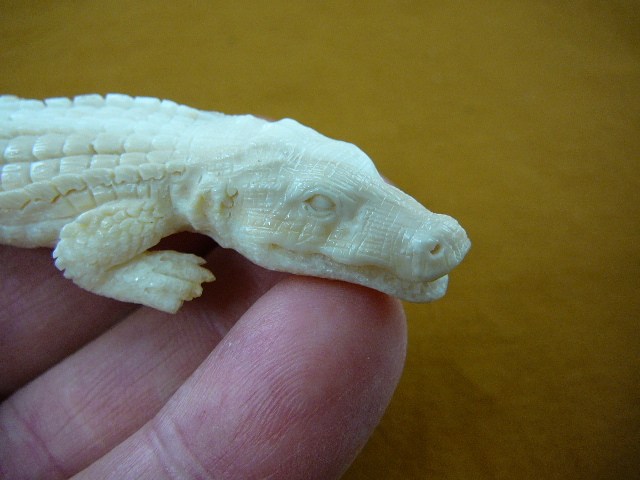 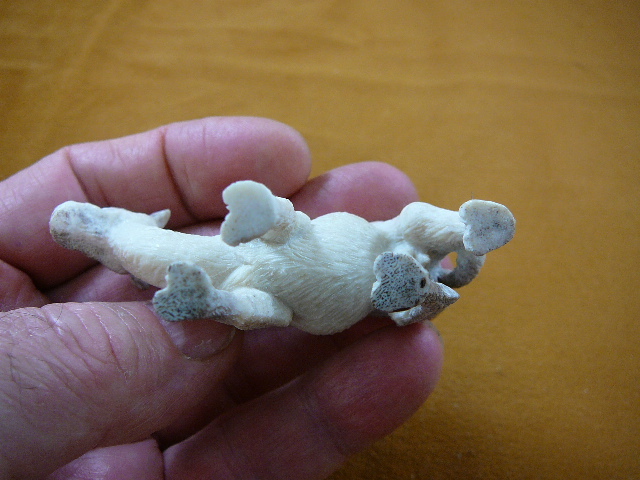 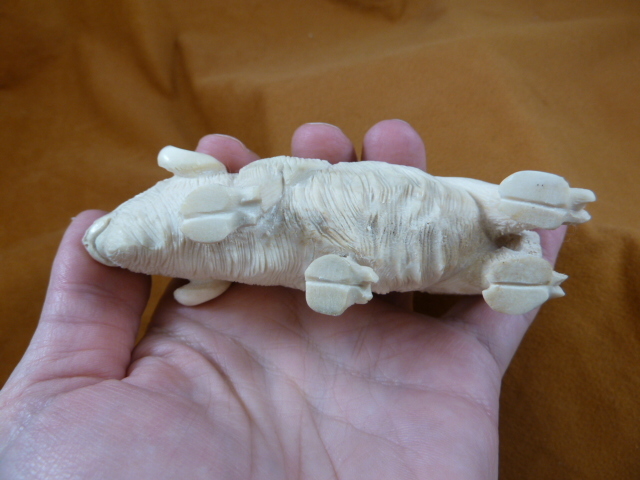 Detailed Alligator carved of woolly mammoth ivory, exquisite detail, carved in Bali. 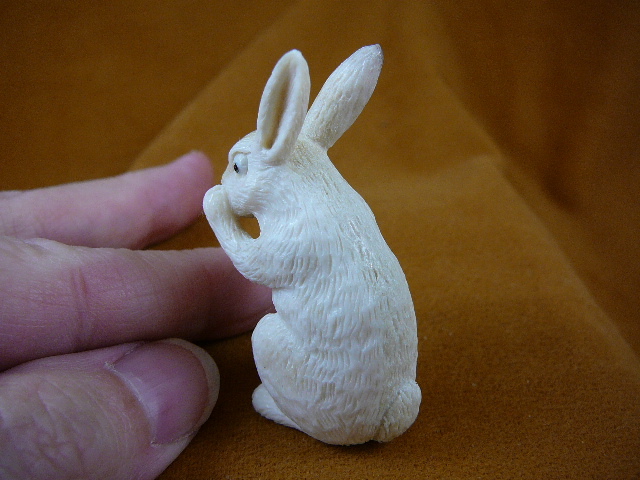 Measures 4-1/8" long x 1-1/8" wide x 1/2" tall. 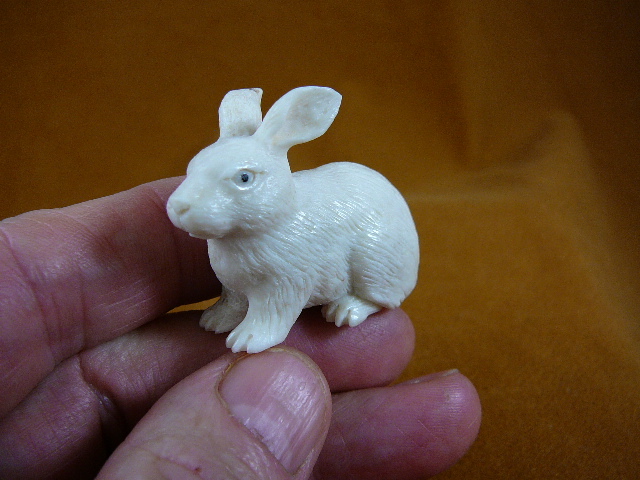 On wood base, total measurement is 10” long x 1-7/8” wide x 3-3/8” tall. 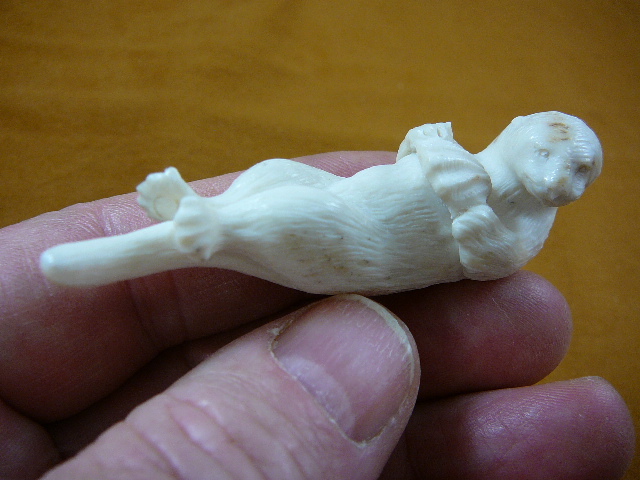 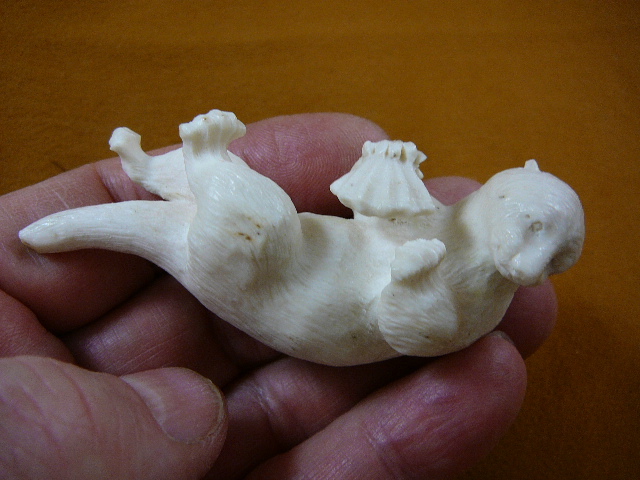 DETAILED Two polar bears fishing; note the foot detail (woolly mammoth ivory), unsigned. 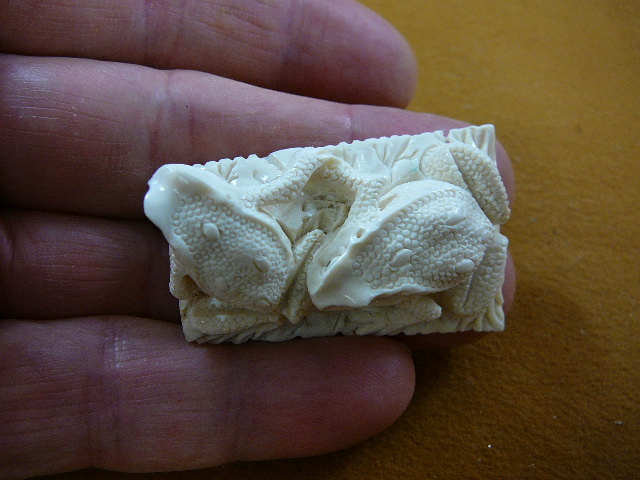 Carved in Bali. 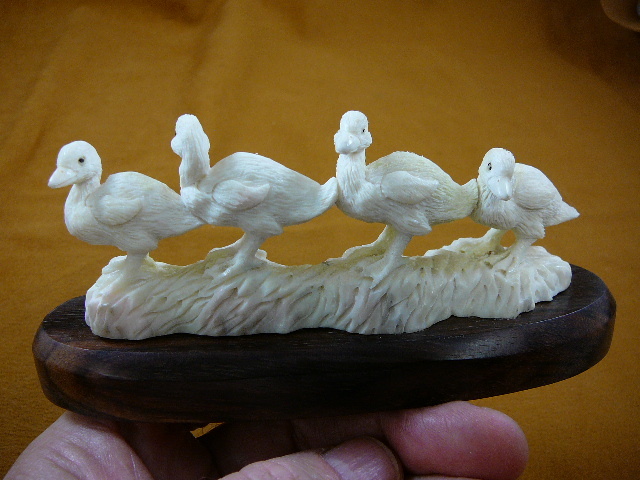 Measures 3-3/8" long x 1-3/4" wide x 1-7/8" tall. 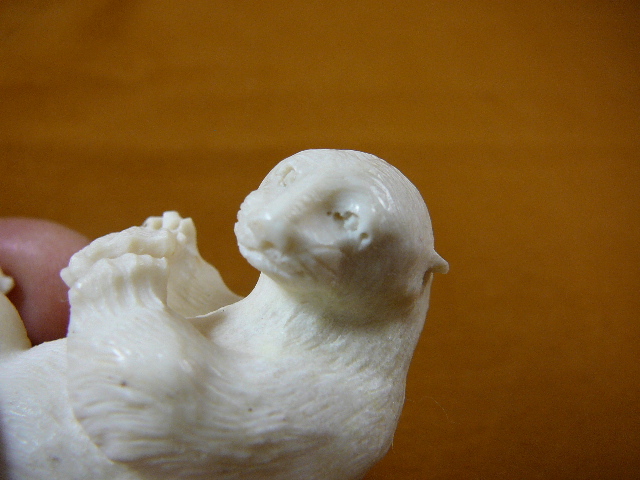 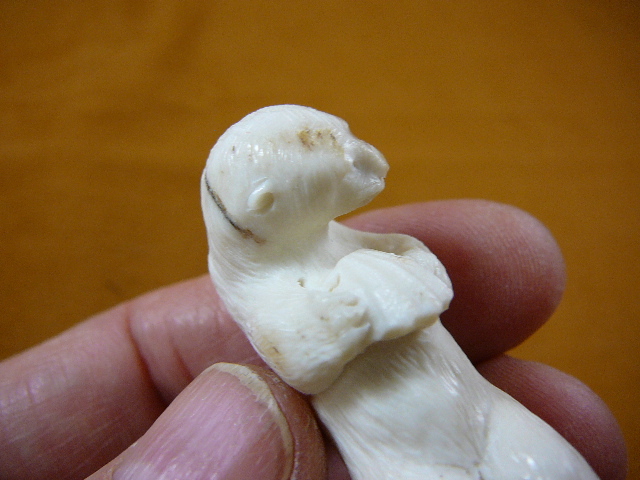 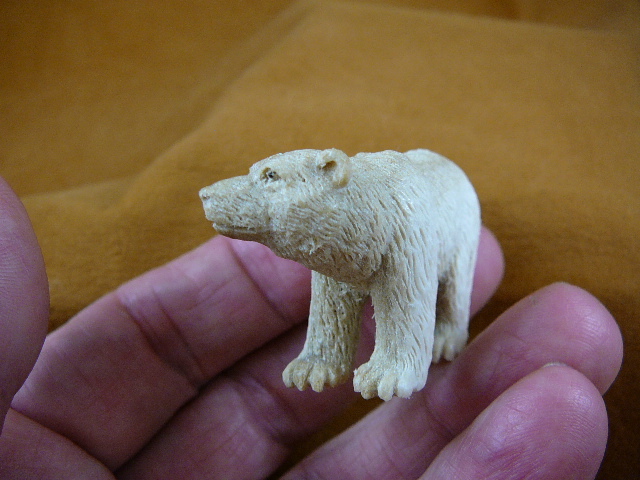 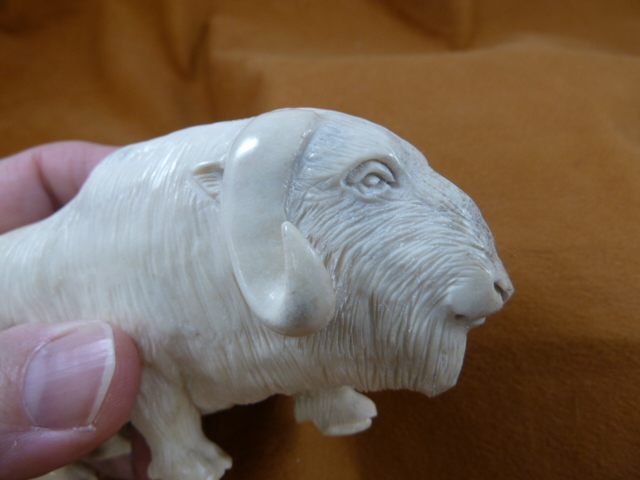 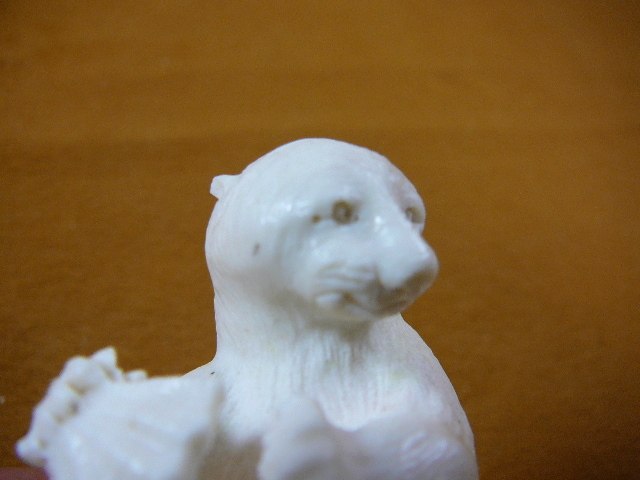 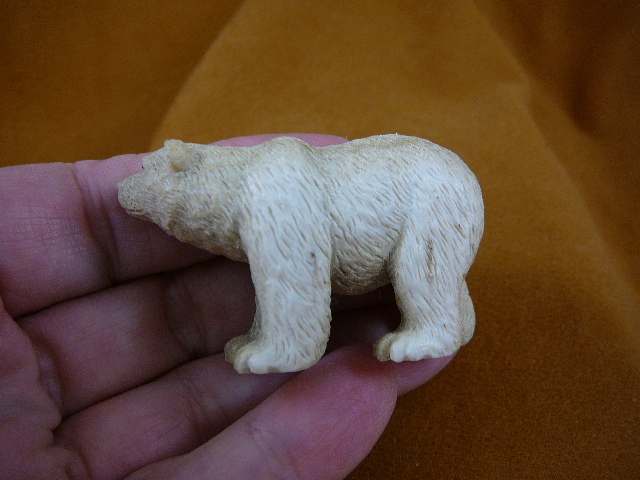 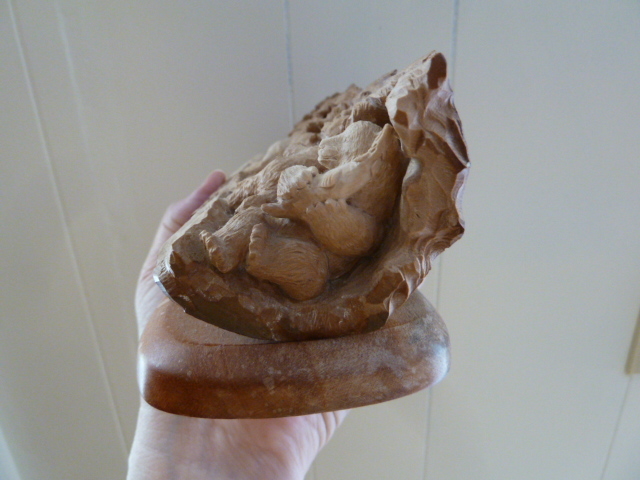 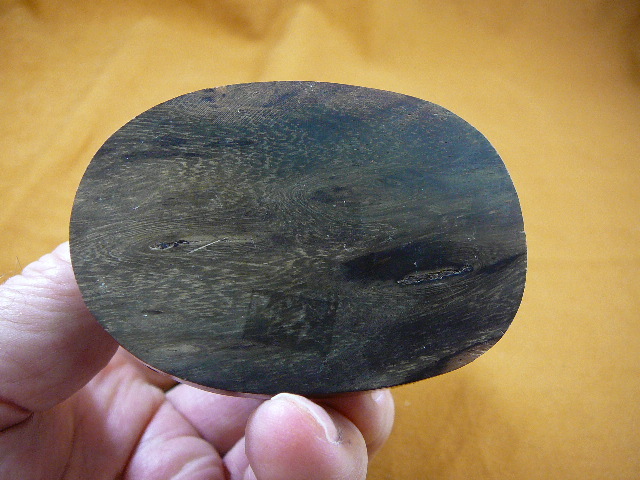 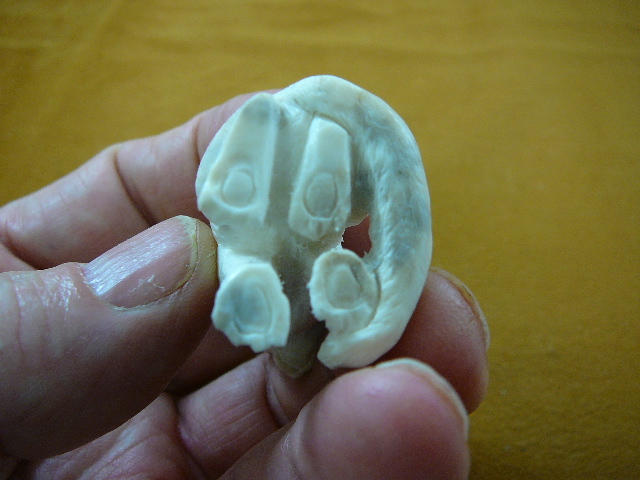 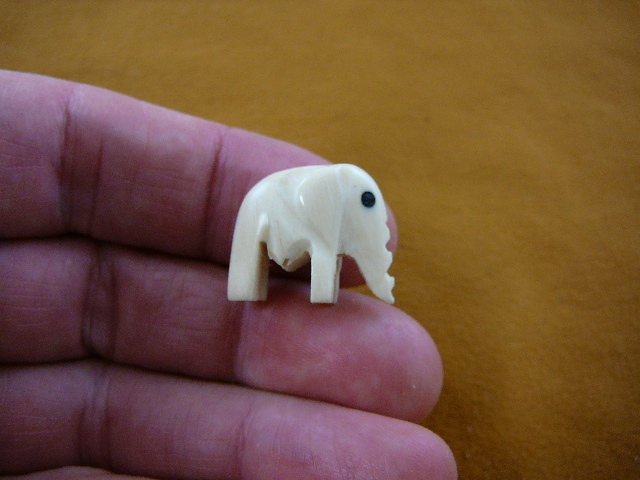 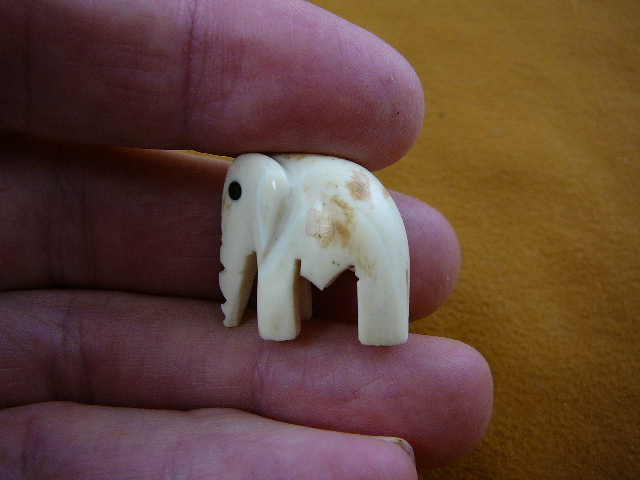 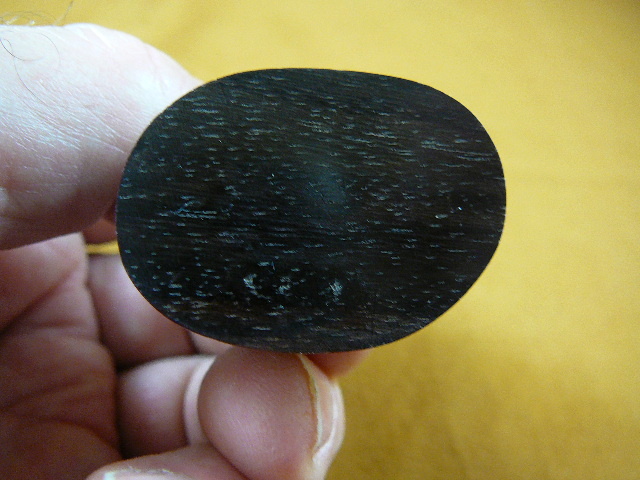 Thin slice of curved woolly mammoth ivory, carved into a Grizzly Bear head, on wood base. 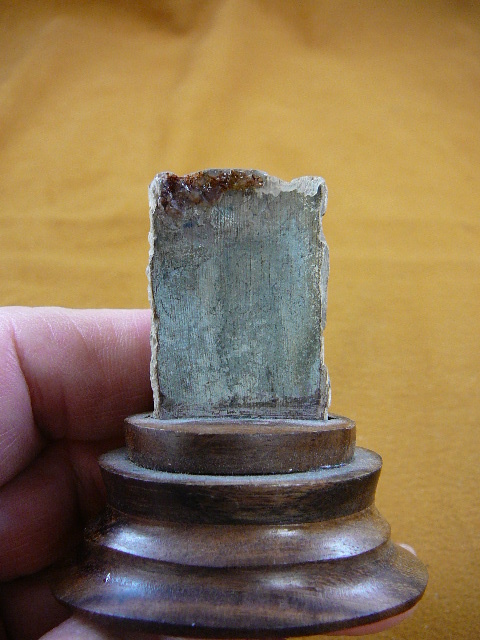 Measures 2-1/2 tall overall x 2-1/8 wide x 1-1/4 deep. 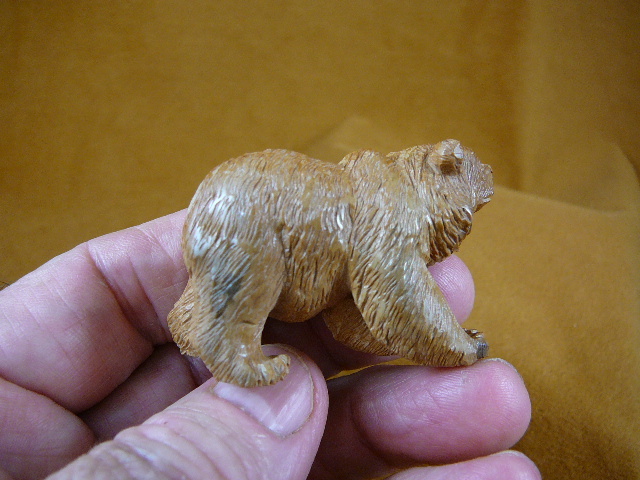 Bear head itself is 1-3/8 tall x 1-1/16 wide x 1/16 thick. 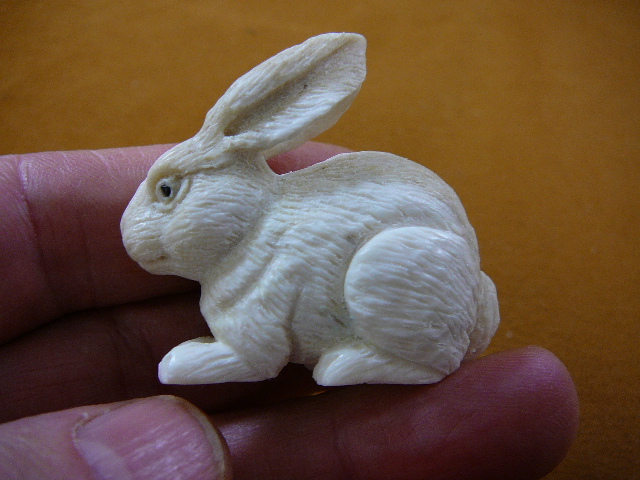 On wood base, total measurement is 9-3/8” long x 2” wide x 3-1/4” tall. 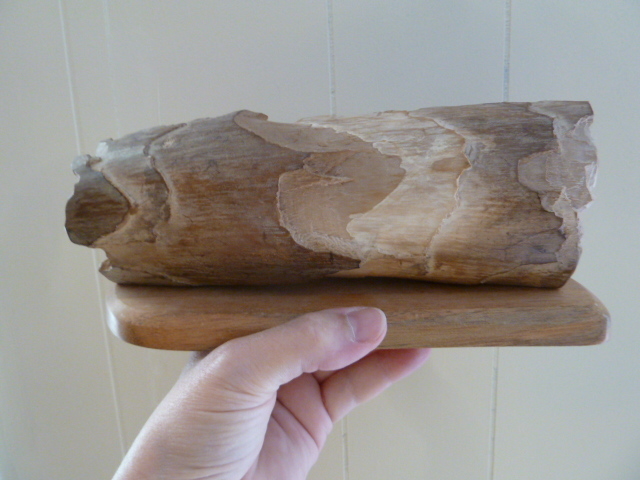 Base is 8” long x 2-3/8” wide x 2” tall. 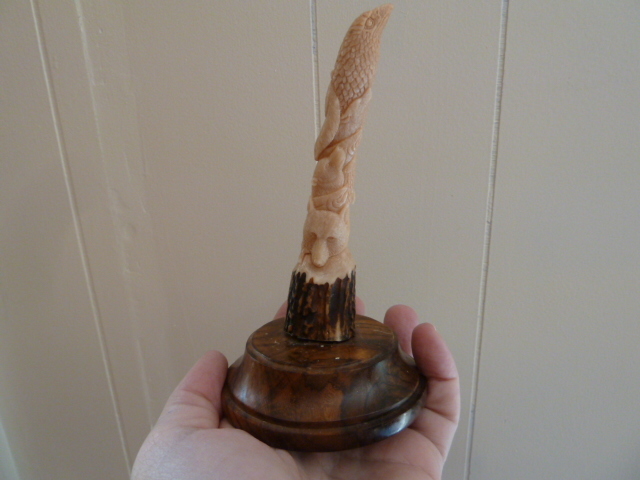 Base is 14-3/8” long x 2-1/4” wide x 2” tall. 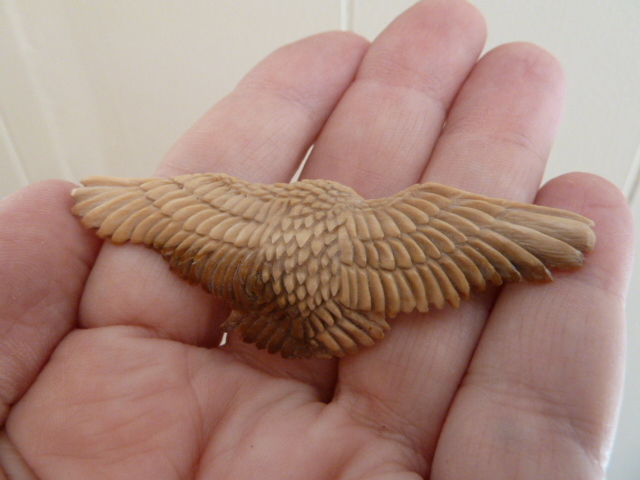 Base is 11-5/8” long x 2-3/8” wide x 2-1/8” tall. 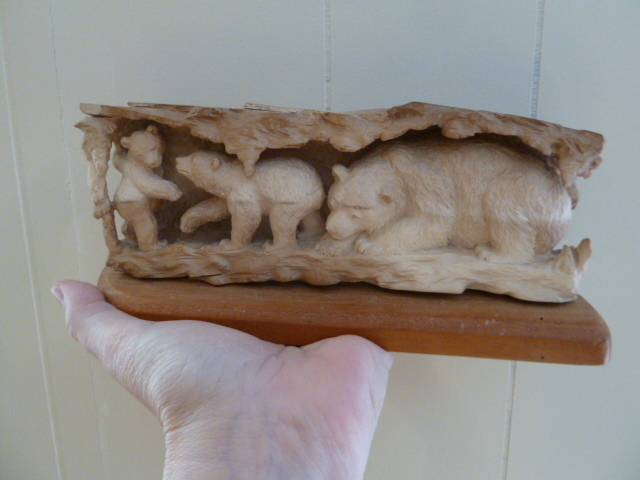 Papa, mama and cub in a row, one bear cub in front of papa. 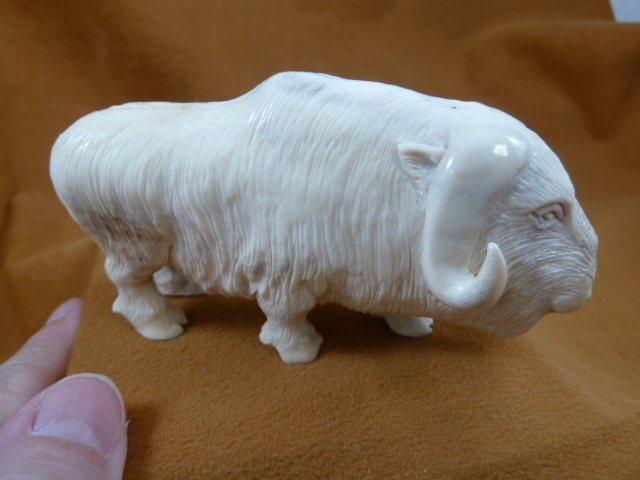 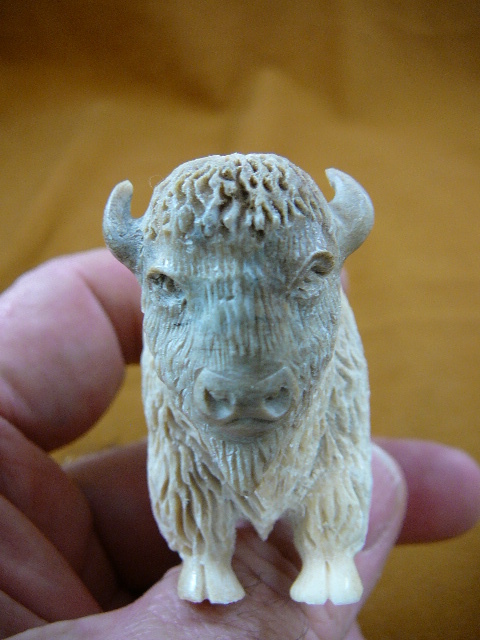 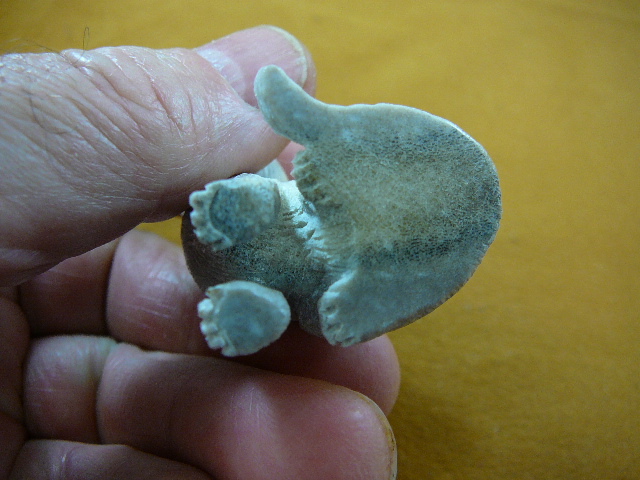 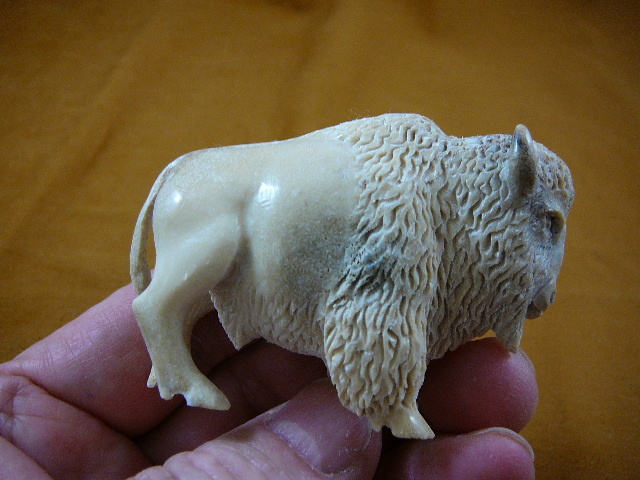 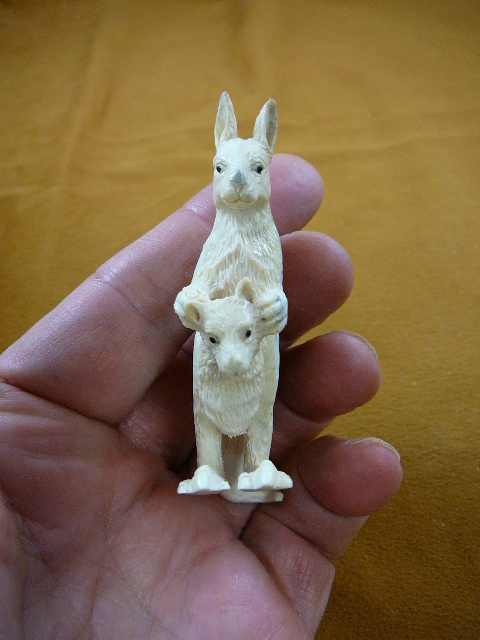 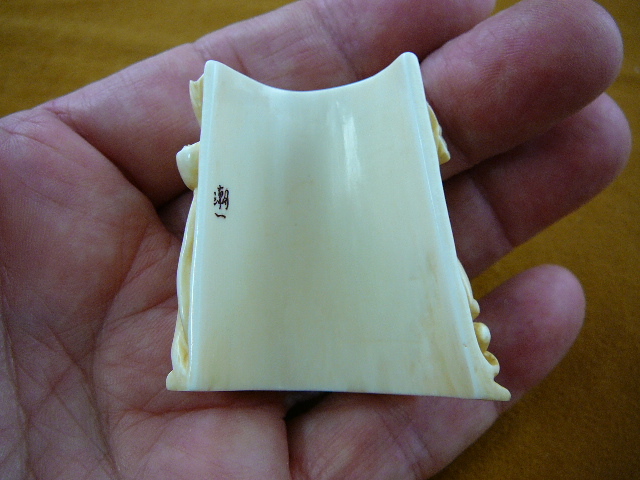 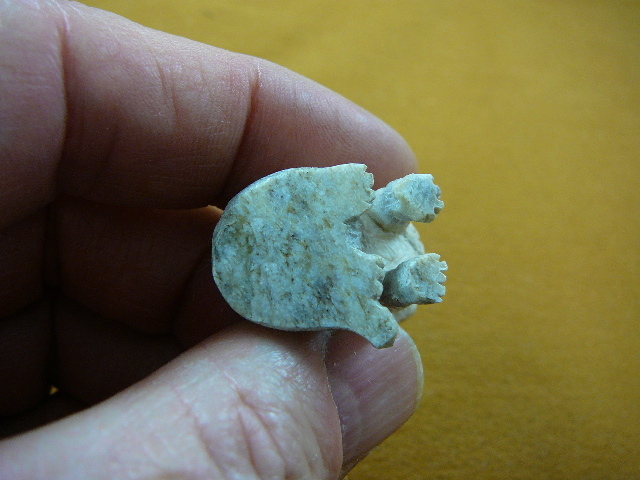 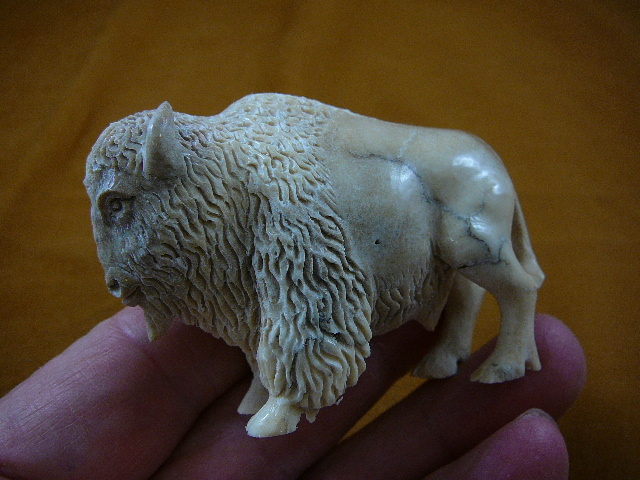 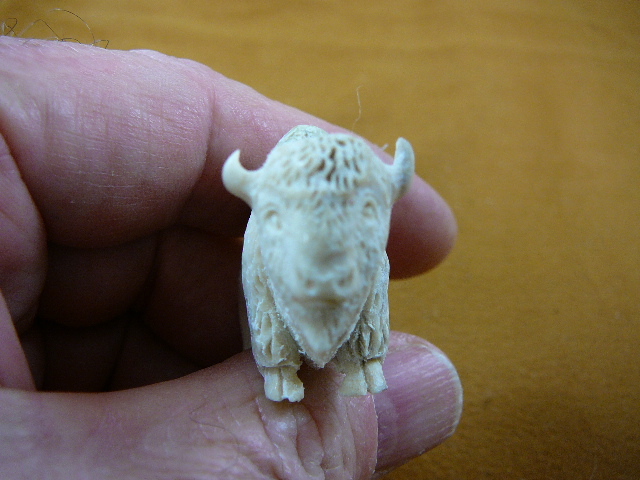 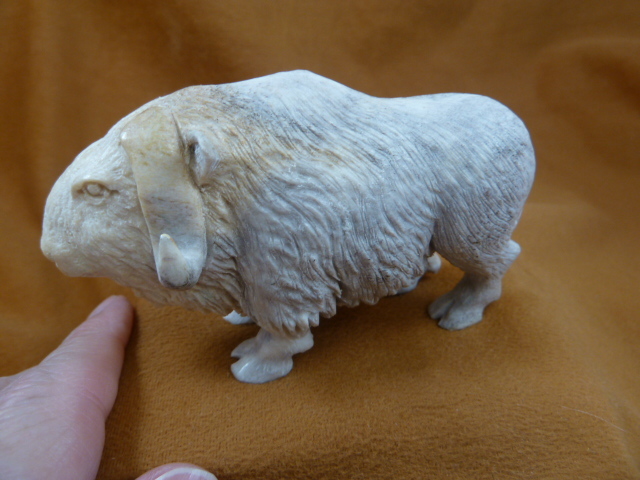 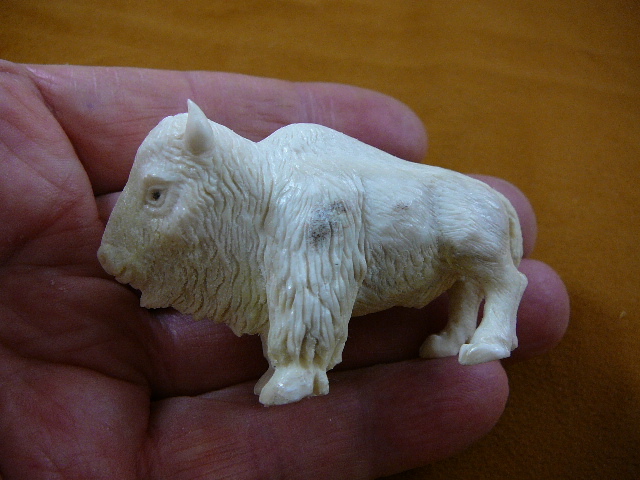 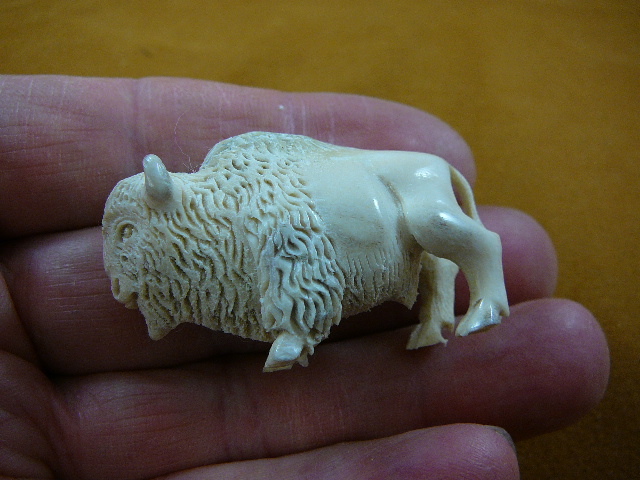 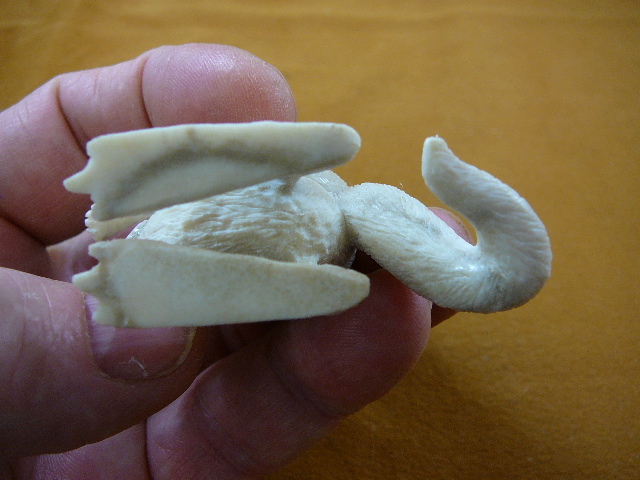 Moose antler, Small buffalo is 1-7/8” long x 7/8” wide x 1-1/4” tall. 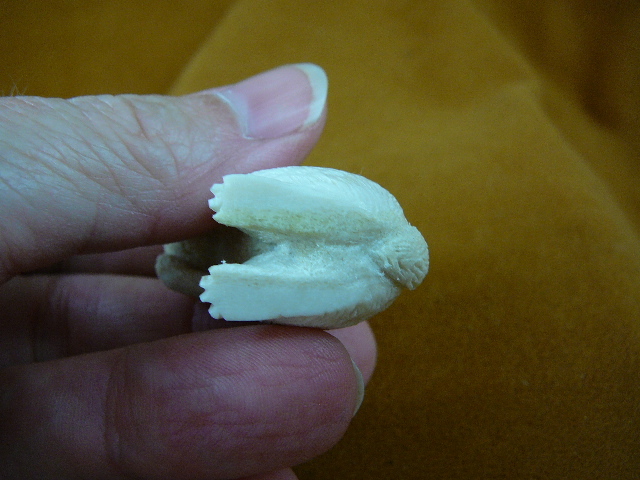 Cloven hoof bottoms also carved. 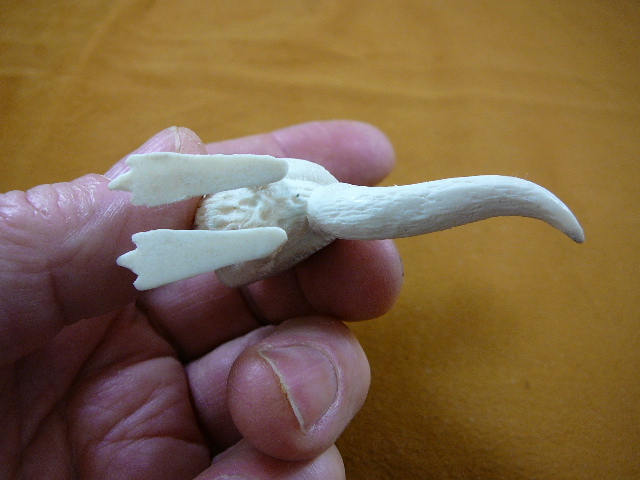 Moose antler, Small buffalo is 2 long x 1/2 wide x 1-1/4 tall. 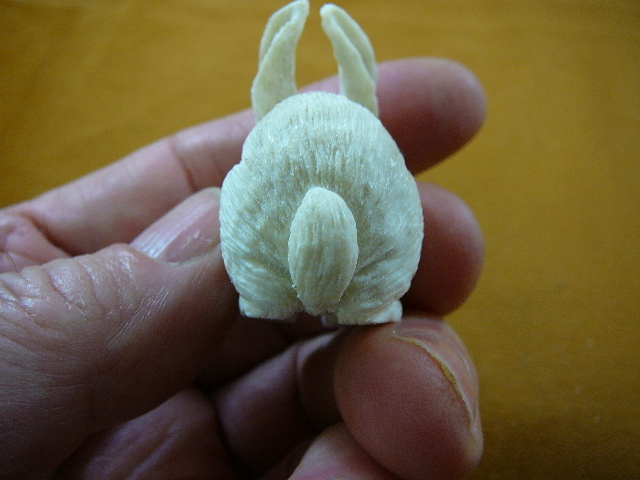 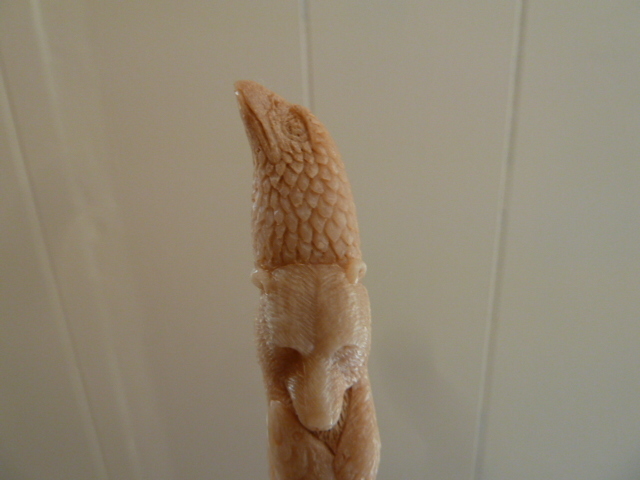 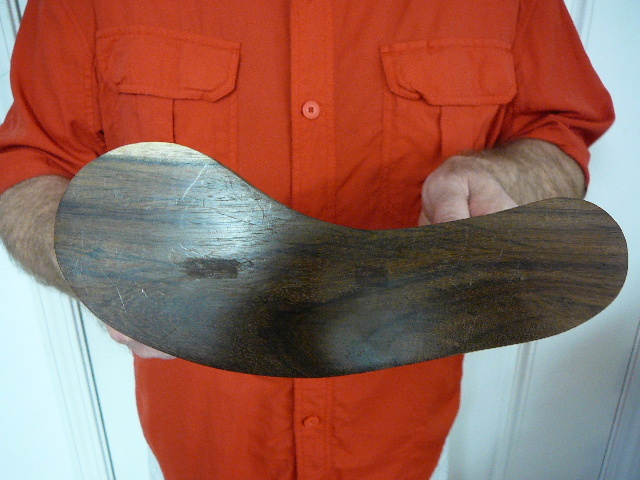 Cloven hoof bottoms also carved. 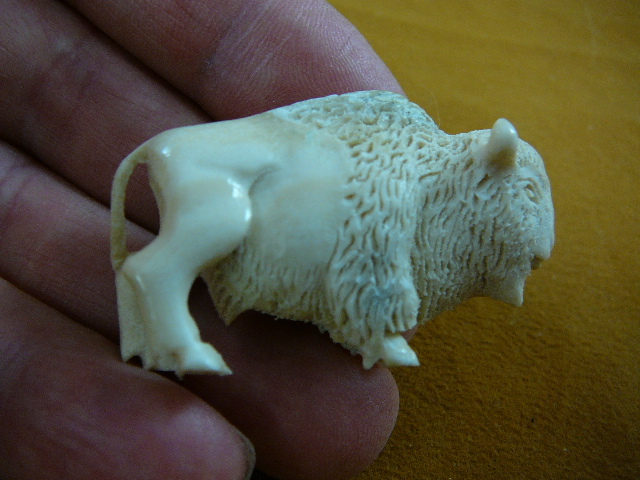 Moose antler, Large buffalo is 2-3/4 long x 1-1/8 wide x 2 tall. 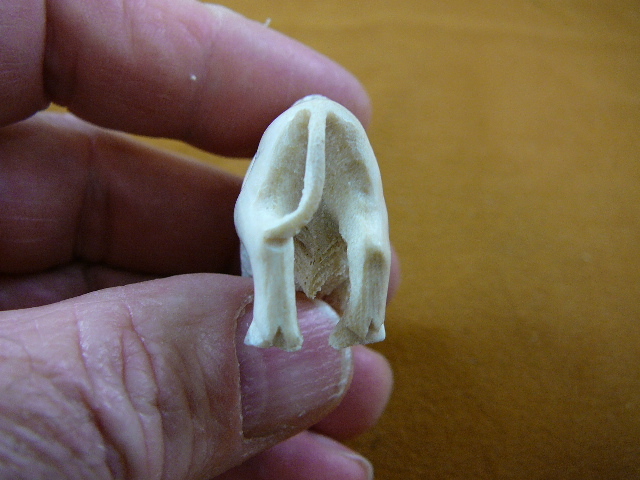 Cloven hoof bottoms also carved. 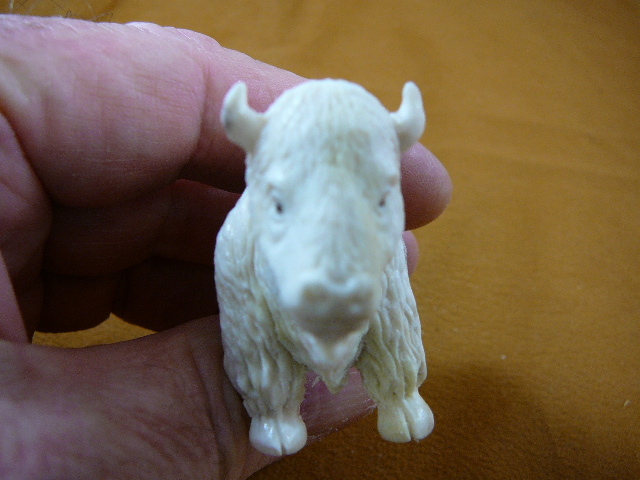 Moose antler, Medium (young) buffalo is 2-3/4 long x 1 wide x 1-3/4 tall. 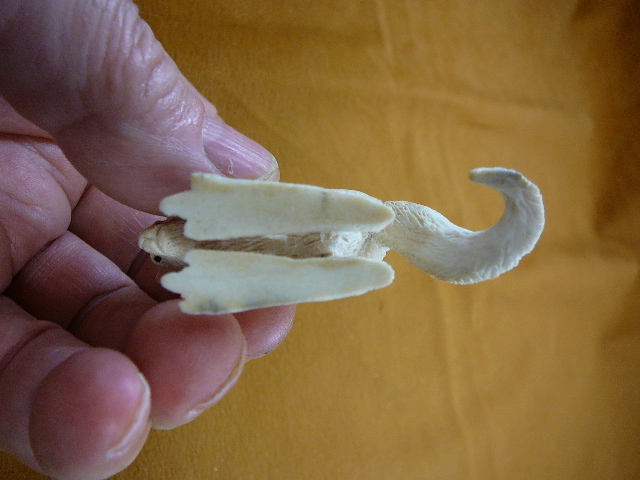 Cloven hoof bottoms also carved. 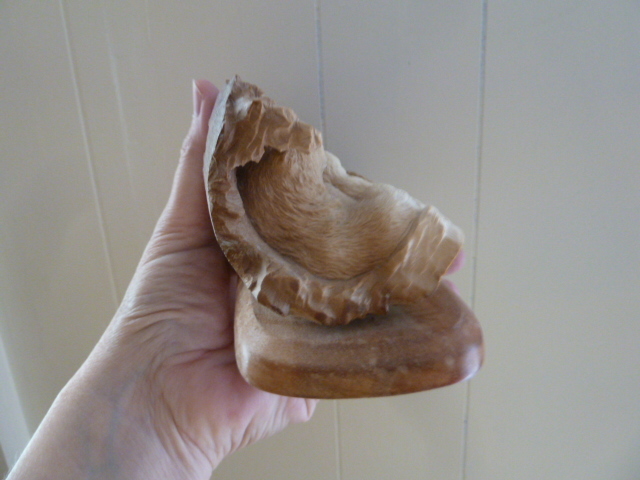 Base is 3-3/8” long x 1-7/8” wide x 1-1/2” tall. 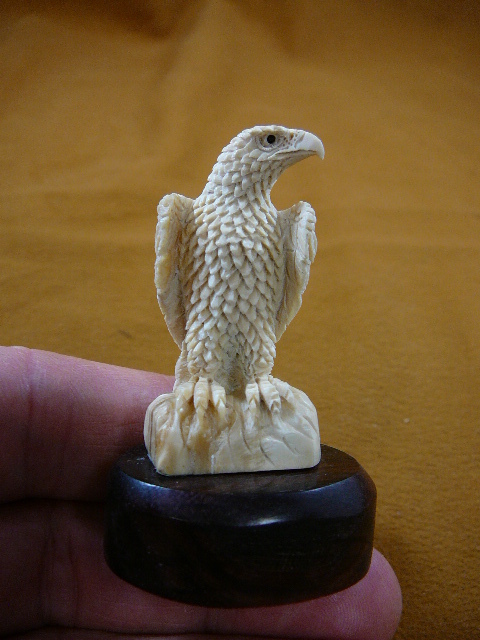 Base is 5-1/8” long x 2-1/8” wide x 2” tall. 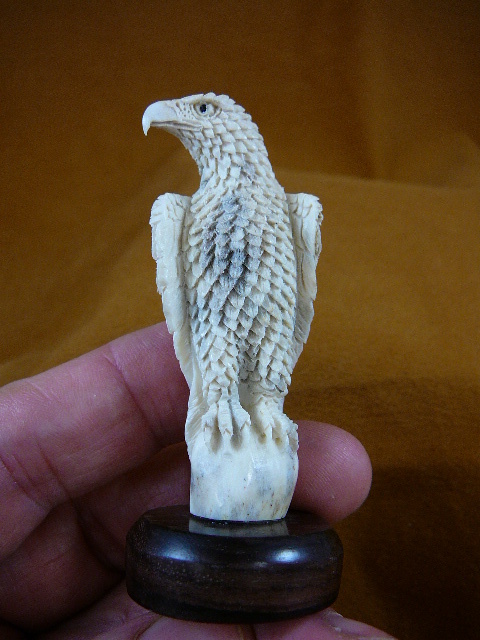 Base is 6-1/4” long x 1-3/4” wide x 1-5/8” tall. 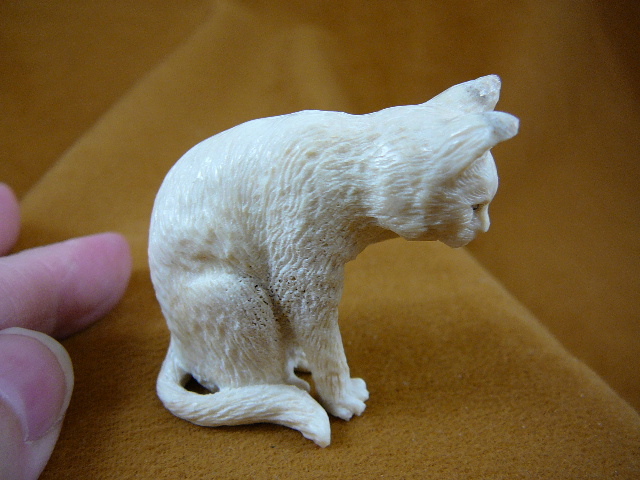 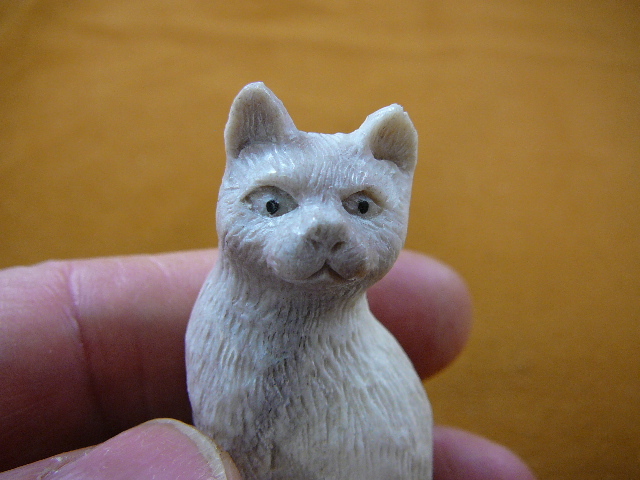 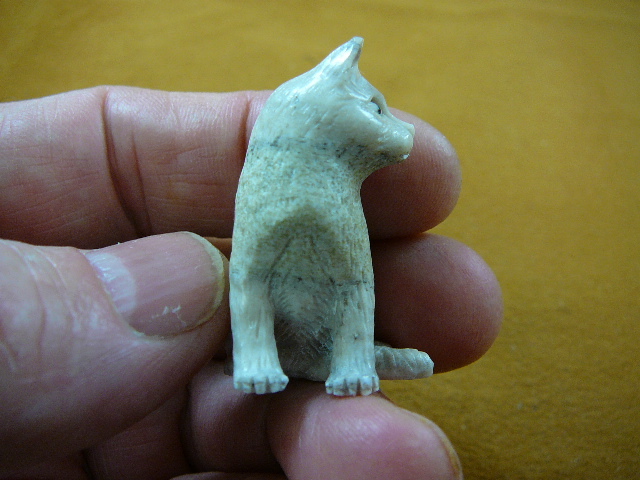 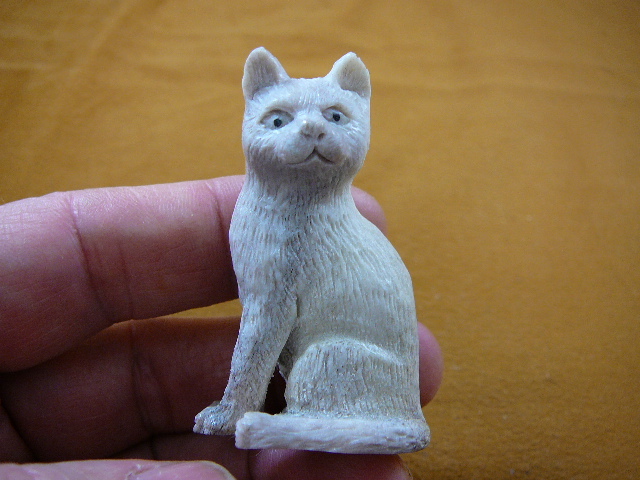 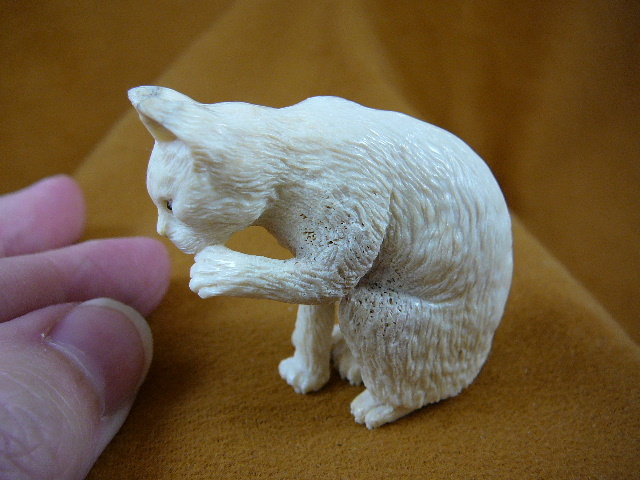 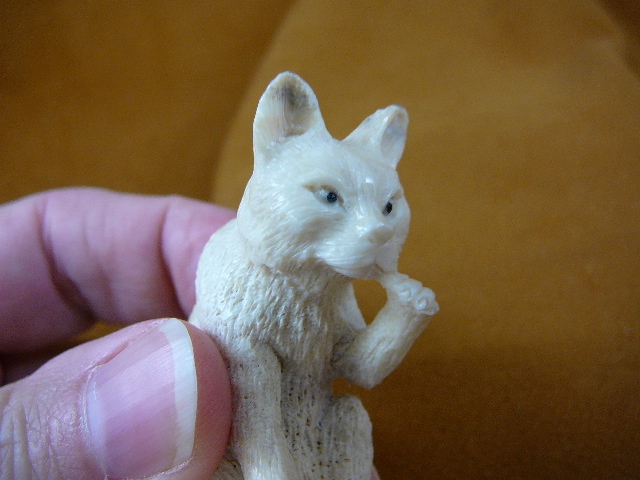 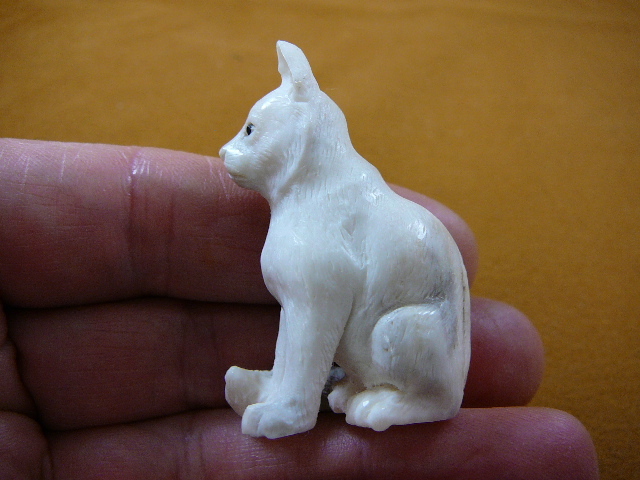 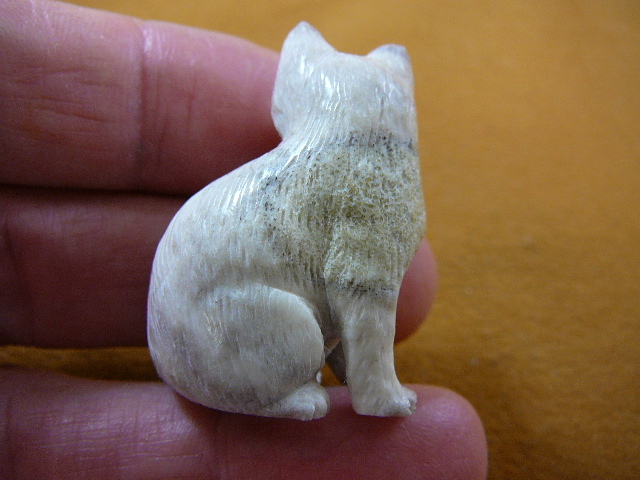 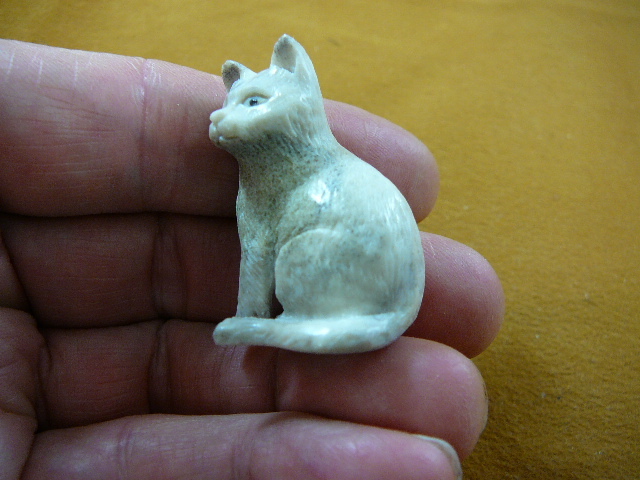 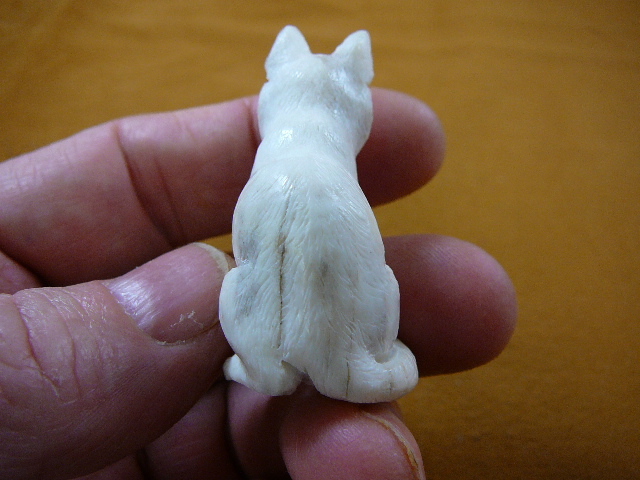 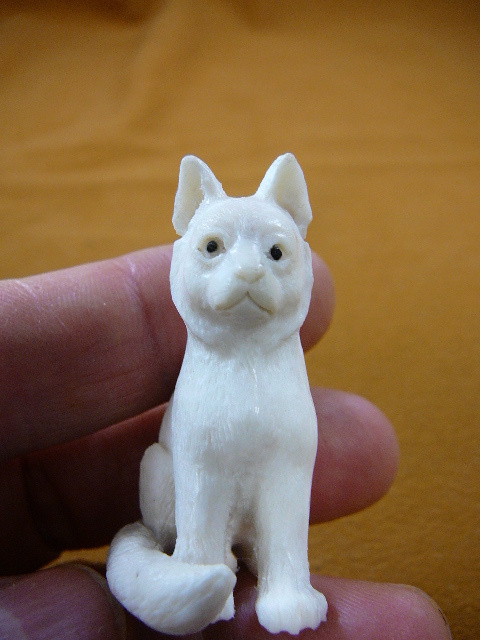 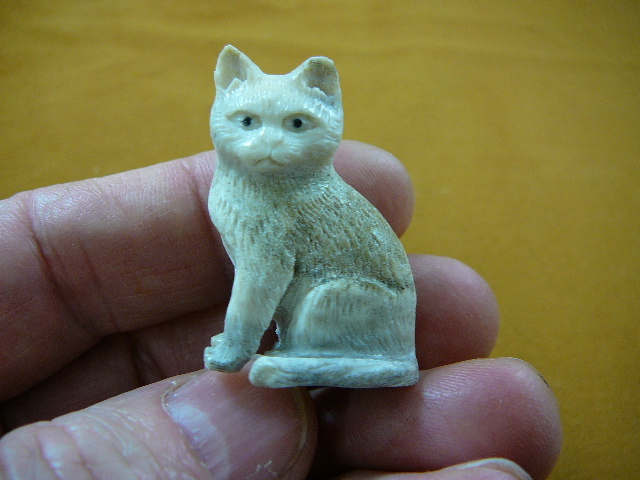 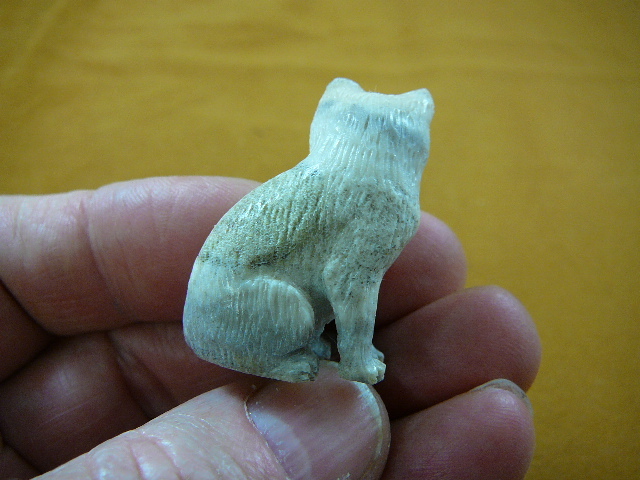 Medium sitting cat, moose antler, 1-15/16" tall x 1-1/8" wide x 1" deep; note paws are detailed. 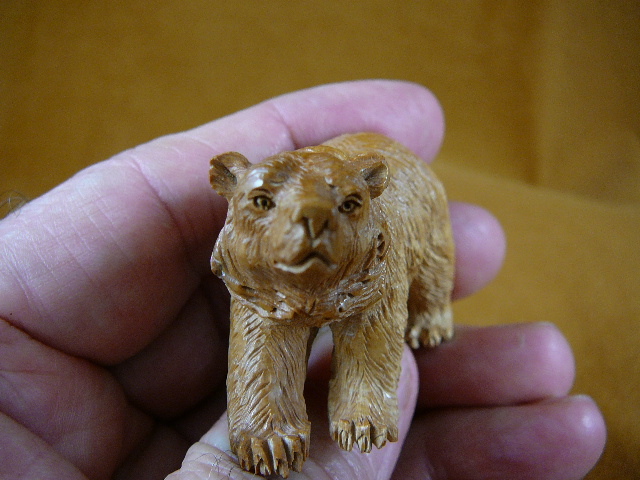 On wood base, 3-1/2” tall. 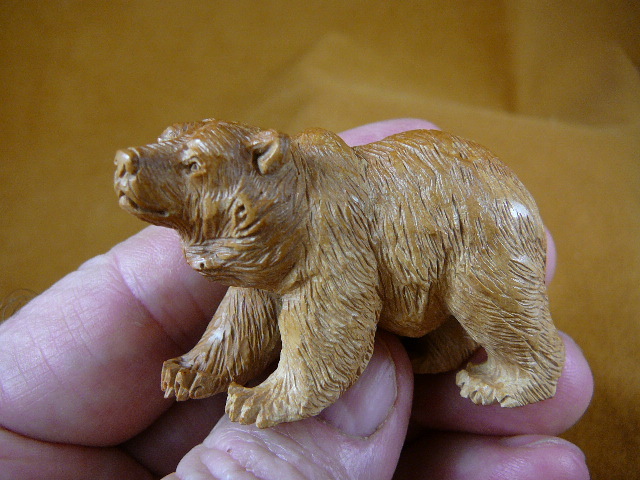 On wood base, 3-1/4” tall. 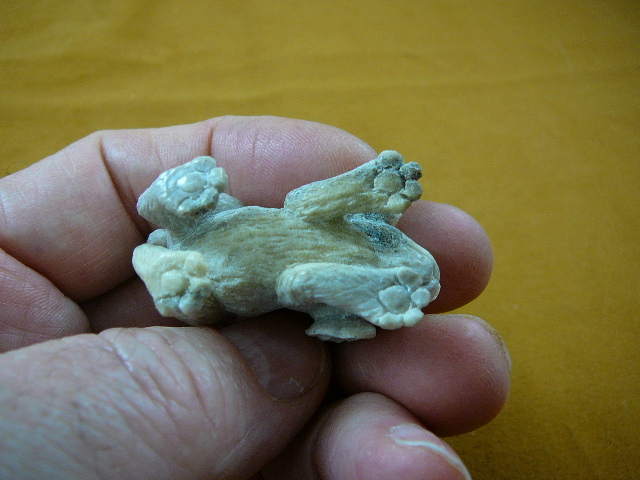 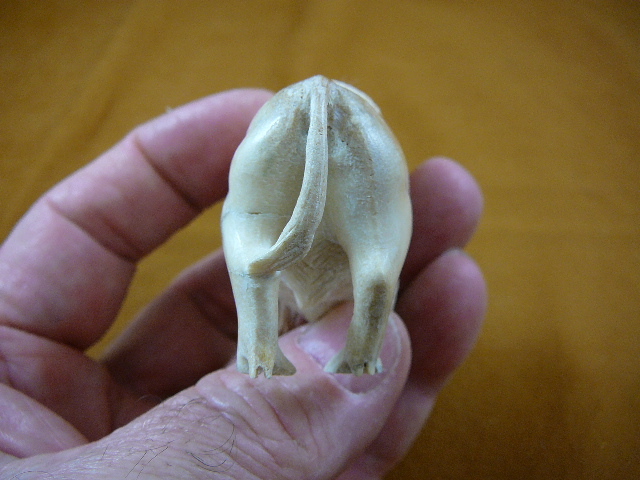 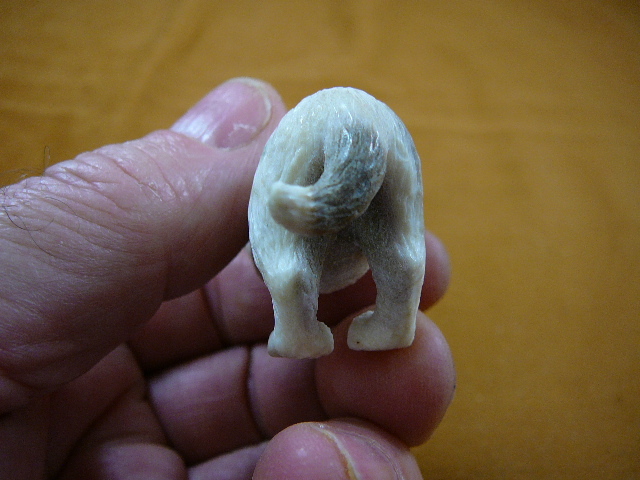 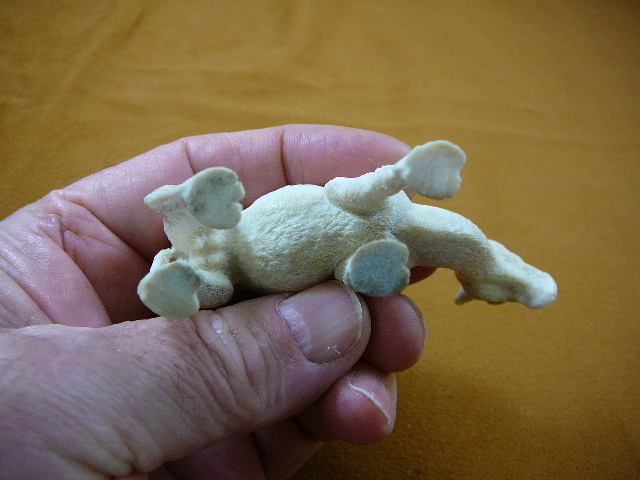 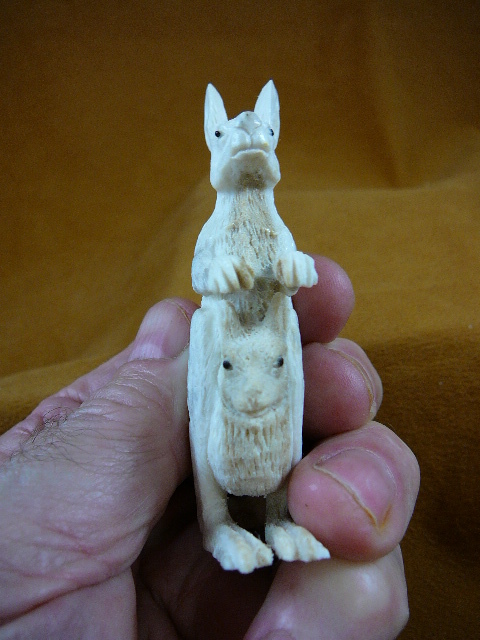 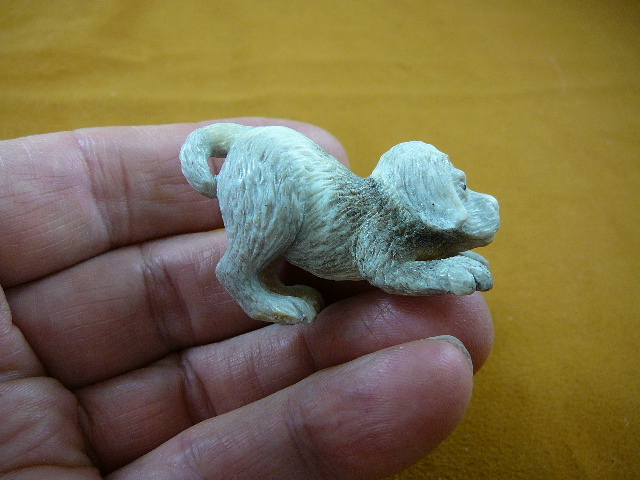 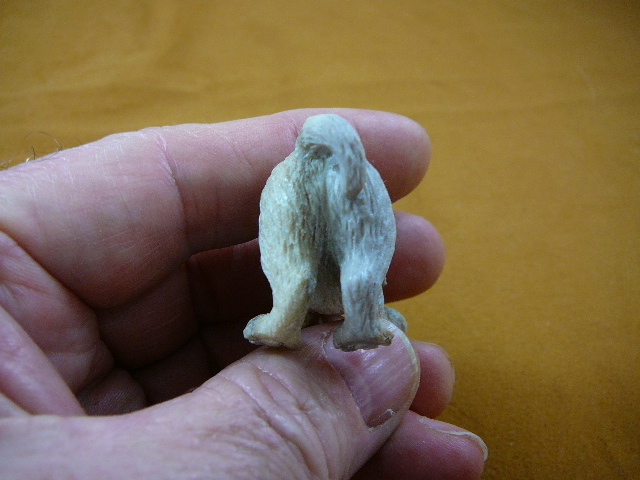 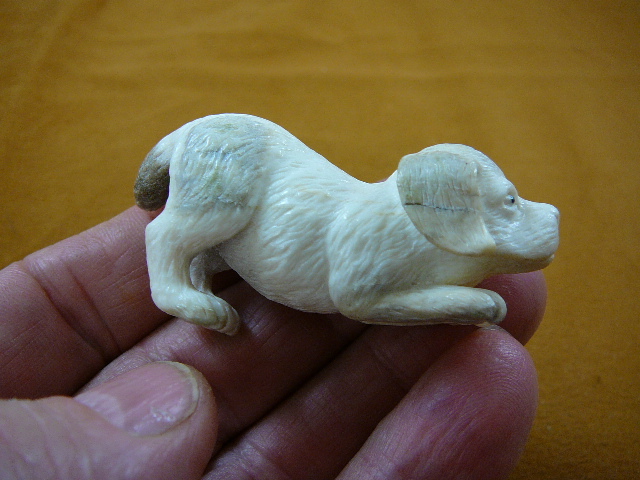 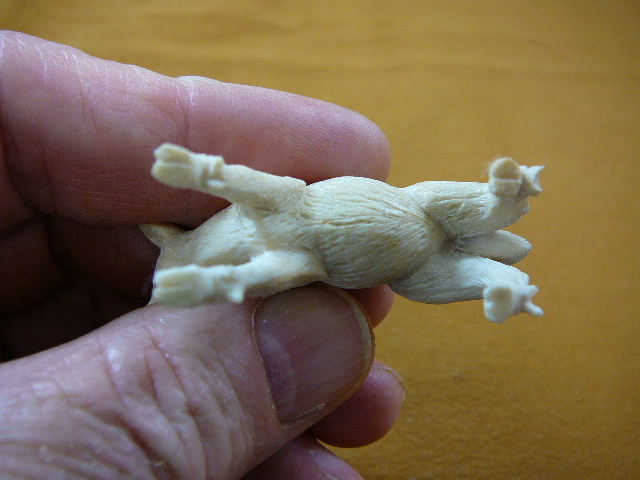 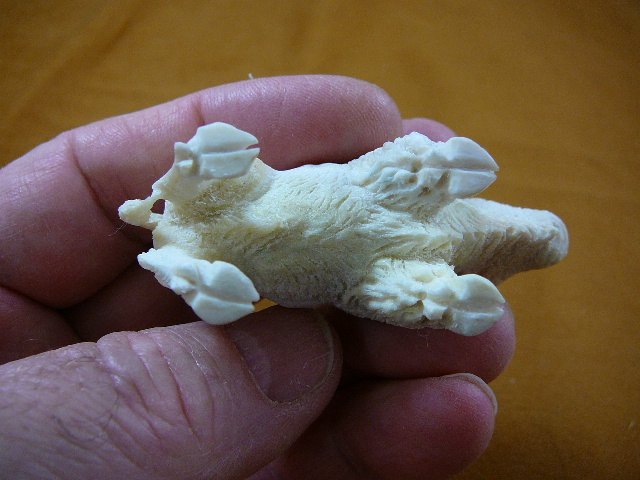 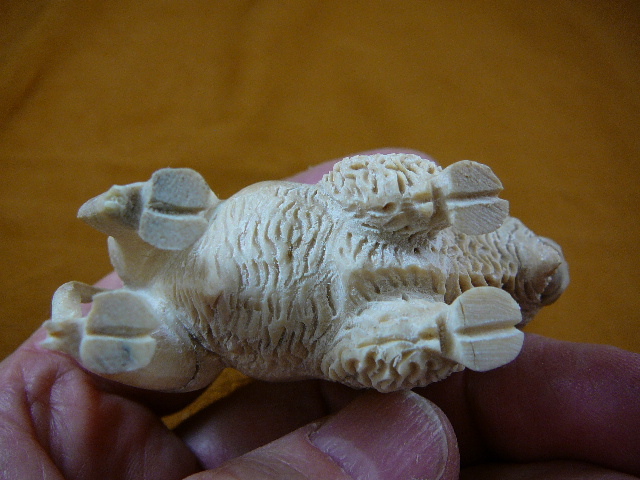 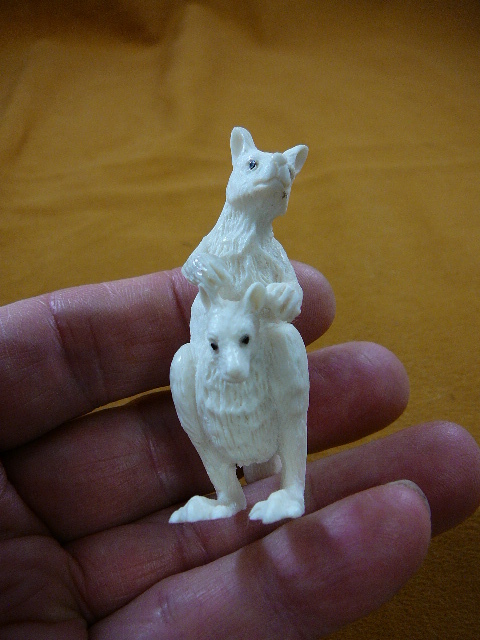 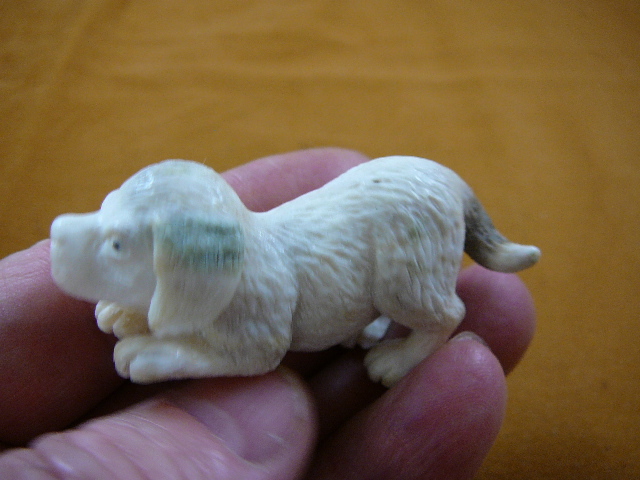 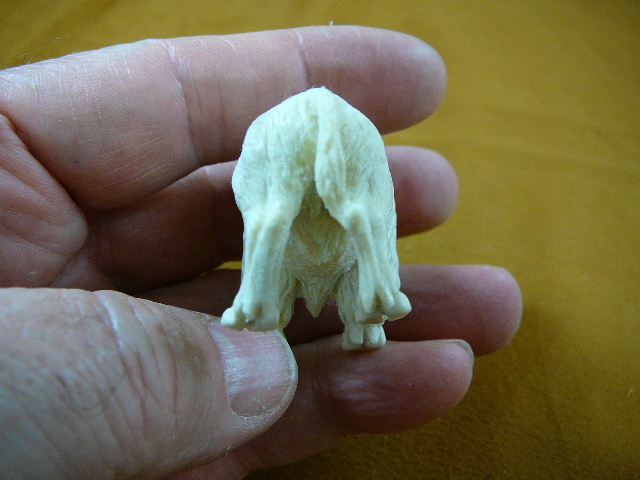 Medium dog, crouching to play (Labrador type of breed), Moose antler, 2-1/2" long x 7/8" wide x 1-1/4" tall, note foot pads are detailed. 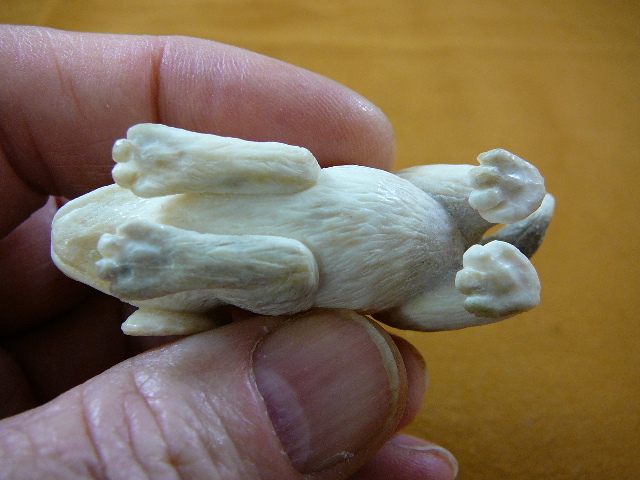 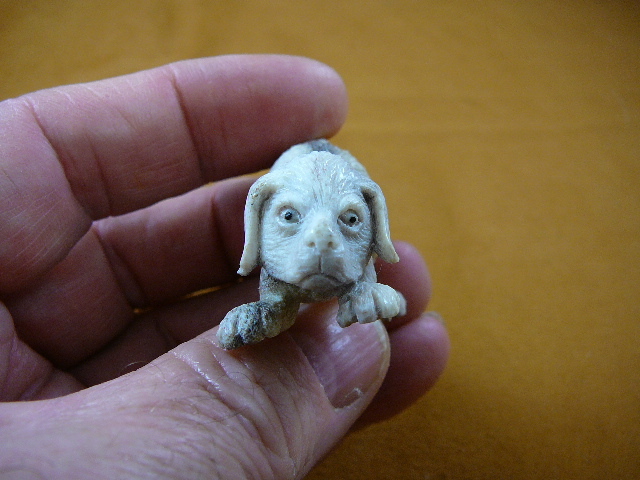 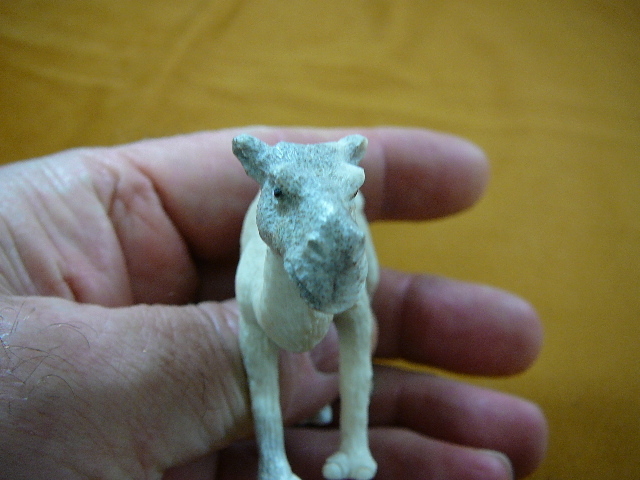 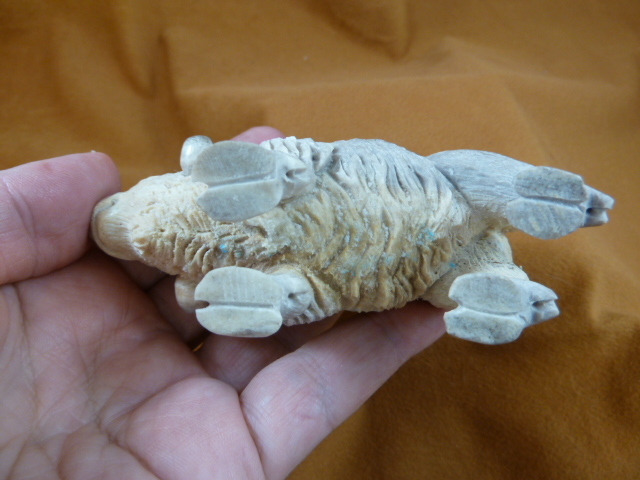 Medium dog, crouching to play (Labrador type of breed), Moose antler, 2" long x 7/8" wide x 1-3/8" tall, note foot pads are detailed. 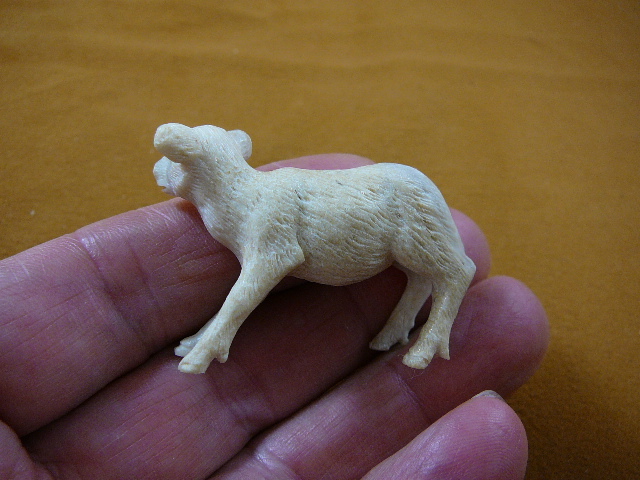 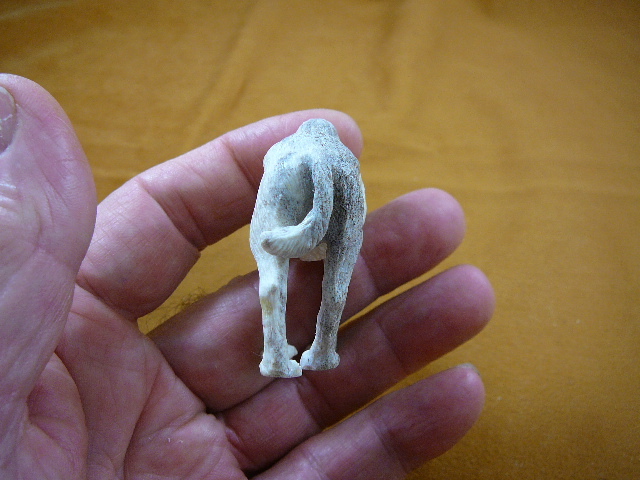 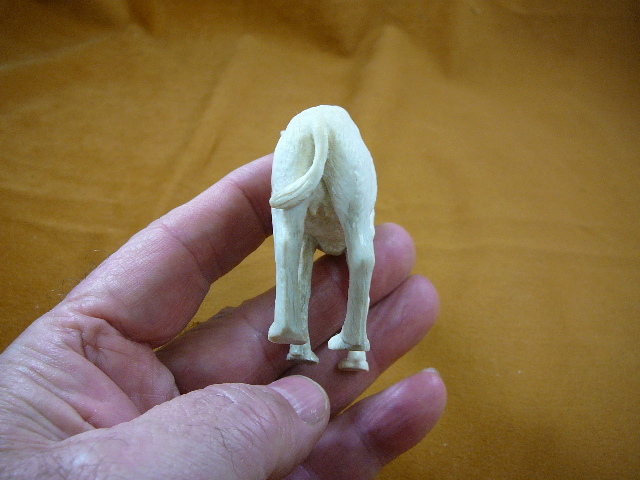 Medium dog, crouching to play (Labrador type of breed), Moose antler, 1-3/4" long x 7/8" wide x 1-1/4" tall, note foot pads are detailed. 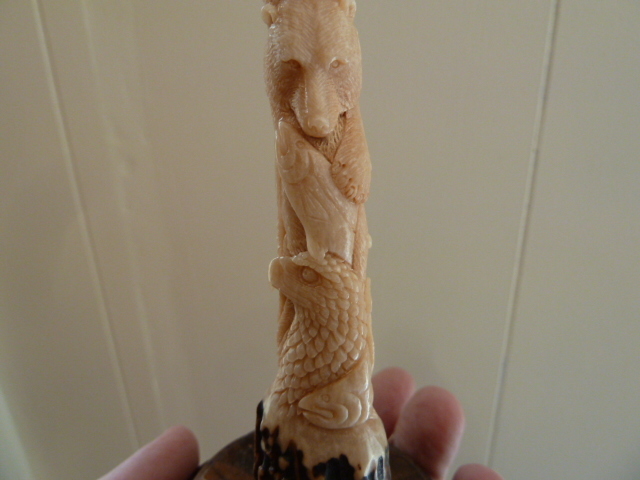 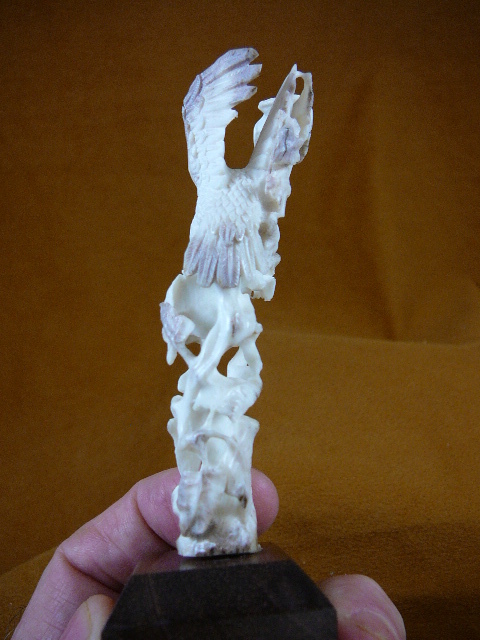 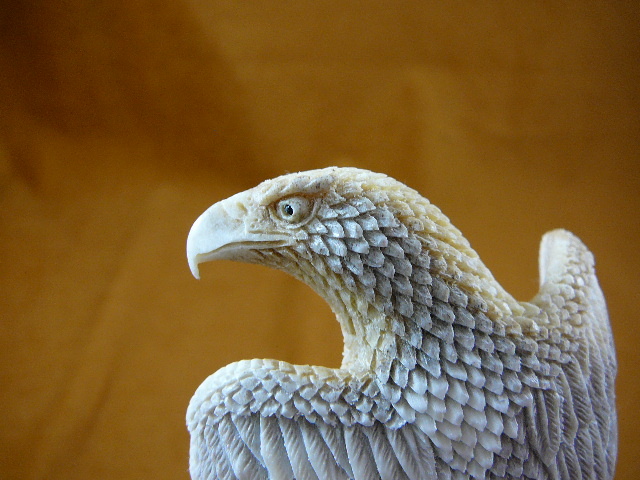 Antler carved totem of eagle head, bear, fish repeated, on wood base. 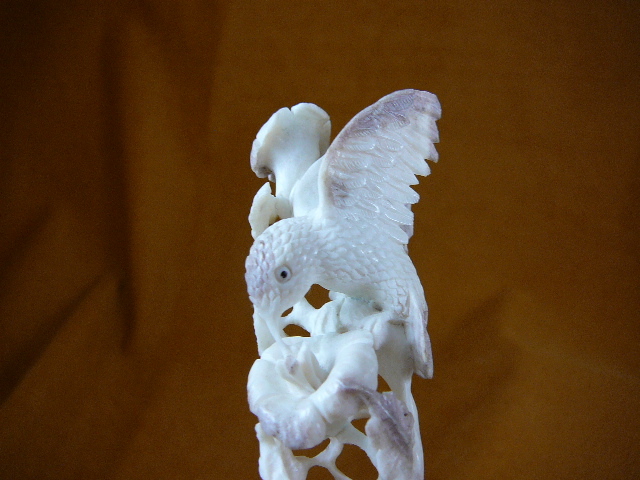 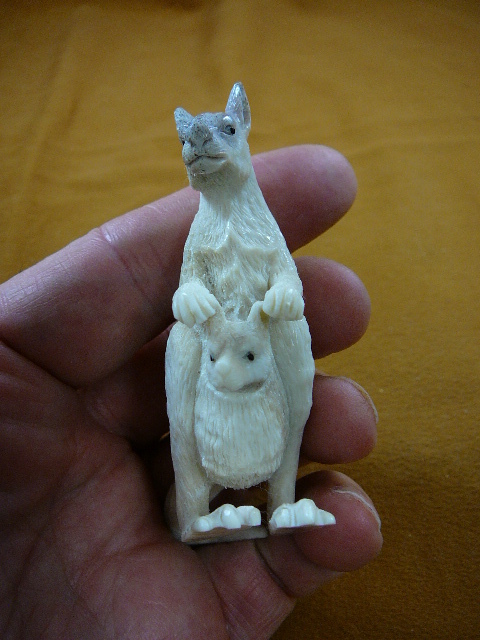 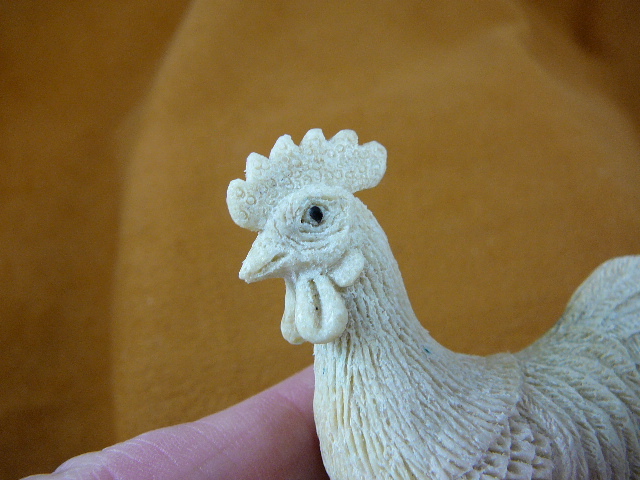 This is a Bali carved item. 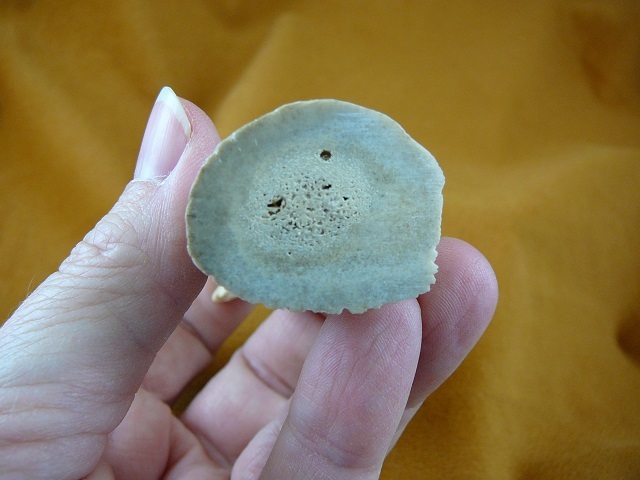 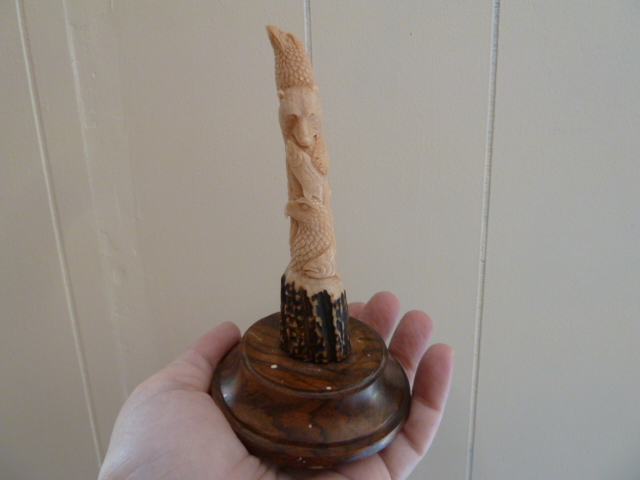 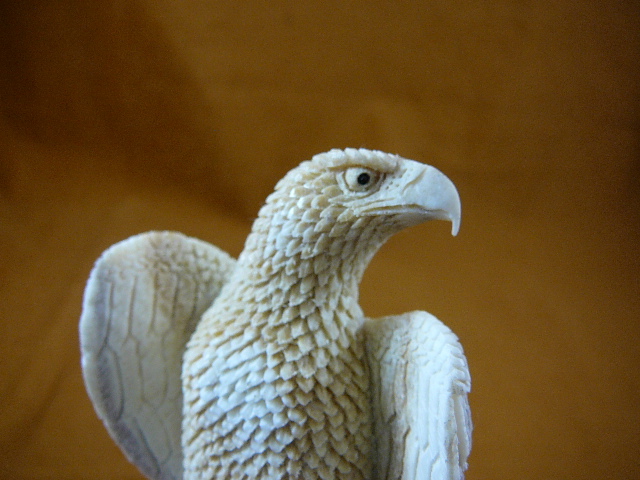 Measures 5-3/4" tall including base x 3" diameter base; totem itself is 7/8" diameter. 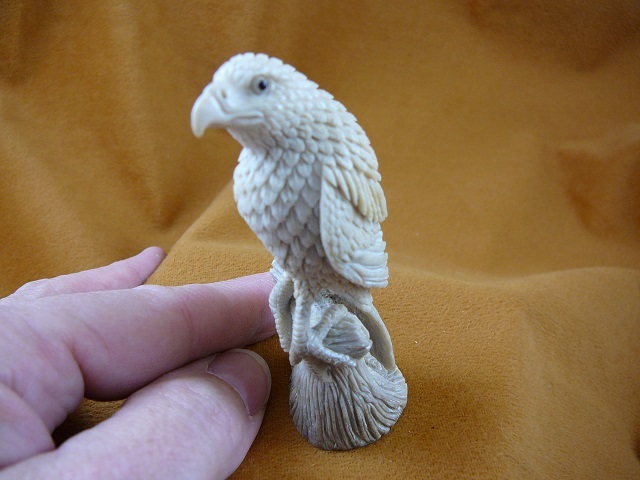 OUTSTANDING, exquisite carving, look at the wrinkled skin, the knobs on his head, the expression. 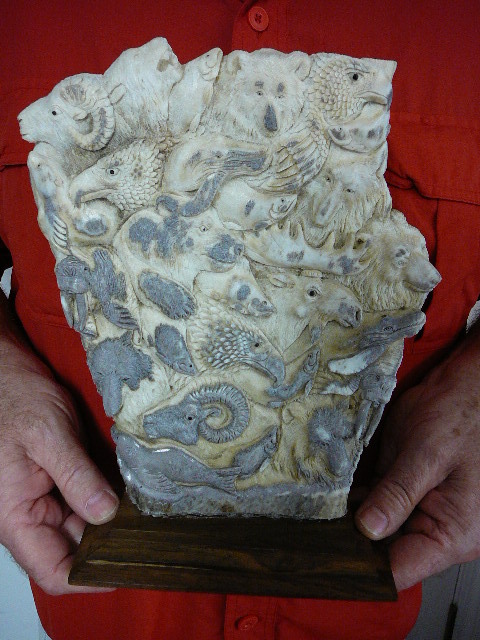 All one piece with “stone” base. 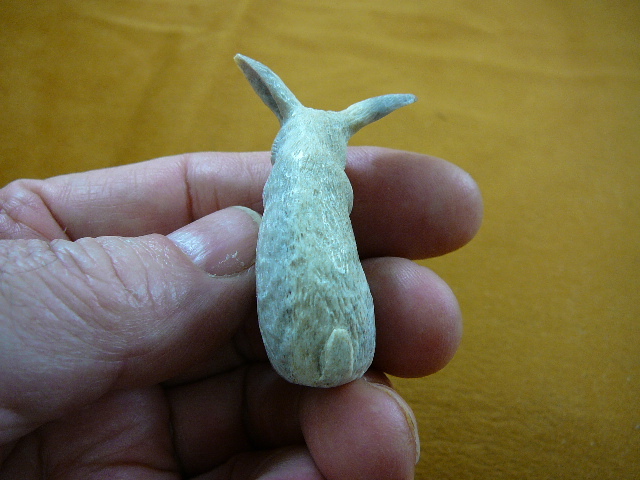 Shed moose antler, 3-3/4” long x 2” wide x 2-7/8” tall. 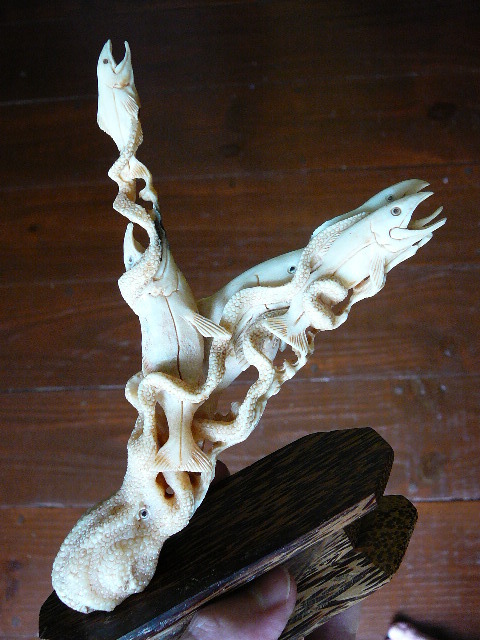 By talented artist Astawa near Ubud, age 38 as of 2016. 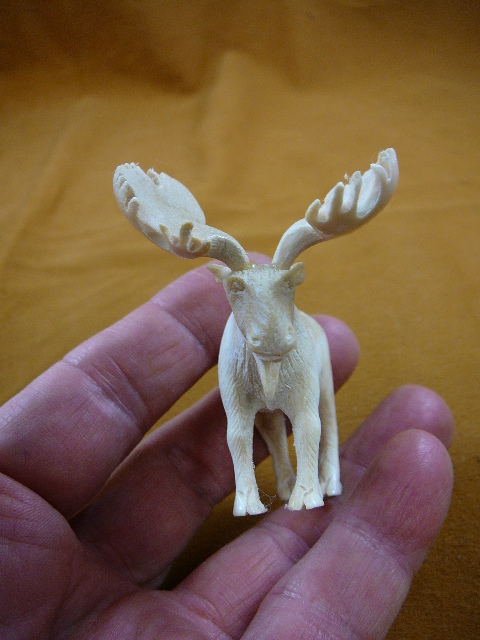 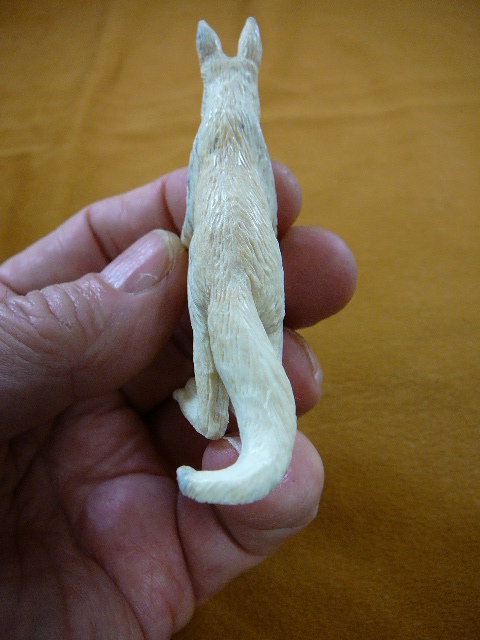 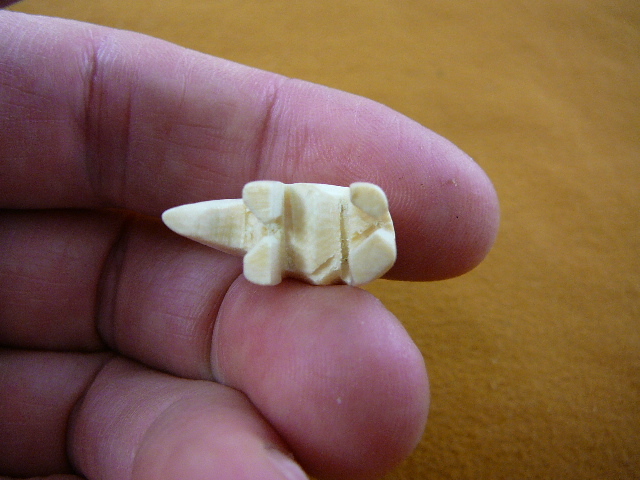 Trunk up, Moose antler, 2-1/4” long x 5/8” wide x 1-5/8” tall. 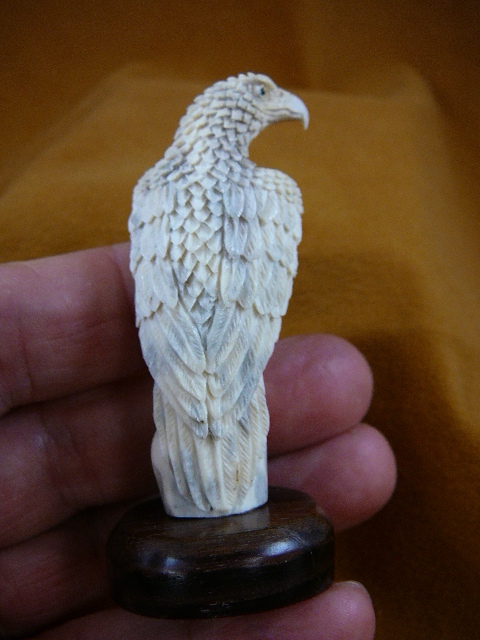 Full carving on base measures 5” tall. 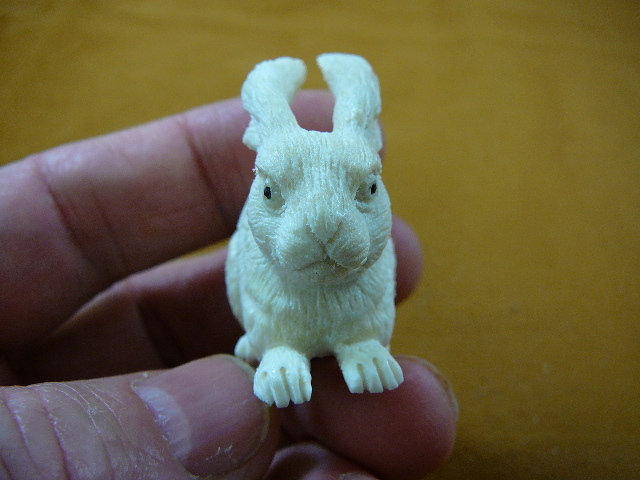 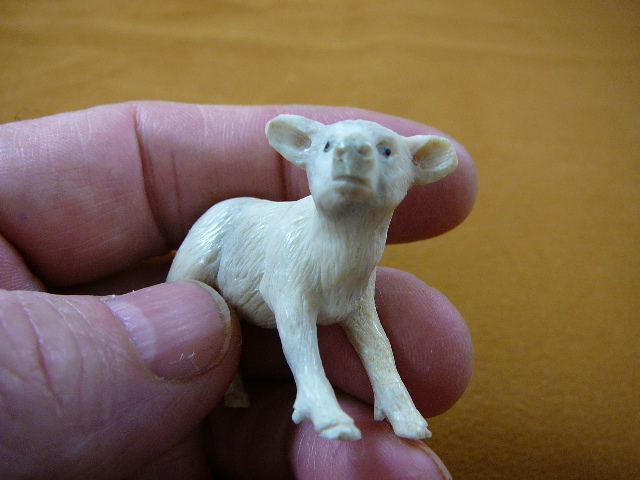 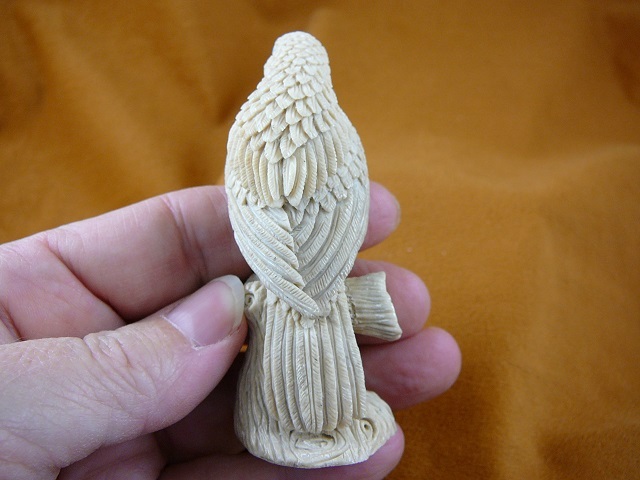 Overall carving plus base measurement: 4-1/2” tall. 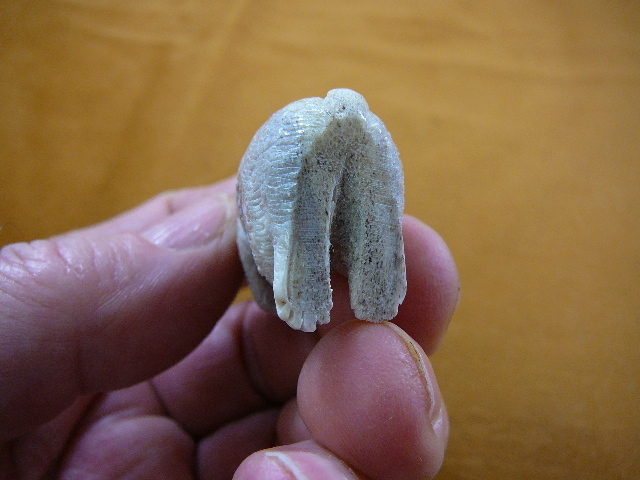 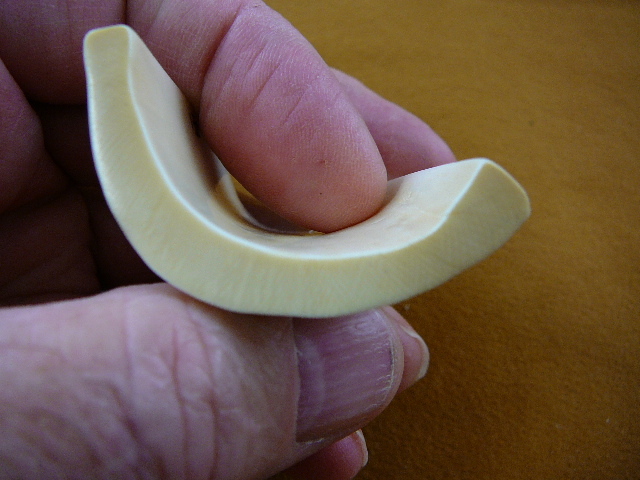 Natural ring of antler left on one end. 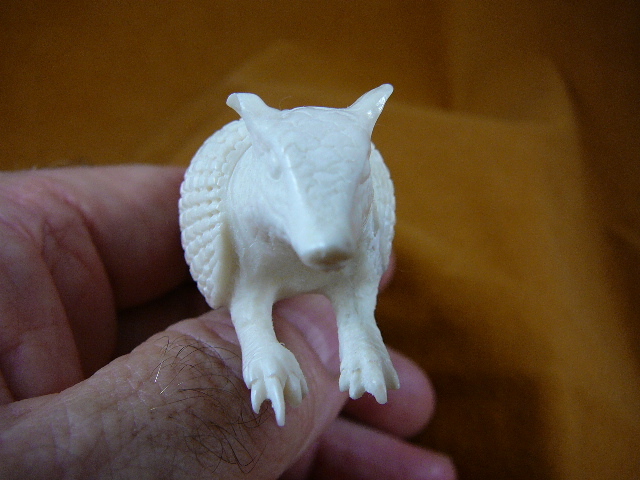 Total measurement is 5” tall. 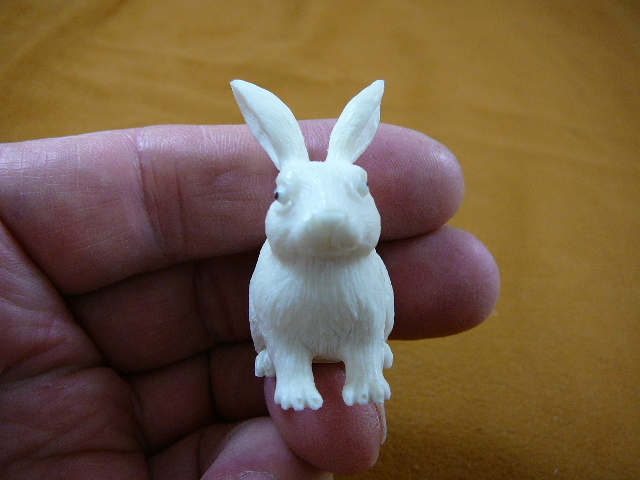 Total measurement is 5-1/8” tall. 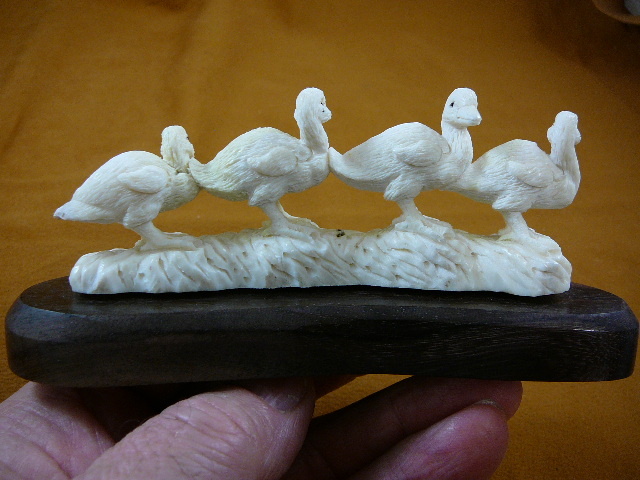 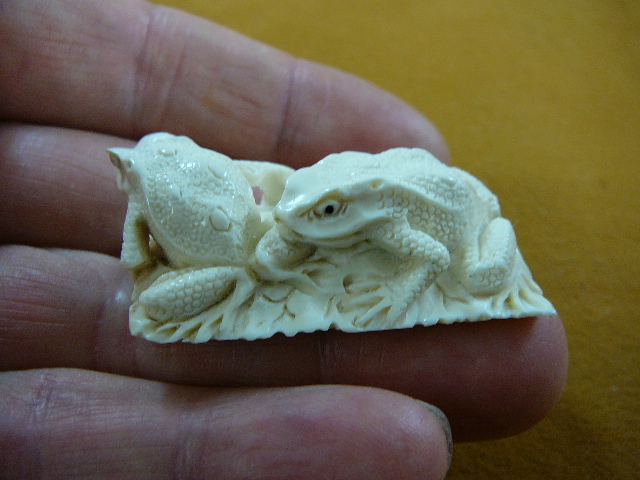 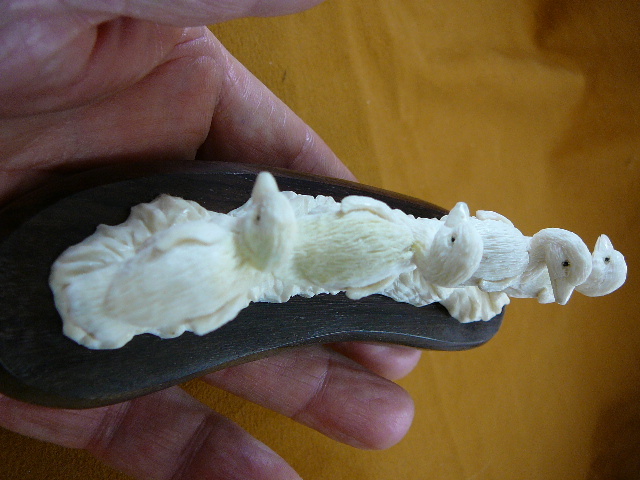 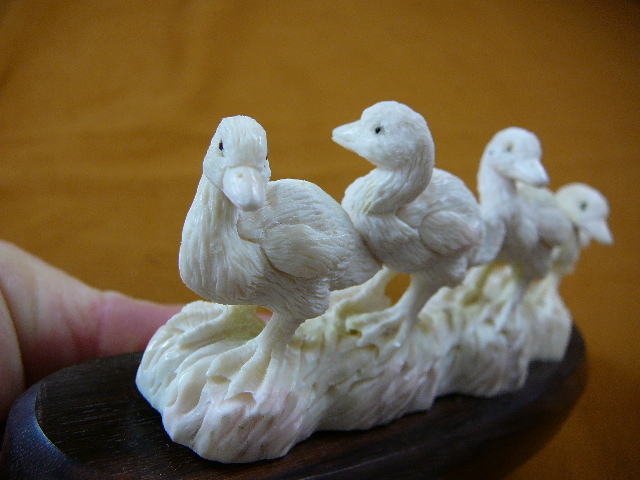 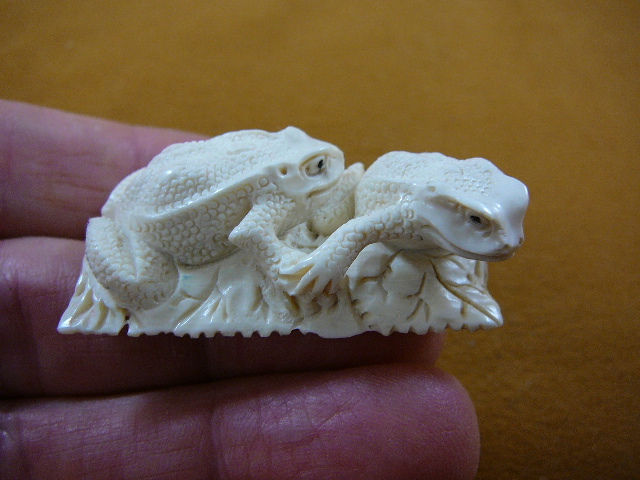 Three frogs and water lilies on a half round of fossil mammoth ivory tusk. 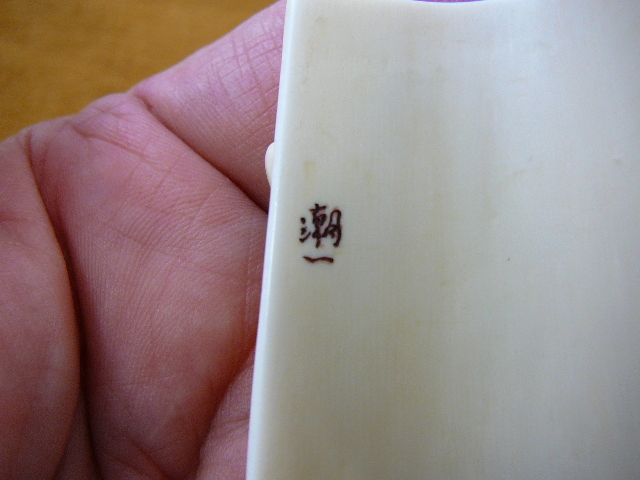 Carved in China, signature in Chinese on reverse. 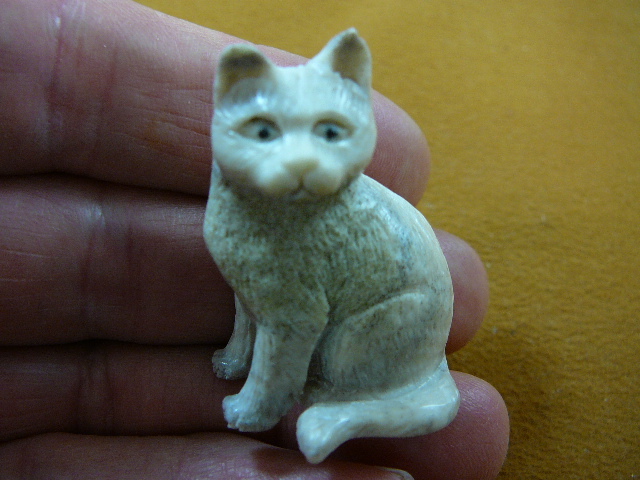 Measures 2" tall x 1-7/8" wide x 7/8" deep. 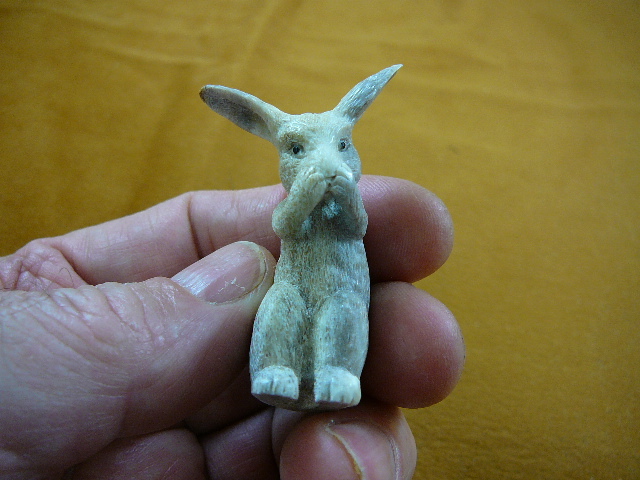 Measure 2" long x 1-1/8" wide x 5/8" tall. 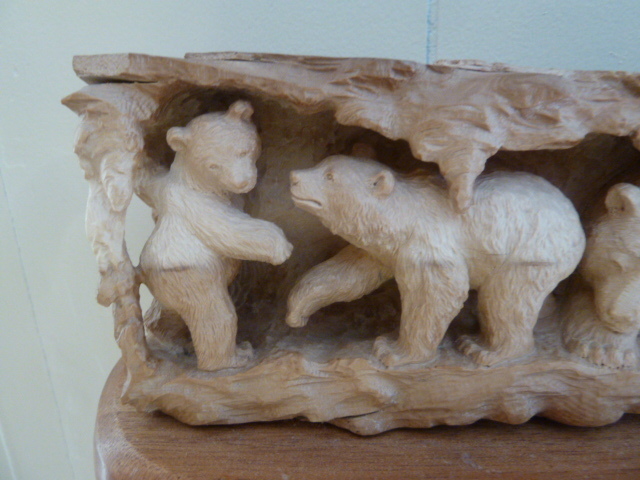 Even the underside of the base is carved. 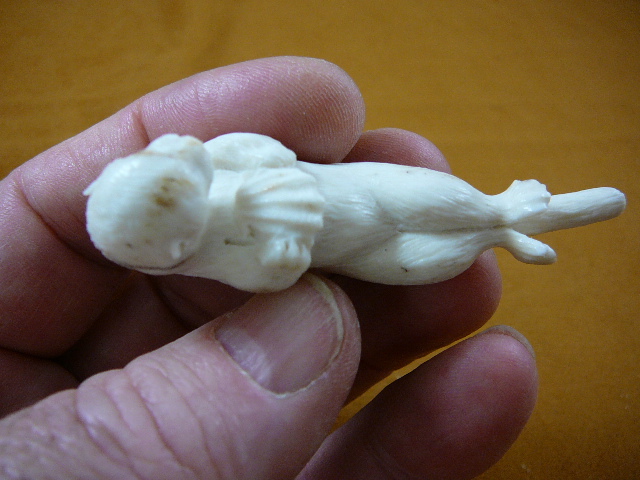 Base is 10-7/8” long x 2-3/8” wide x 2-1/4” tall. 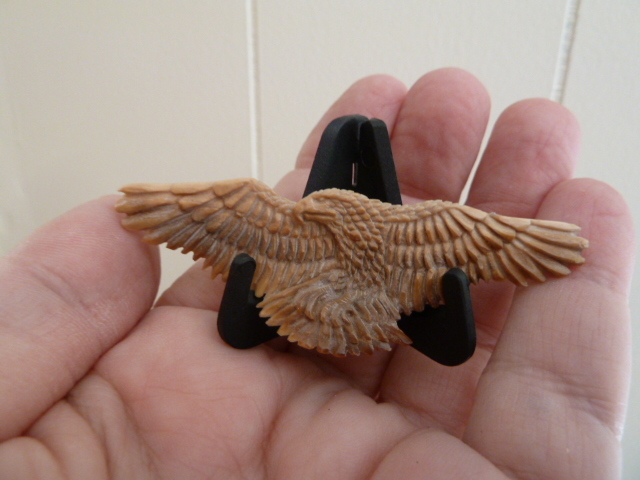 Base is 10-1/4” long x 2” wide x 1-3/4” tall. 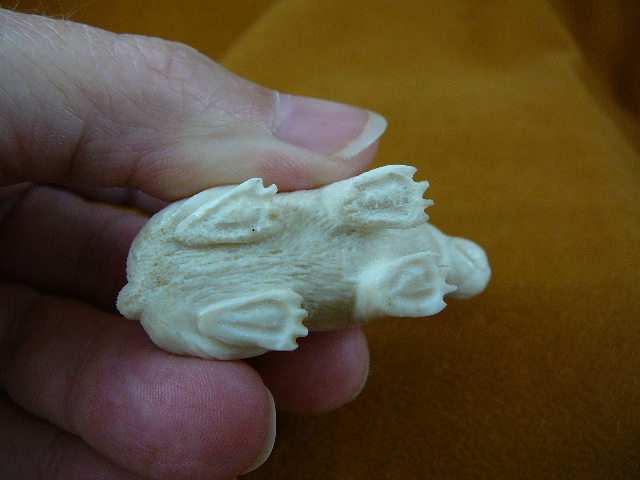 Base is 4-1/2” long x 2-3/8” wide x 2” tall. 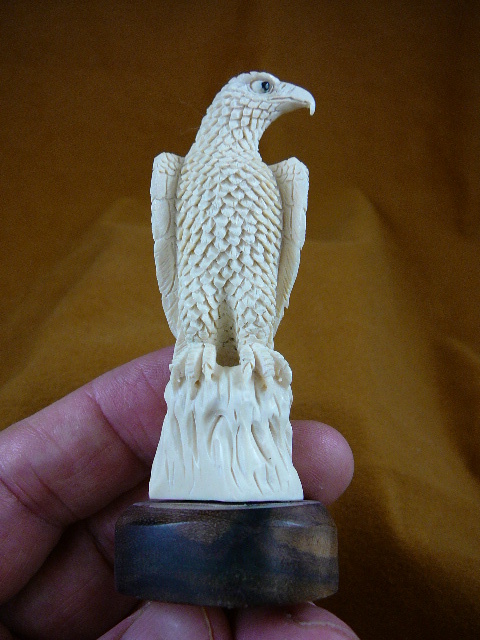 Base is 6-1/8” long x 1-7/8” wide x 2-1/4” tall. 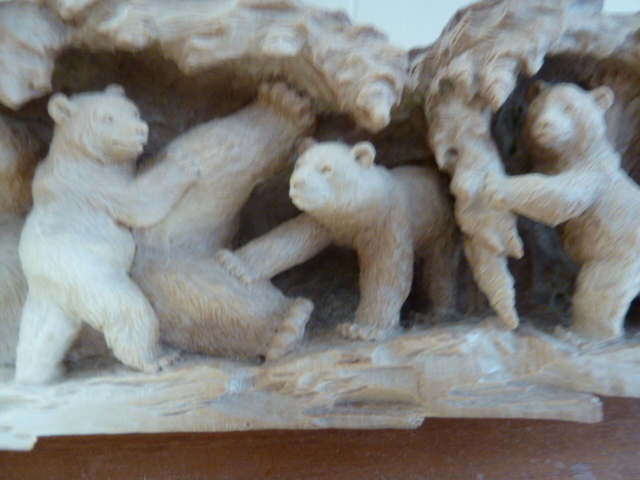 Male lion attacking wild boar, followed by another male and a female lion. 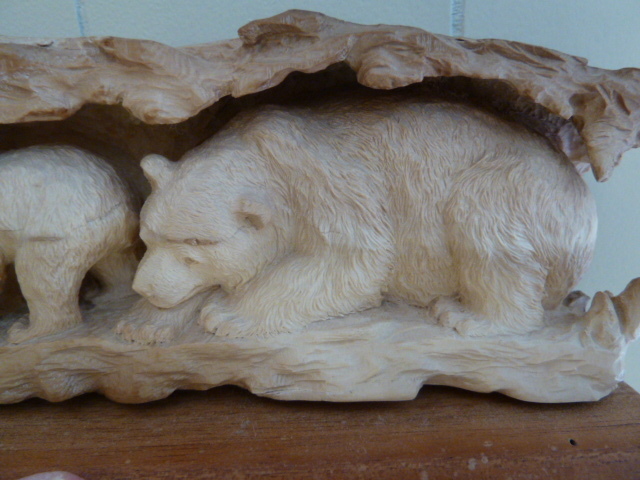 With wood base, measures 13” long x 3” wide x 4-5/8” tall. 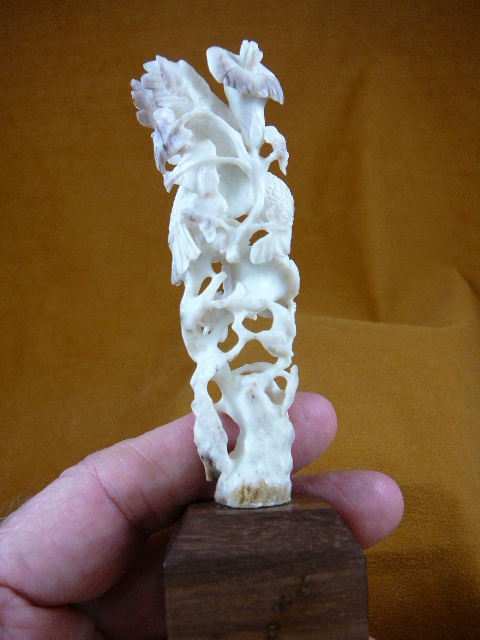 Moose in shed moose antler, torched with a jewelry torch for a natural moose color look. 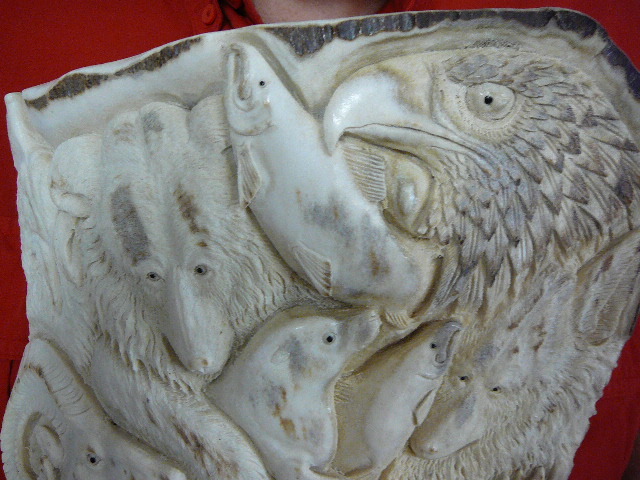 Base is 11” long x 2-1/4” wide x 1-3/4” tall. 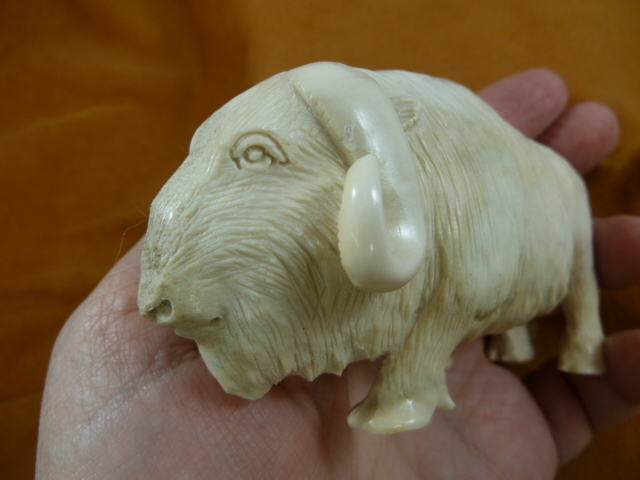 Musk ox, large, Moose antler. 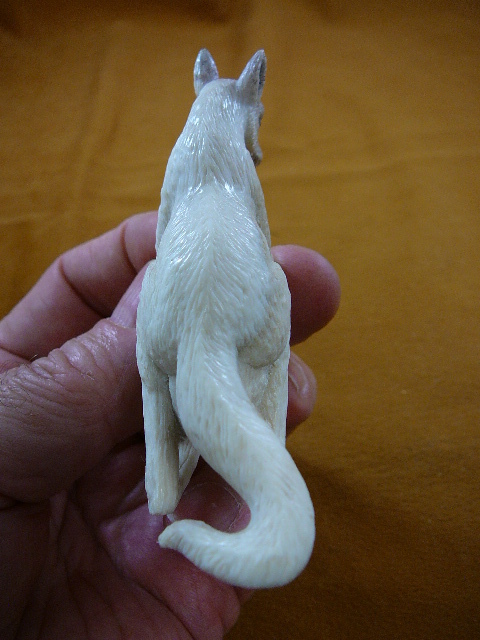 Yes we know it shouldn’t have a long tail! 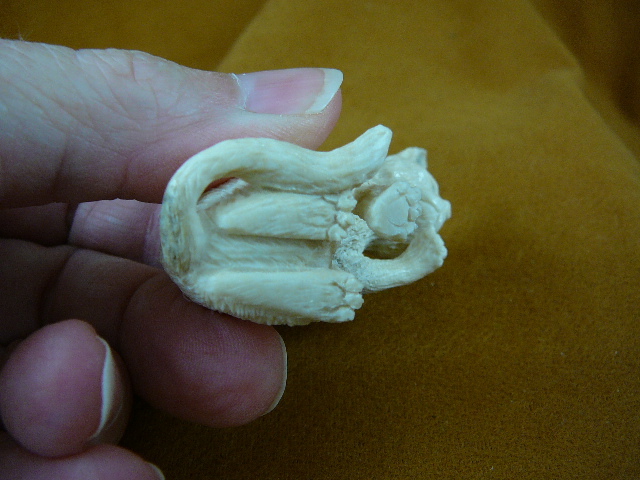 Base is 4-3/4” long x 1-7/8” wide x 1-3/4” tall. 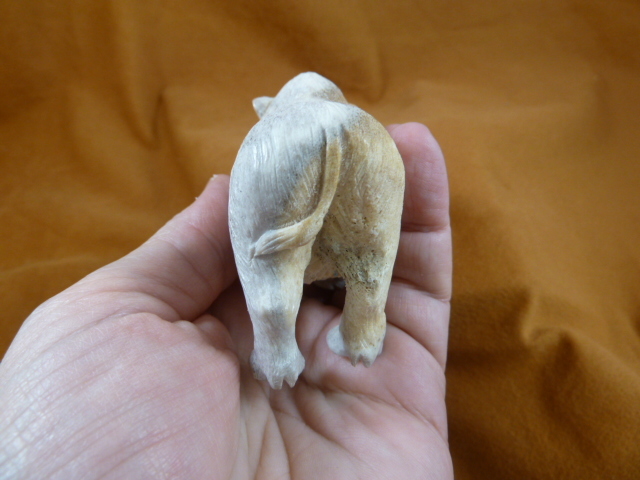 Yes, we know it shouldn’t have a long tail! 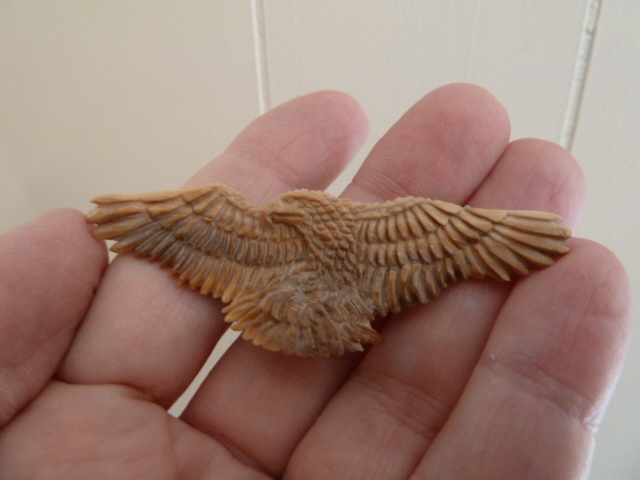 Base is 3-1/4” long x 1-5/8” wide x 1-3/4” tall. 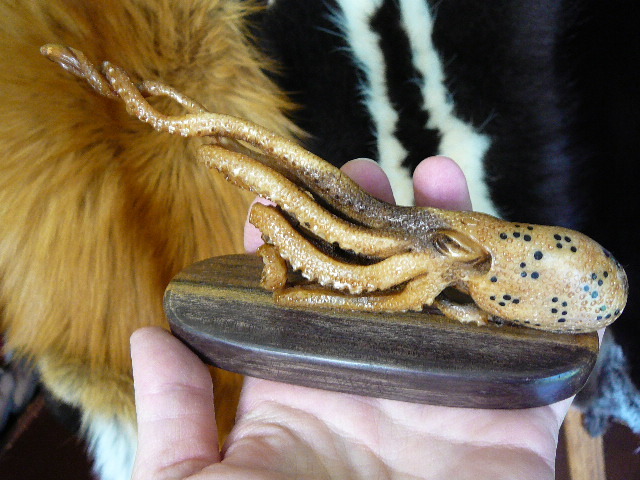 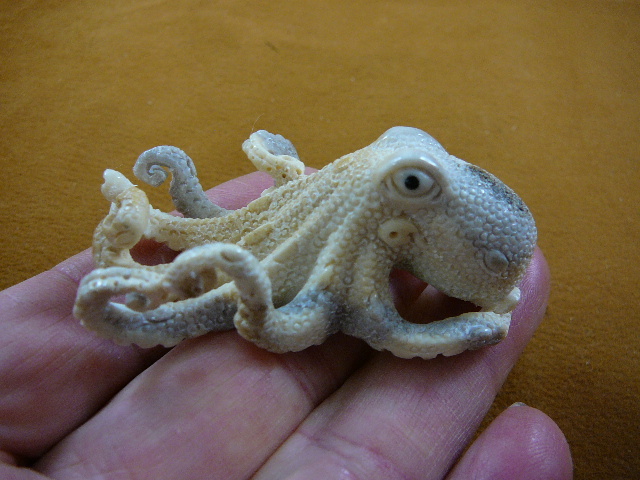 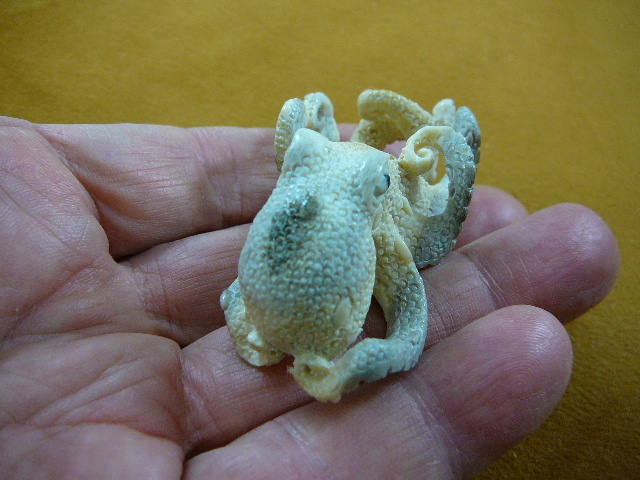 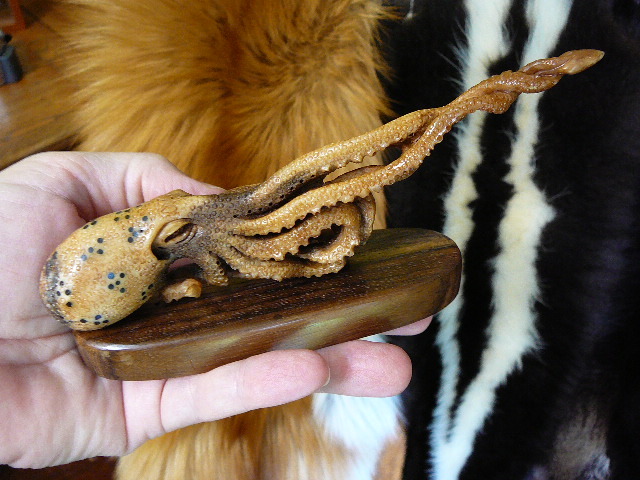 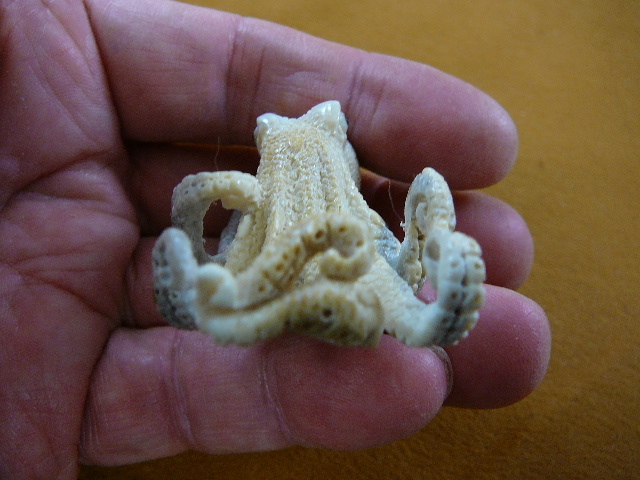 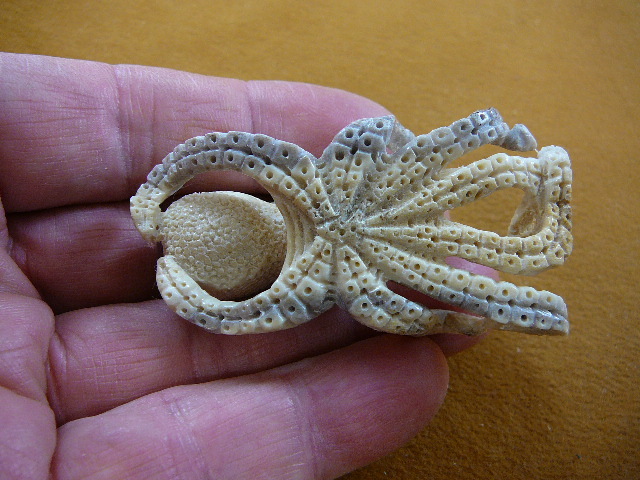 Octopus itself is 6-3/8" long x 1" wide at the head x 2-5/8" tall. 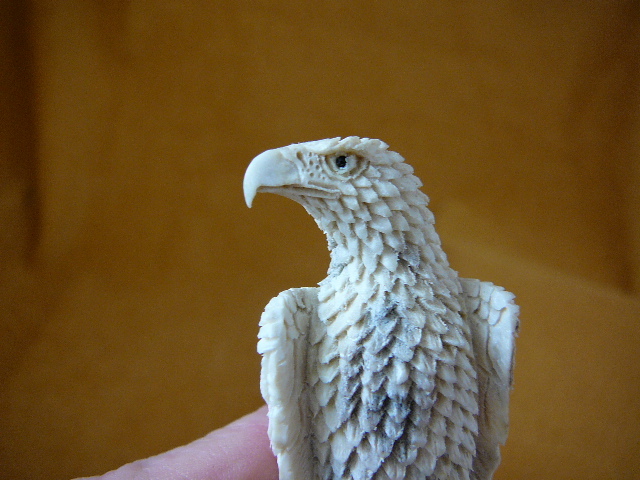 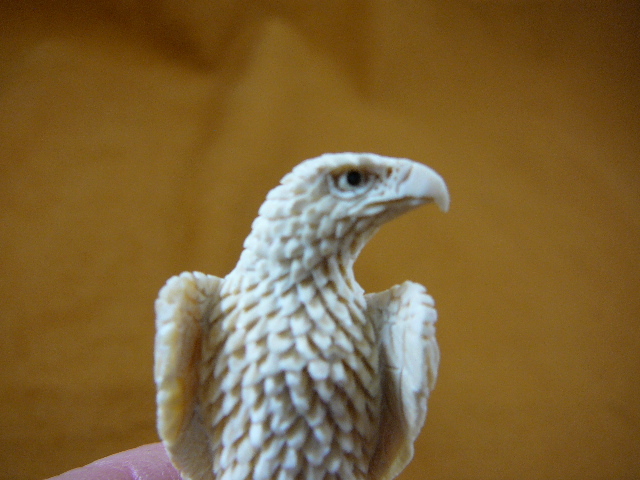 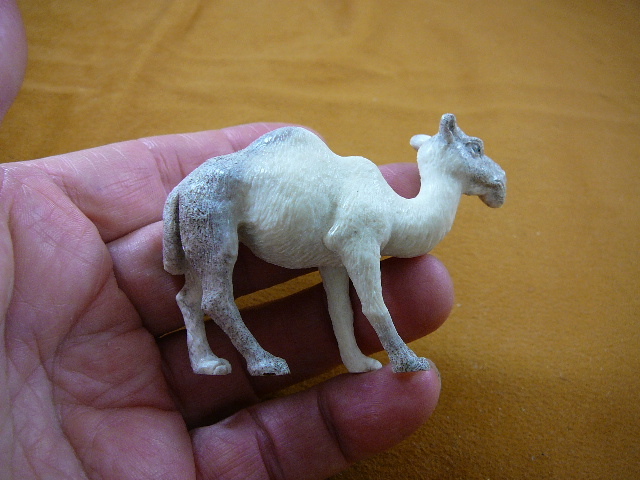 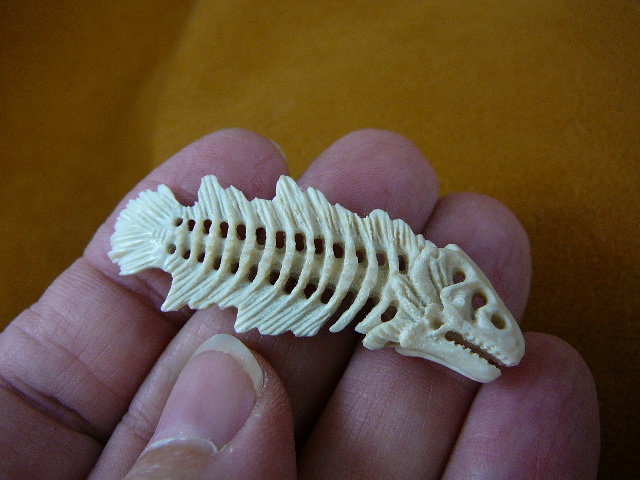 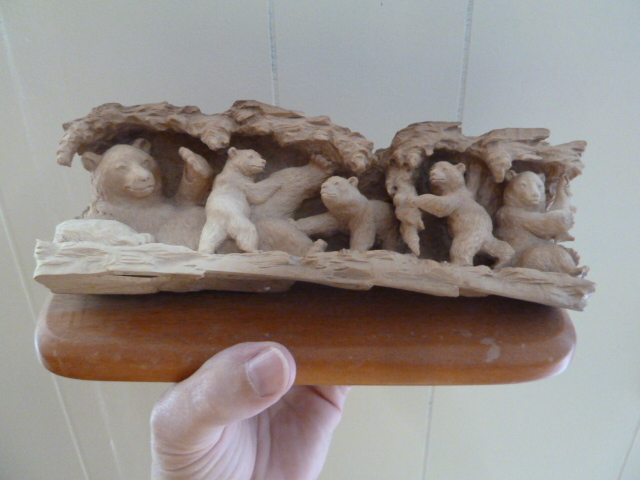 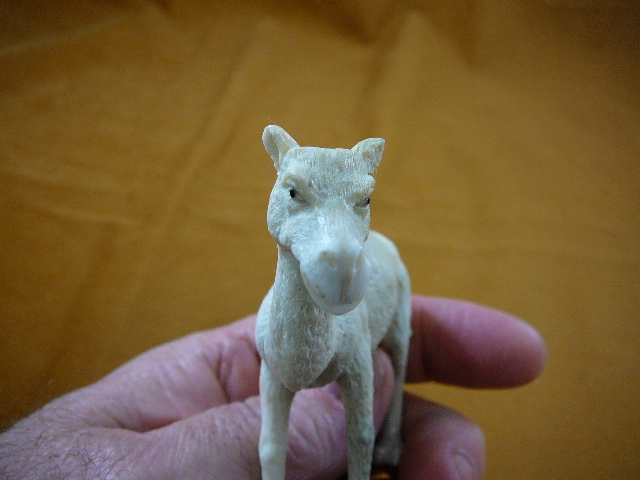 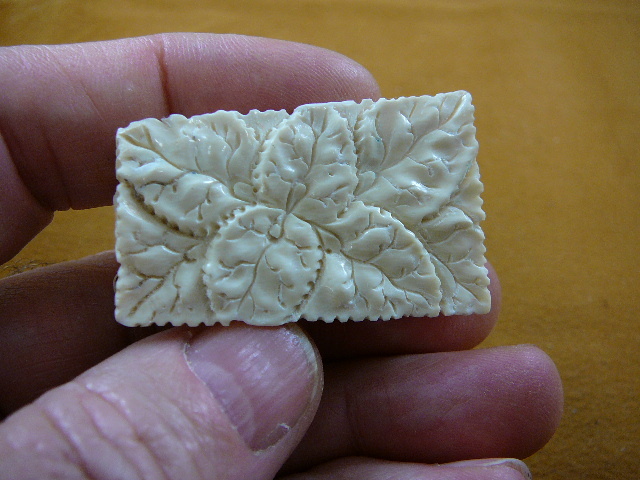 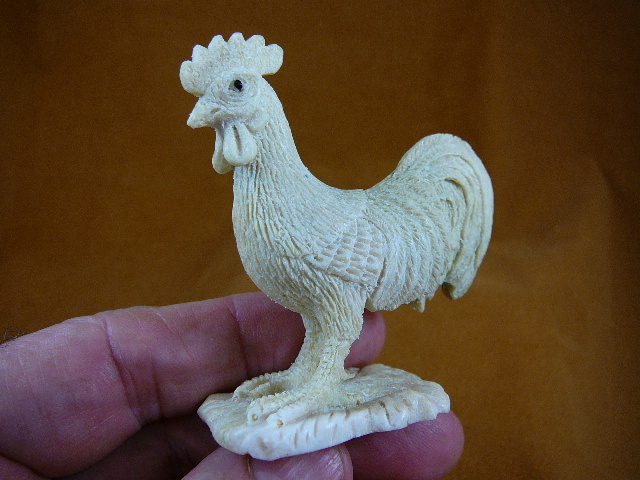 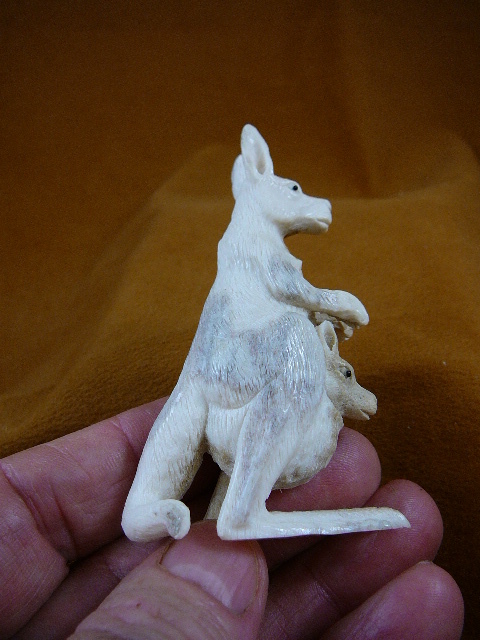 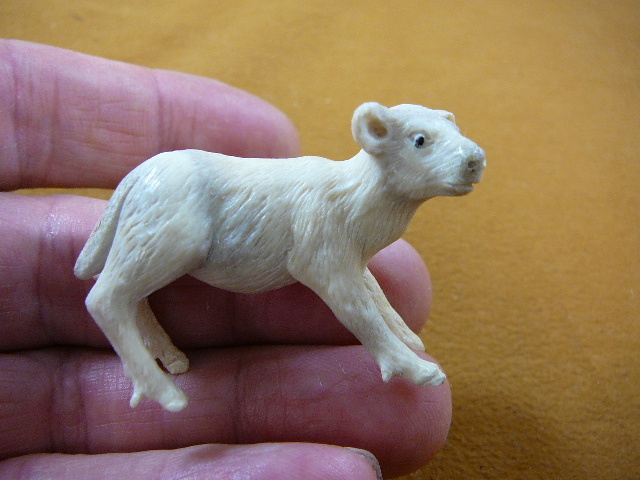 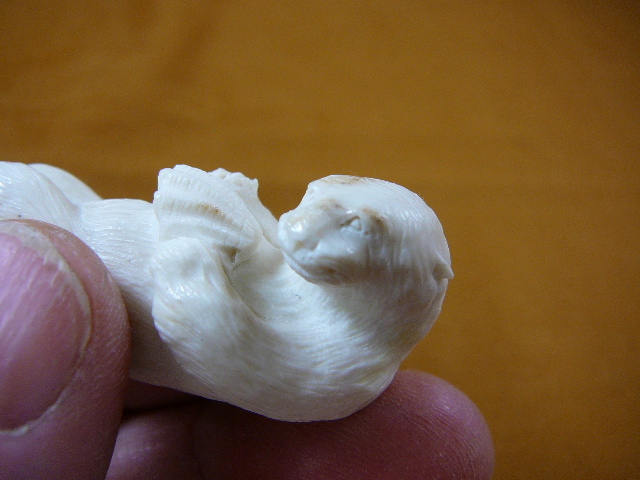 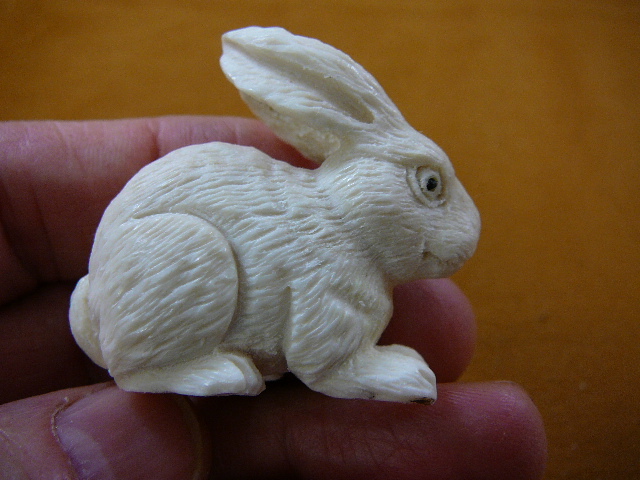 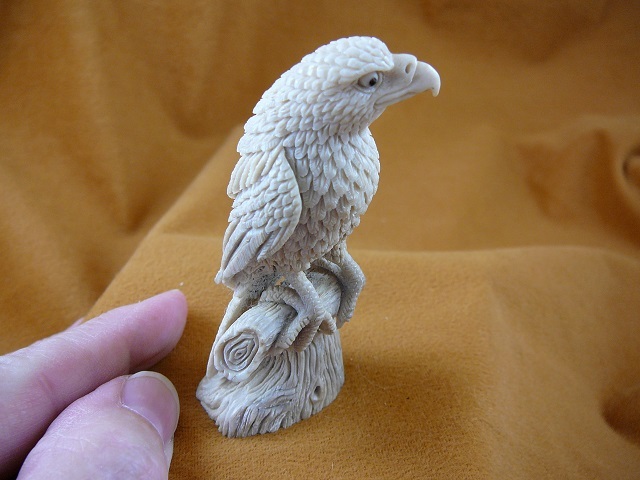 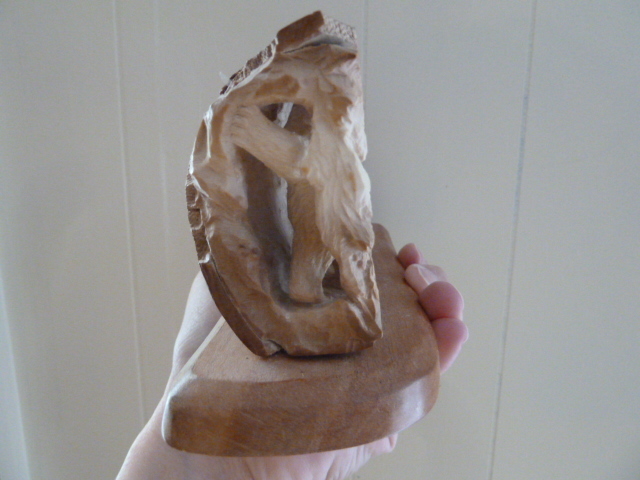 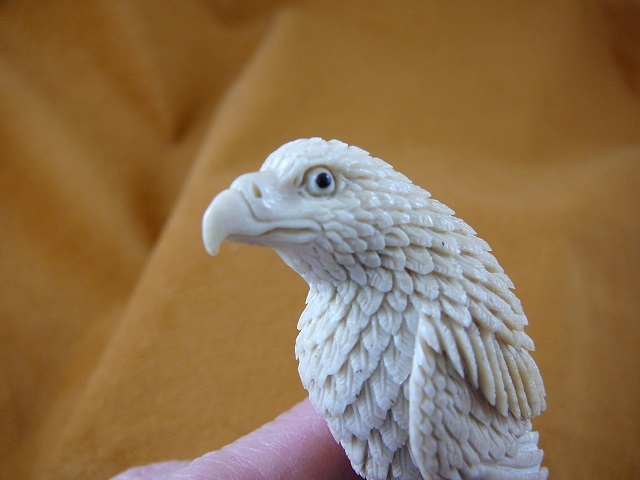 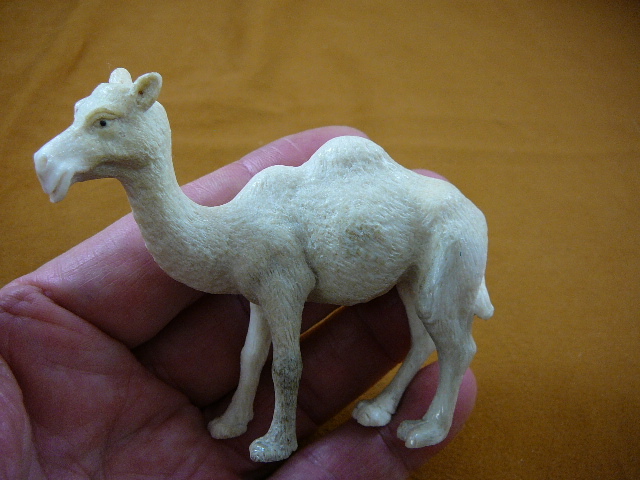 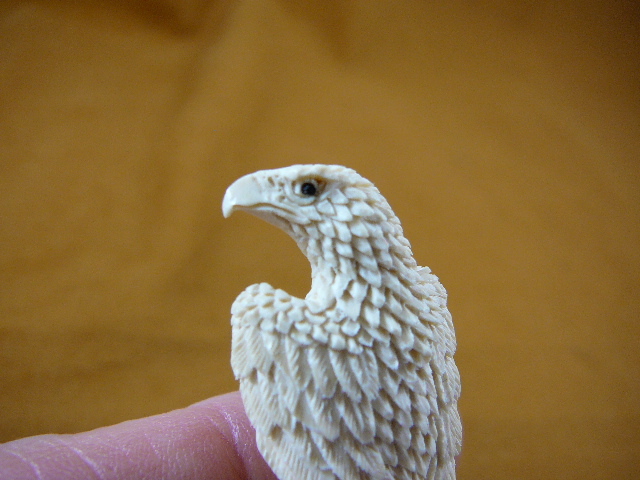 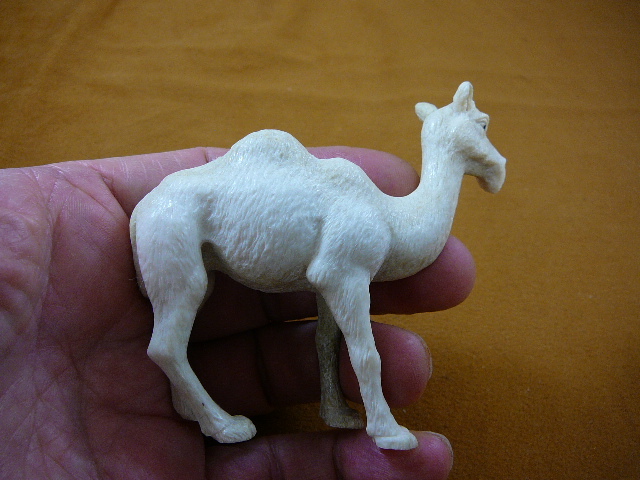 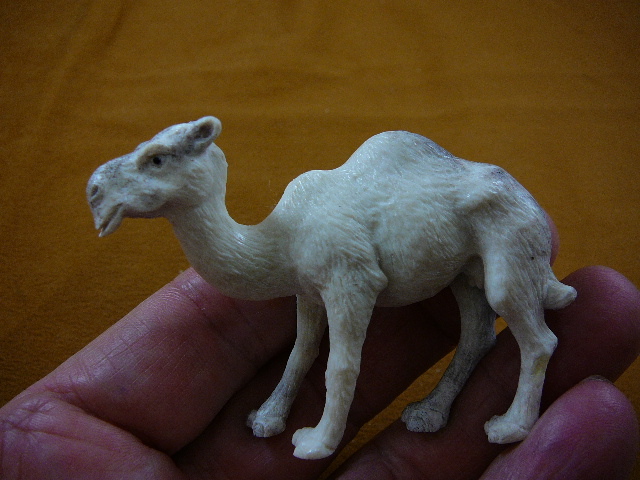 Full carving + base is 7-1/4" tall x 2" wide x 6-1/2" long.